Servo (from lat. 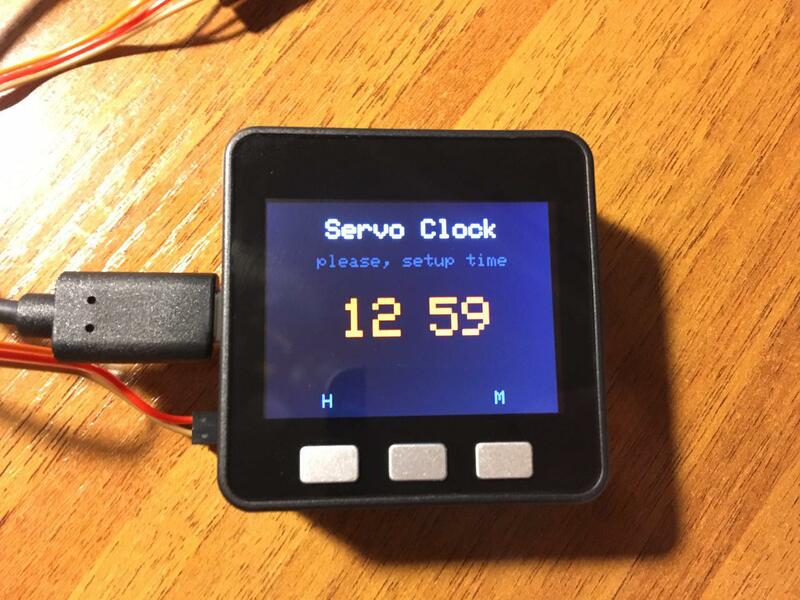 servus — servant, assistant, servant), or servomechanism — mechanical transmission with automatic correction state through internal negative feedback, in accordance with the parameters set from outside. 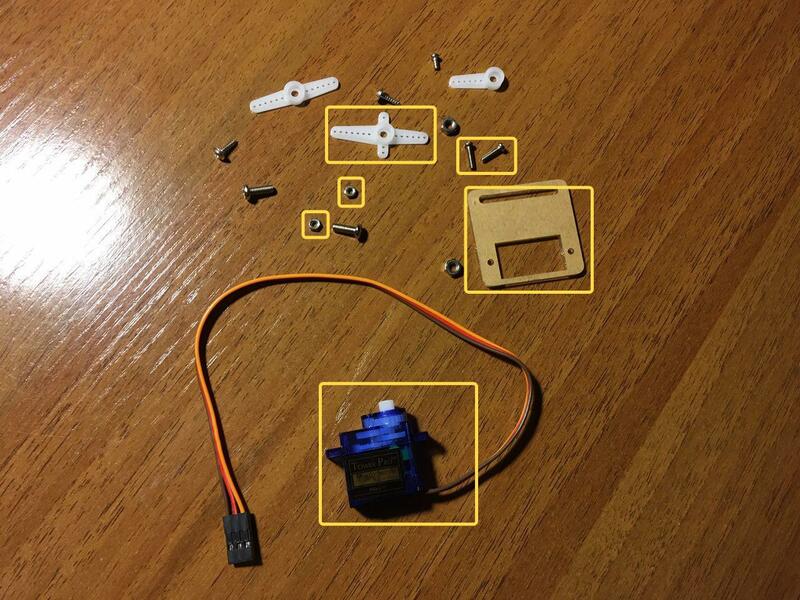 The servo has three wires: + power, - power and data wire. In order to rotate the servo to the desired angle, it is necessary to send the data wire, the pulse duration required, as shown in figure 1. 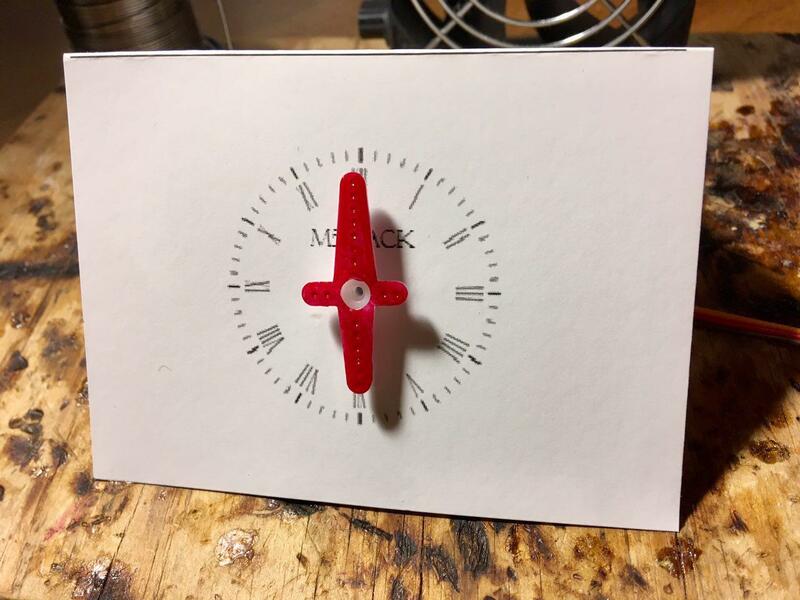 Make an analog clock with the hour hand. The time setting will be done with the integrated buttons and screen M5Stack. Every hour the device will make a sound. Serial port is the slang name of the RS-232 interface, which was massively equipped with personal computers, special-purpose equipment, including printers. The port is called "serial" because the information is transmitted one bit at a time, bit by bit. Ordinary personal computers are equipped with RS-232, and microcontrollers and M5STACK including uses TTL. RS-232 uses a voltage between -3 and -25 V to transmit "0" and +3 To +25 V to transmit "1". 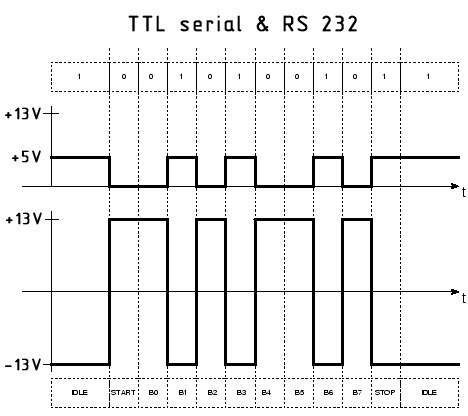 unlike RS-232, TTL uses a voltage close to 0 V to transmit "0" and 3.3 V or 5V to transmit "1" to transmit the operating voltage of the integrated circuit (Fig. 2). 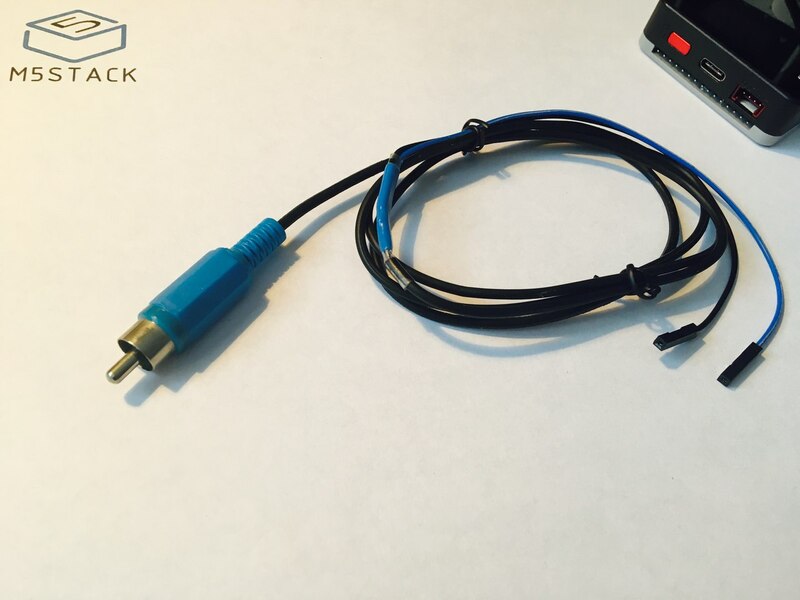 To communicate through the m5stack serial port are used the digital I/o ports R0, R2 (RX) and T0, T2 (TX) (Fig. 3) and also a USB port. It is important to keep in mind that if you are using functions to work with a serial port, you cannot use ports 0 and 1 for other purposes at the same time. colored wires from the standard set. 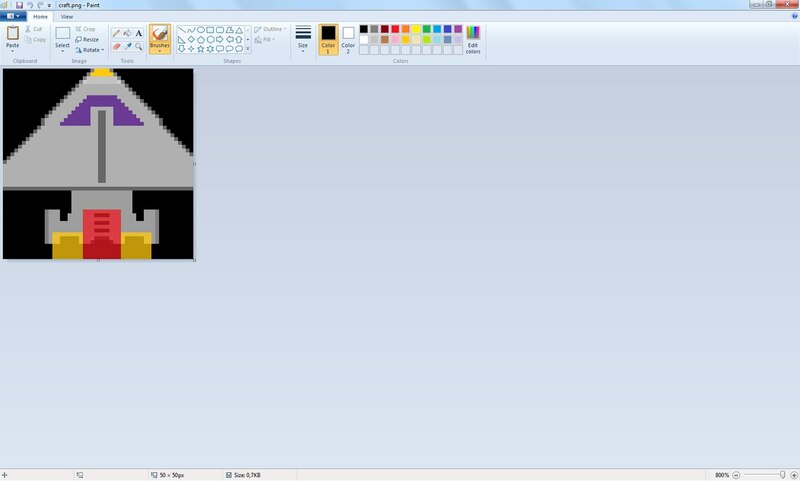 Let's draw the game logo that will appear on the device display when the game starts. 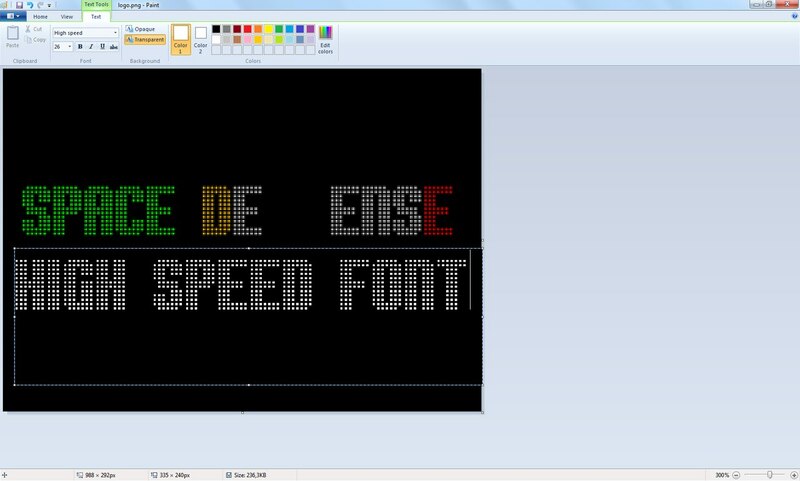 To do this, use any editor, such as MS Office Word and Paint (Fig. 4). 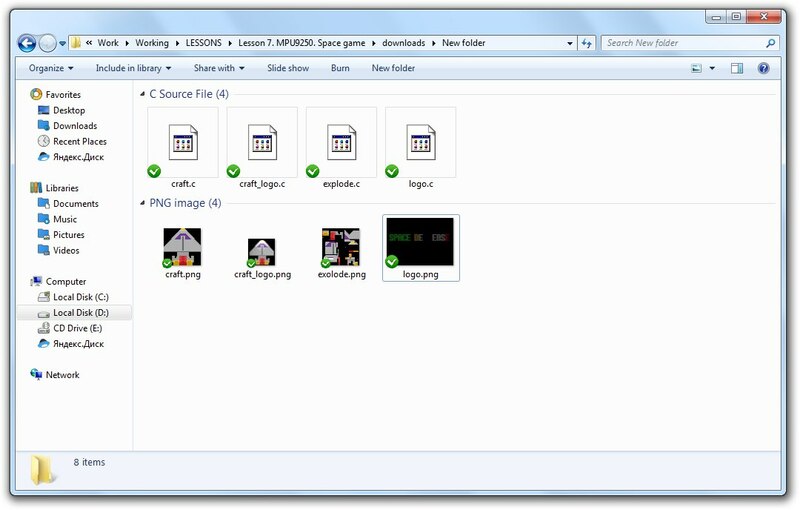 Next, use the app from lesson 1.2.1 http://forum.m5stack.com/topic/49/lesson-1-2-1-lcd-how-to-create-image-array convert the image into an array of pixels and get the logo file.c, which will connect to the sketch. According to the rules of the game, a deck containing only 36 cards is used. 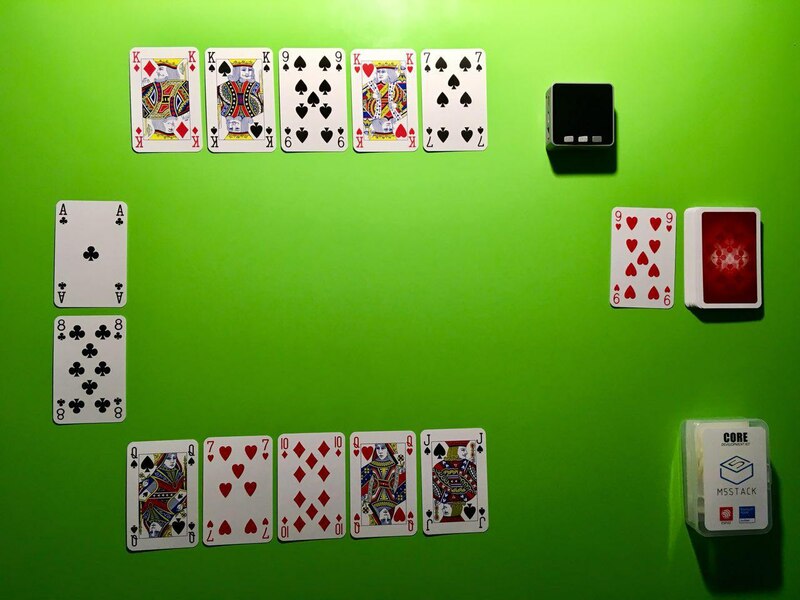 6 cards are issued to each player. 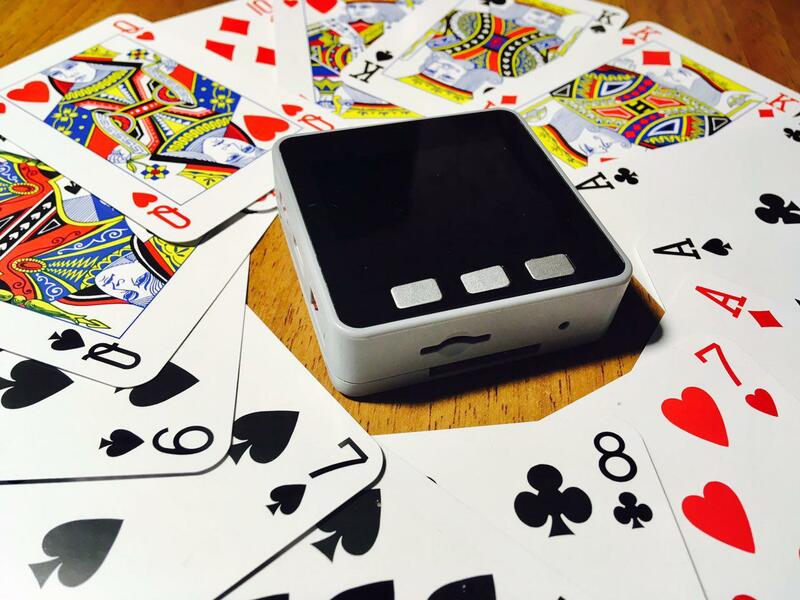 The playing field is designed for 12 cards. 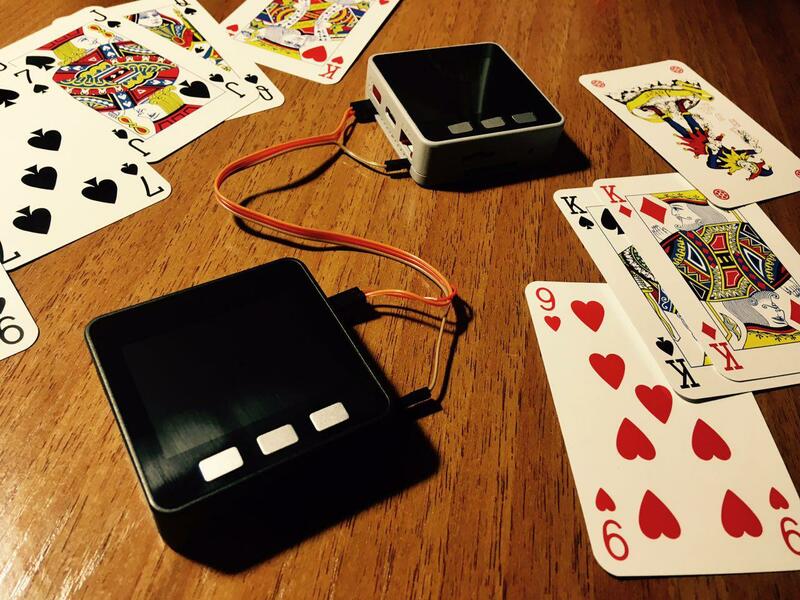 The player can take 10 cards, and then lose. In the game the card has its value and suit, for example 7. In the program, the card has its place: (in the hands of the player - the player's field; in the playing field; in the used deck; in the unused deck) and purpose: free card, inaccessible card, trump card, the player's card, the opponent's card. 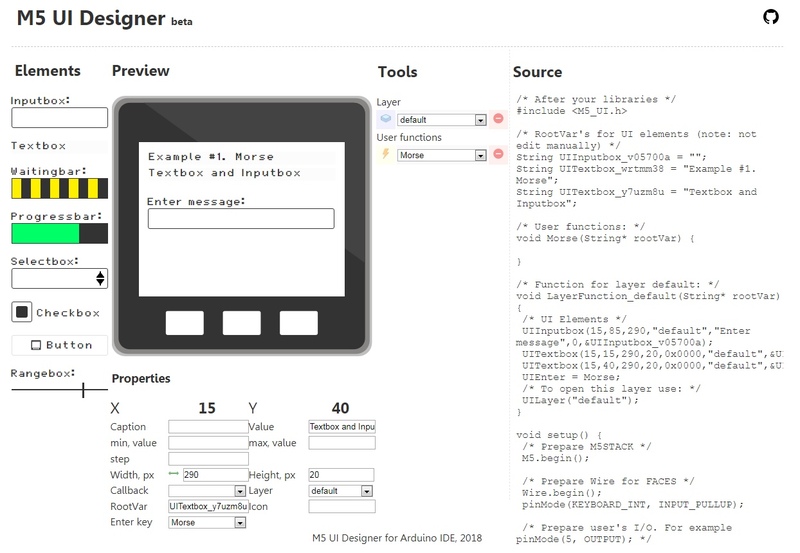 Let's make a structure that contains parameter sequence numbers. 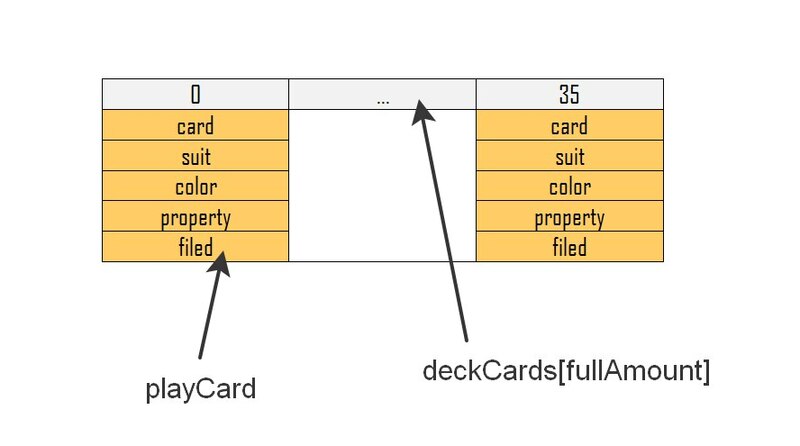 A deck of cards is an array of structures (Fig. 5). 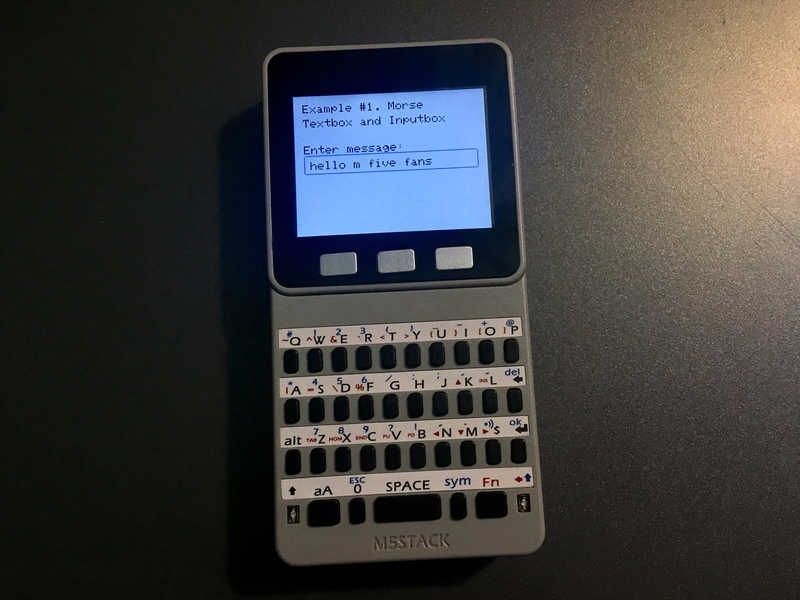 Because of excellent standard functions for working with the built-in display from the library M5STACK, drawing cards will take a fraction of seconds and almost does not take up the memory of the device. 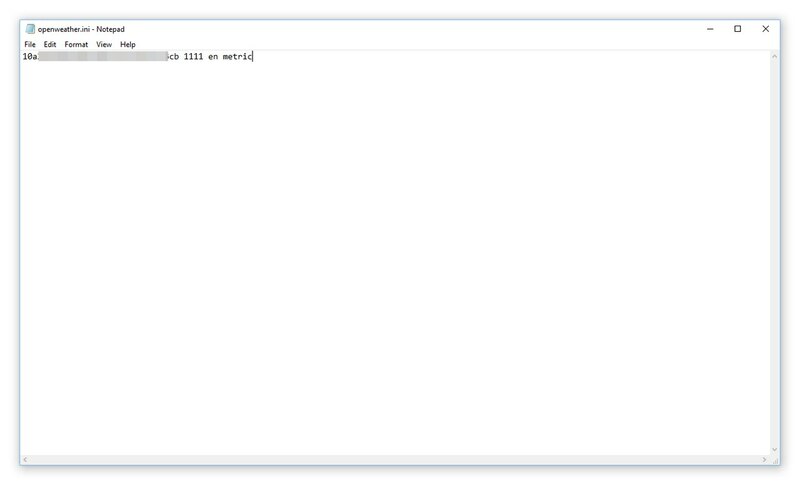 Life hack for Windows users: try to go to any text editor and hold down the Alt key on the keyboard and type one of the digits from 3 to 6, then release the pressed keys. 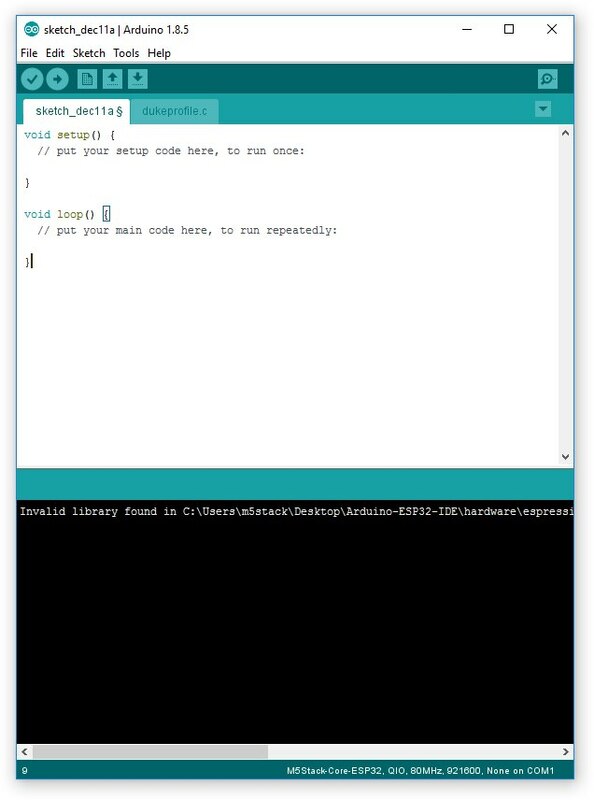 The send string function appends a newline character to the end of the string received as an argument and sends it to the serial port. Then trying to take a string containing a symbol of the end of data transfer. If the character has come, the function will return true otherwise false. 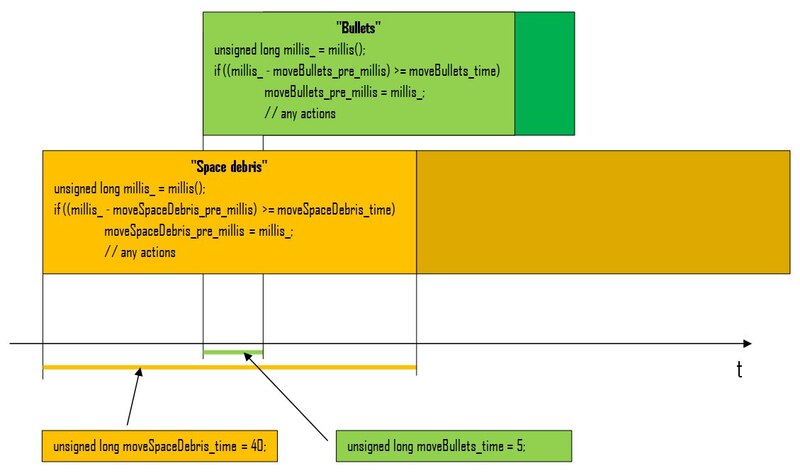 The receive string function attempts to accept the string during timeout (3000 milliseconds), clearing the garbage from the beginning to the character of the beginning of the package. In case of failure, returns an empty string. Make it so that any information transmitted between the devices were Packed in special packages (Fig. 6). Write a function that accepts, decompresses, and executes packages. And also write an auxiliary function (parseString), which will allow to extract a certain portion of the string enclosed between special characters separators (similar to the Split method of JS). 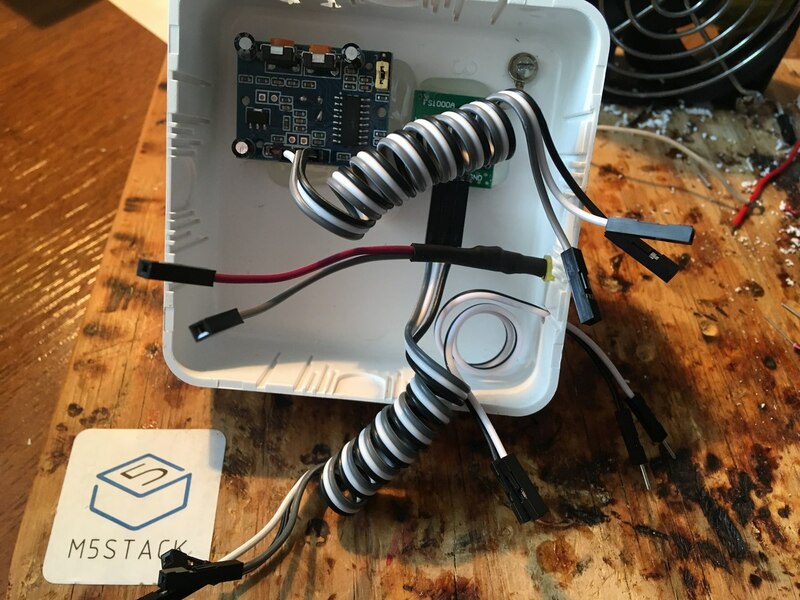 When you turn on the device and connect the cable, each of the devices can withstand a random time interval, while listening to incoming packets, and sends the package " I'm here!" (rice. 7). By default, both devices are the first players. The device that first receives the message " I'm here!" immediately appoints himself the number 2 player. str += (char)0x32; // type "player id selector"
str += (char)0x31; // type "card transfer flag"
In fact, the synchronization function is key in this project. The purpose of the synchronization function is to respond to the actions of players and the exchange of game information. 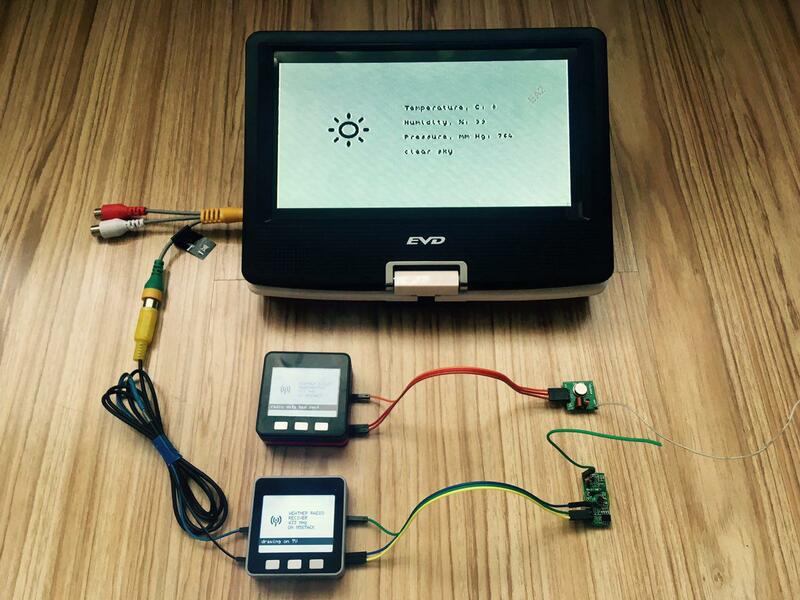 The function is called in manual and automatic mode of the loop(). 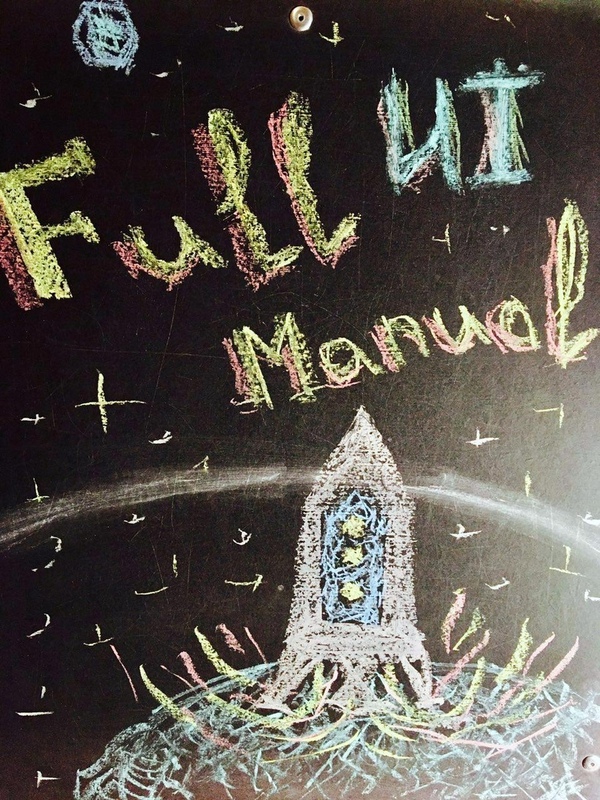 When the player's turn feature works in manual mode and is executed only after the player's actions. 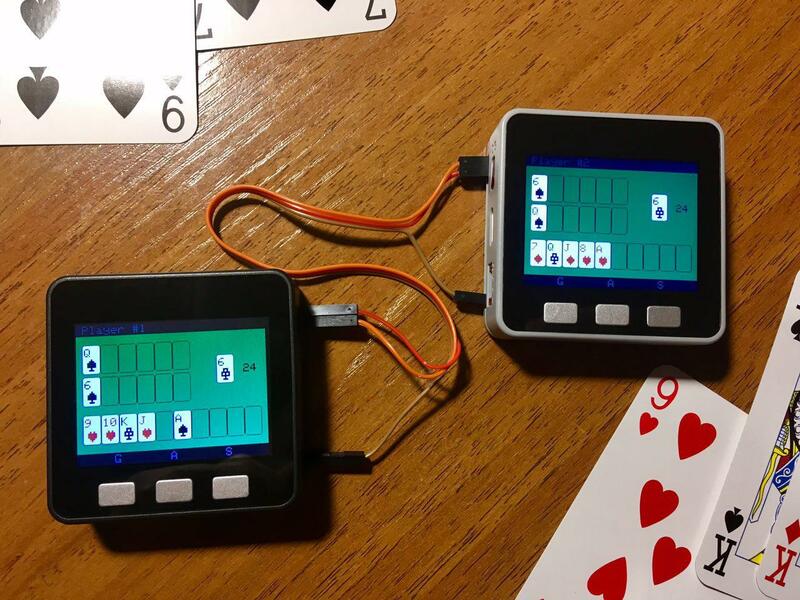 At the same time, the same function works automatically on the opponent's device. The whoWin () function returns the number of the player who won or -1 if no one won. 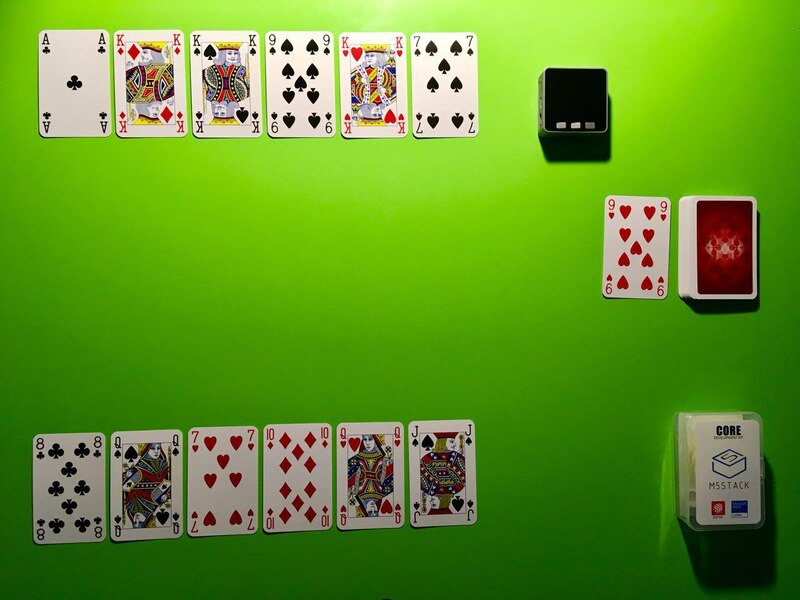 According to the rules of the game it is believed that if the player does not have a single card, he won. If the player has 10 (playerFieldAmount) and more cards, he lost. 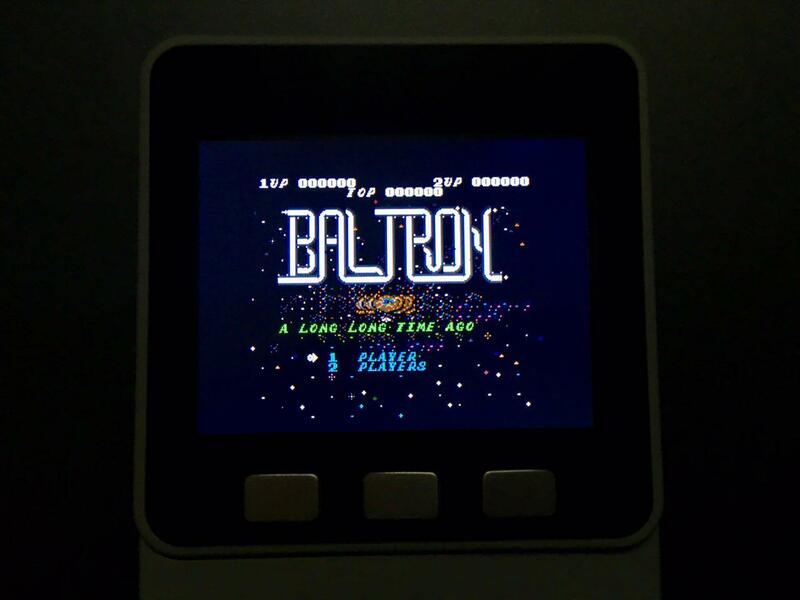 Note: this is my first game project, so the code is currently in beta that may contain bugs and errors. Thank you for understanding! 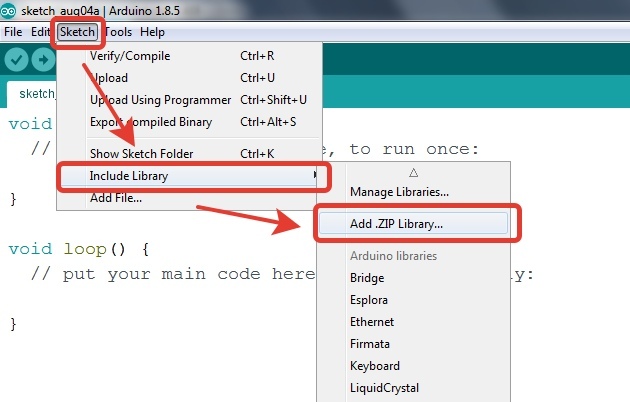 Download a sketch to Arduino IDE in the bottom of the lesson in the Downloads section. 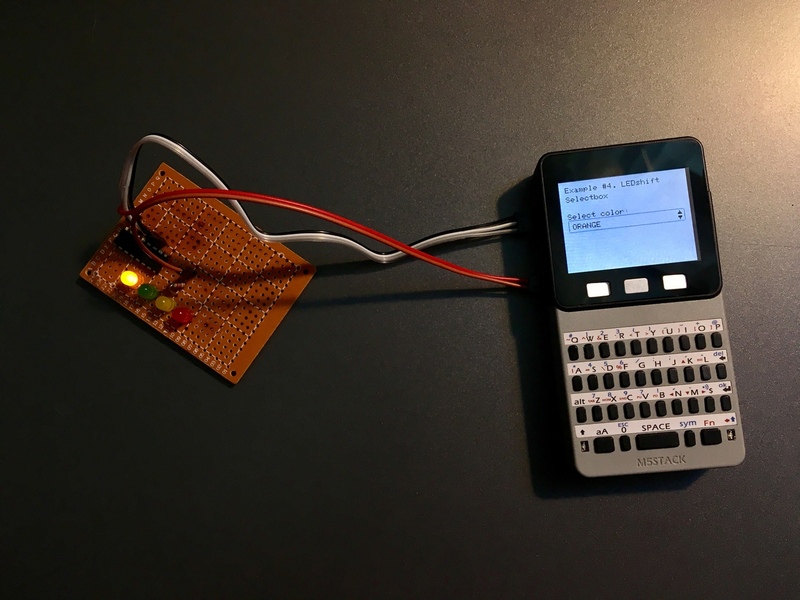 Connect the devices using the serial port (Fig. 5.1). And press the red buttons on both devices (Fig. 8). Let's try to play! (rice. 8.1). Hi! 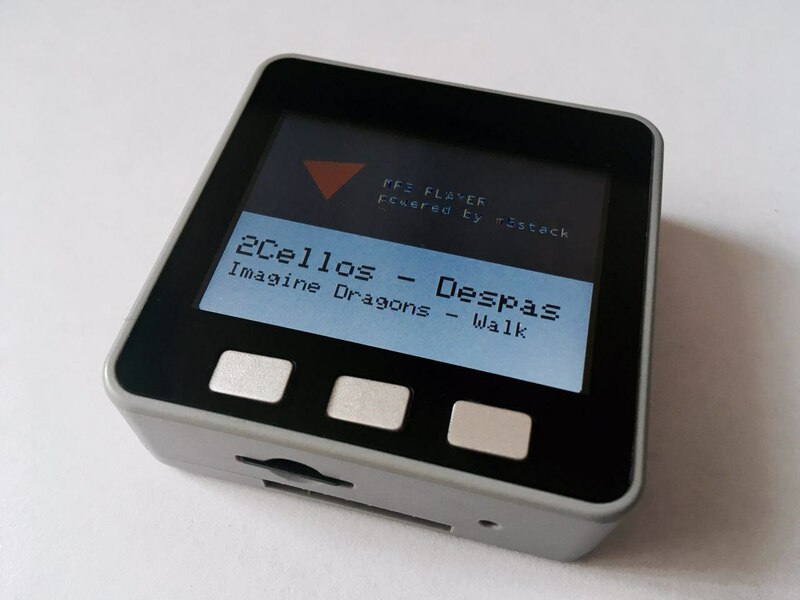 Today we will learn how to play audio files of MP3 format using the built-in DAC. 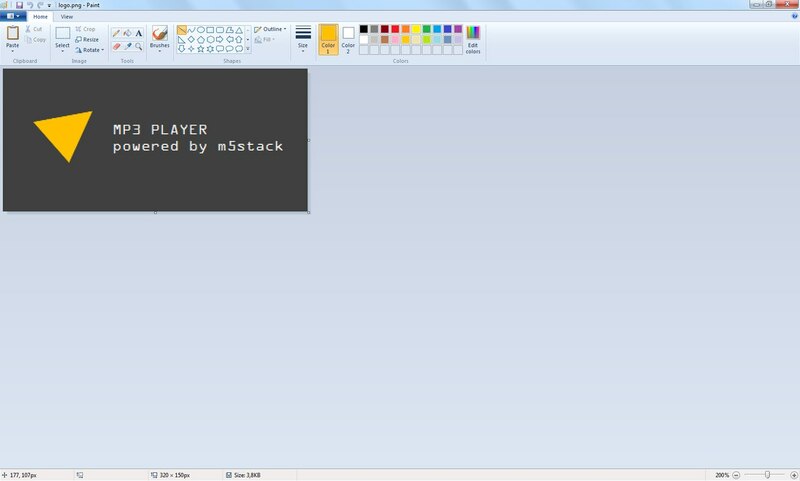 Write a simple player (Fig. 1). Digital-to-analog Converter (DAC) – a device for converting digital (usually binary) code into an analog signal (current, voltage or charge). Digital-to-analog converters are the interface between the discrete digital world and analog signals. The signal from DAC without interpolation on the background of an ideal signal is shown in figure 2. In M5STACK the DAC outputs correspond to the 25 and contacts 26 (Fig. 2.1). MP3 audio of the third level, developed by a team of MPEG file format to store the audio information. MP3 is one of the most common and popular digital audio encoding formats. 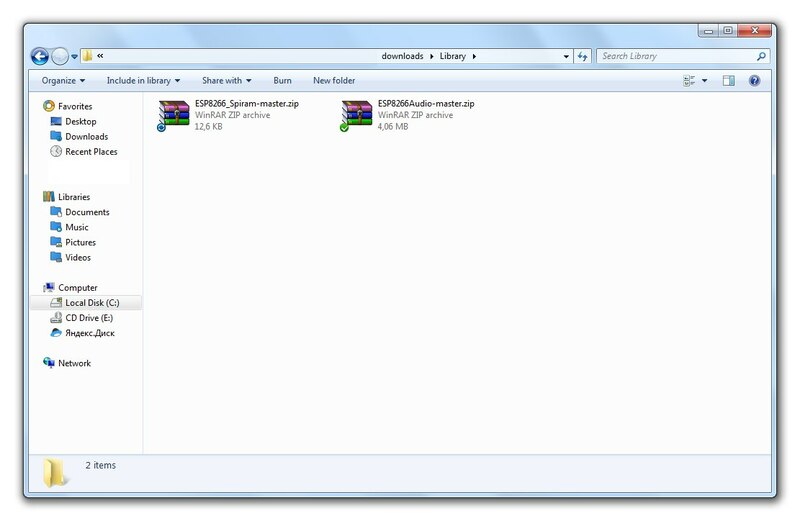 It is widely used in file sharing networks for evaluation download of music. 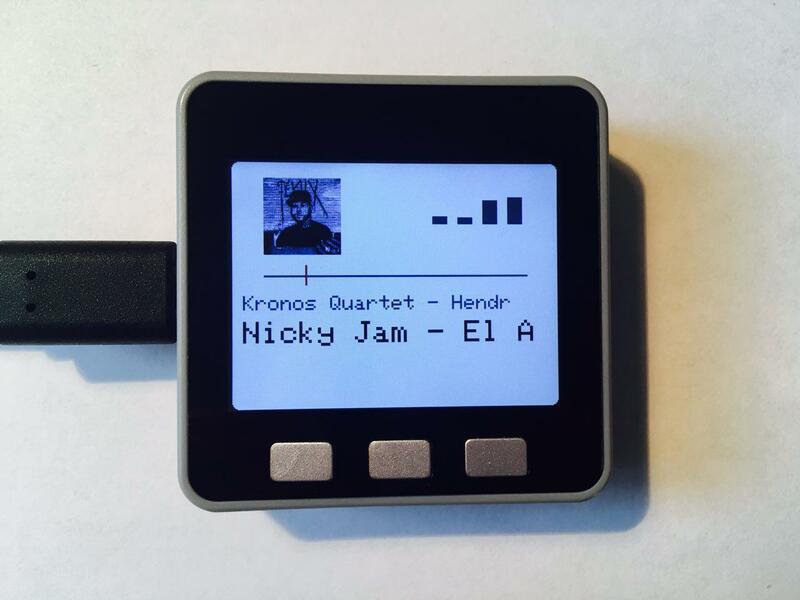 The format can be played in almost all popular operating systems, on most portable audio players, and is supported by all modern models of the music centers and DVD players. Draw a sketch of our player (Fig. 3). The name of the previous, current and next track will be displayed at the bottom of the screen. The name of the current track will be made black standard font size 3. The side tracks will be grayed out in standard size 2 font. In the center of the screen will be a time line of gray color, which will move the red label. In the upper right corner add four gray pillars that mimic the sound spectrum. The album cover will be located in the left corner. 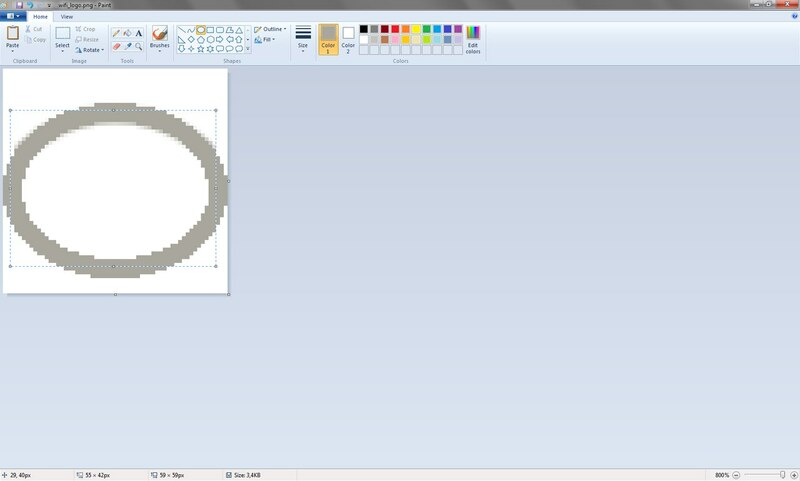 Let's use the standard graphical editor to make a logo (Fig. 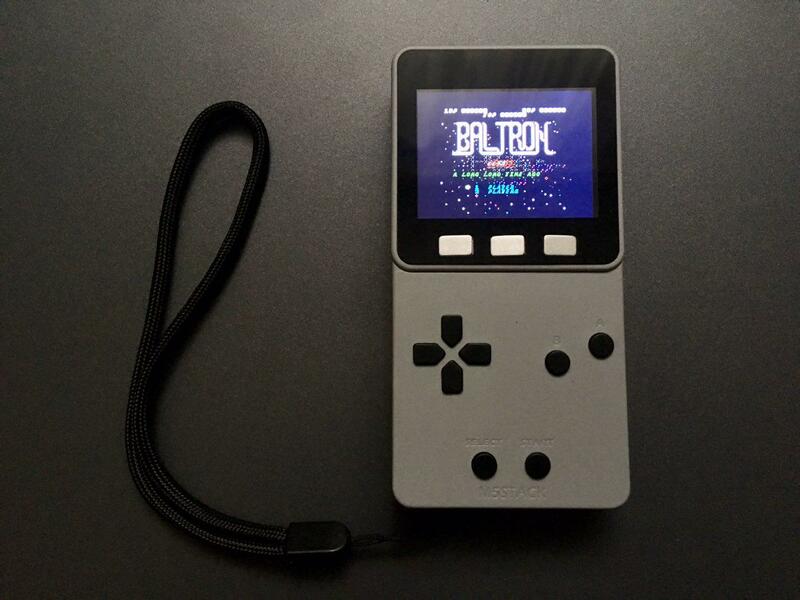 3.1), which will be displayed on the screen when you turn on the device. 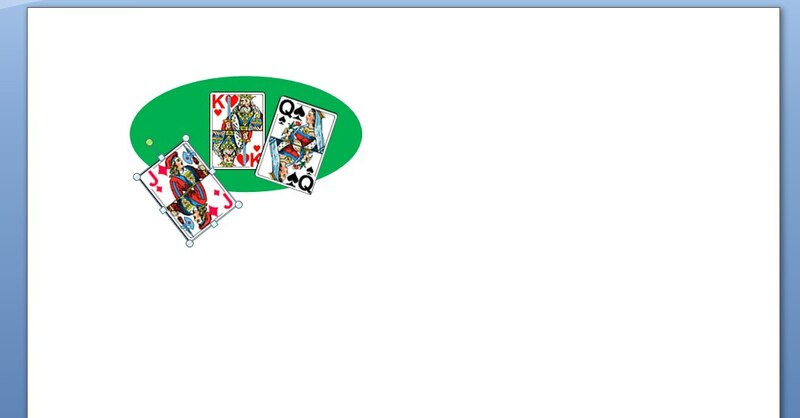 Please note that I use the design to work with the SD card-I told about it in the 5th lesson. To use other libraries, you need to add it. 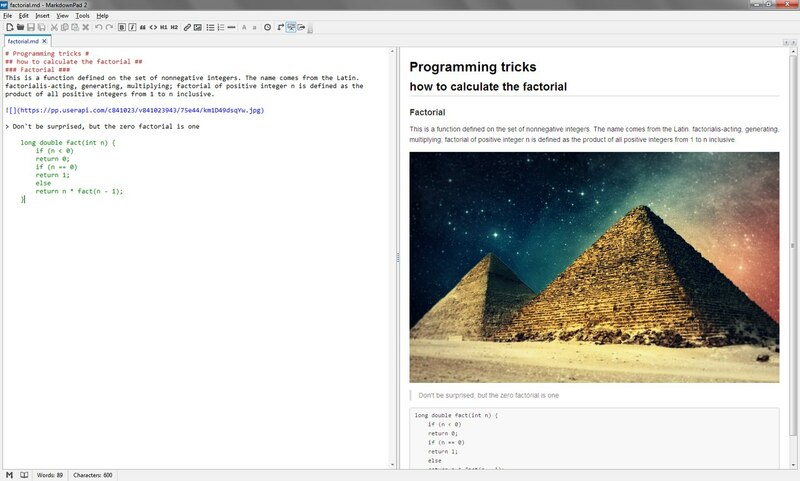 You can download it in the appropriate paragraph in the section Download -> Library. 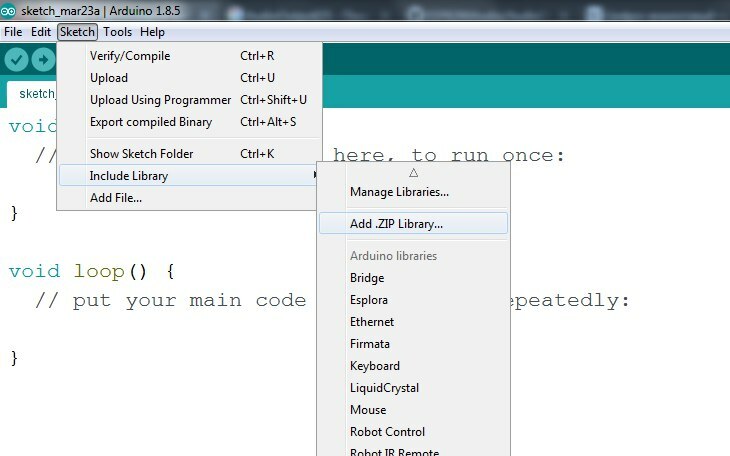 In order to add a library you need to launch Arduino IDE select the menu section Sketch -> Include Library -> Add .ZIP Library... (rice. 4, 4.1). Step 6. Tracklist drawing is easy! In order to play MP3's from a playlist write a function Play(char), which as argument takes the instruction. If the argument is set to' l', the pointer in the dynamic list will be shifted to the left and the track will start playing on the left. Similarly for the track on the right. If the argument is set to' m', it means play back silence. If you pass any other argument, it would mean 't' (this) - play current, i.e. 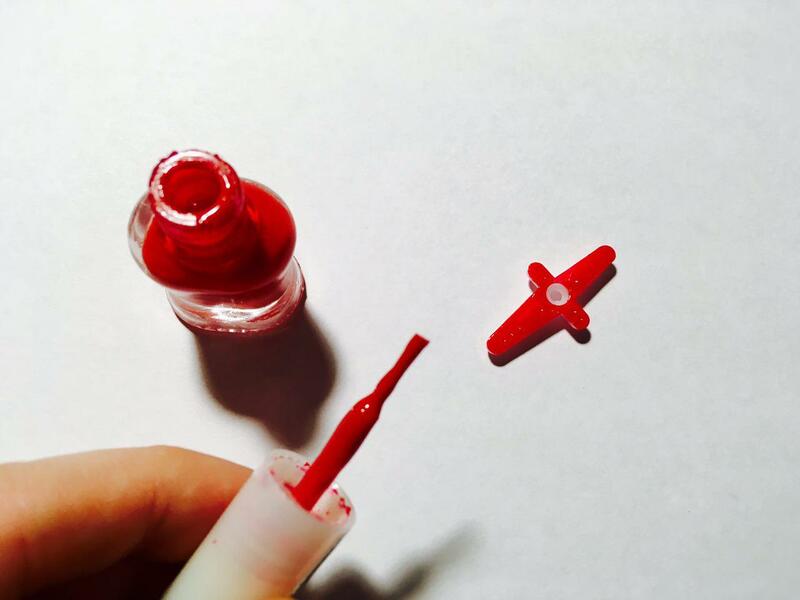 the one pointed to by the pointer. Everything works and looks good enough, the only thing is the crackle when switching songs. The cause has not yet been set. Task 2 difficulty levels: add a running line for long track titles. Task 4 difficulty levels: instead of emulating the spectrum, implement a fast Fourier transform. The first pillar is 100 Hz, the second - 600 Hz, the third - 1500 Hz, the fourth 3000 Hz. Привет! Сегодня мы научимся выводить русский текст на экран M5. Этот урок научит: подключать и использовать стороннюю библиотеку с поддержкой русского шрифта в Arduino IDE. "Шрифты дополнены русскими буквами на позициях 192-255 (кодировка windows-1251). Некоторые шрифты дополнены надстрочными и подстрочными символами цифр, а так-же символами mmHg, °C...". Переходим по ссылке "Библиотека" в разделе "Downloads" (рис. 2). 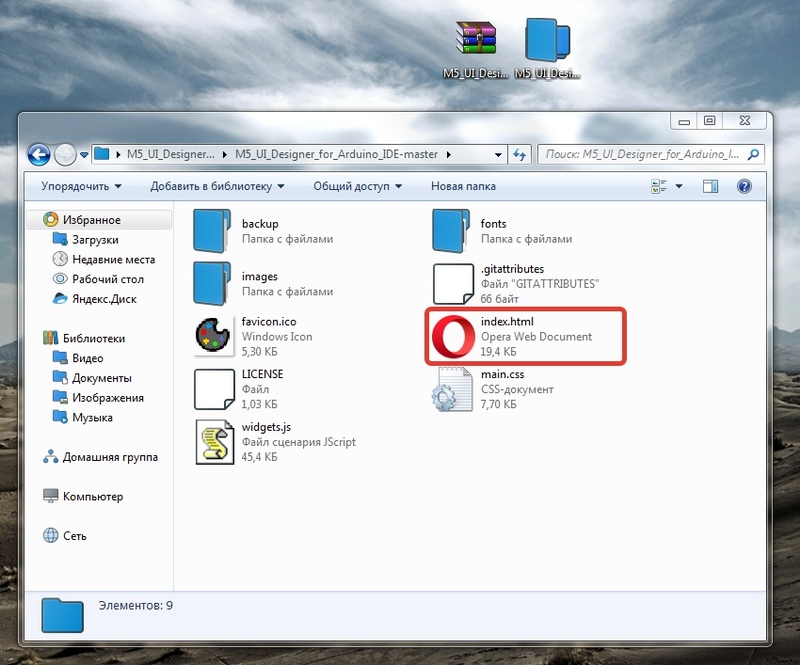 Извлекаем из архива папку M5RUText-master переименовываем её в M5RUText и копируем в C:\Users\ИМЯ_ПОЛЬЗОВАТЕЛЯ\Documents\Arduino\libraries (рис. 3). Отлично. 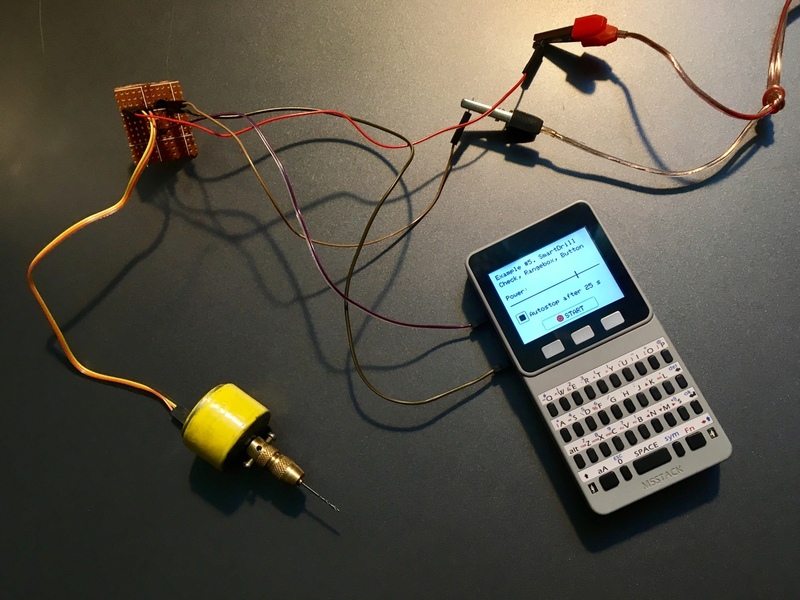 Теперь можно подключить M5 к компьютеру, запустить Arduino IDE и открыть скетч (рис. 4). Последовательный порт - сленговое название интерфейса стандарта RS-232, которым массово оснащались персональные компьютеры, техника специального назначения, в том числе и принтеры. Порт называется "последовательным", так как информация через него передаётся по одному биту, последовательно бит за битом. Обычные персональные компьютеры снабжены RS-232, а микроконтроллеры и M5STACK в том числе использует TTL. RS-232 для передачи "0" использует напряжение от -3 до -25 В, а для передачи "1" от +3 до +25 В. В отличии от RS-232 в TTL для передачи "0" используется напряжение близкое к 0 В, а для передачи "1" рабочее напряжение интегральной схемы, как правило 3.3 или 5 В (рис. 2). 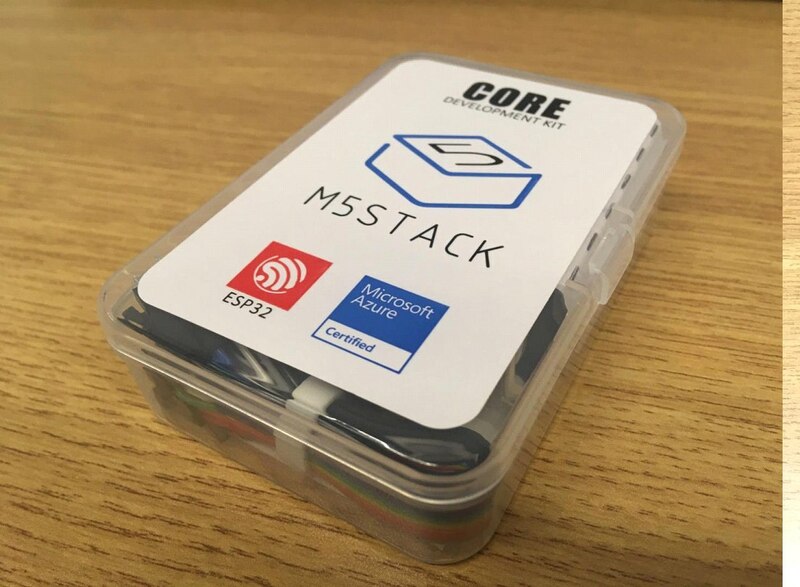 Для обмена данными через последовательный порт M5STACK используют цифровые порты ввод/вывода R0, R2 (RX) и T0, T2 (TX) (рис. 3), а также USB порт. Важно учитывать, что если вы используете функции для работы с последовательным портом, то нельзя одновременно с этим использовать порты 0 и 1 для других целей. цветные провода из стандартного набора. Давайте нарисуем логотип игры, который будет появляться на дисплее устройства при запуске игры. 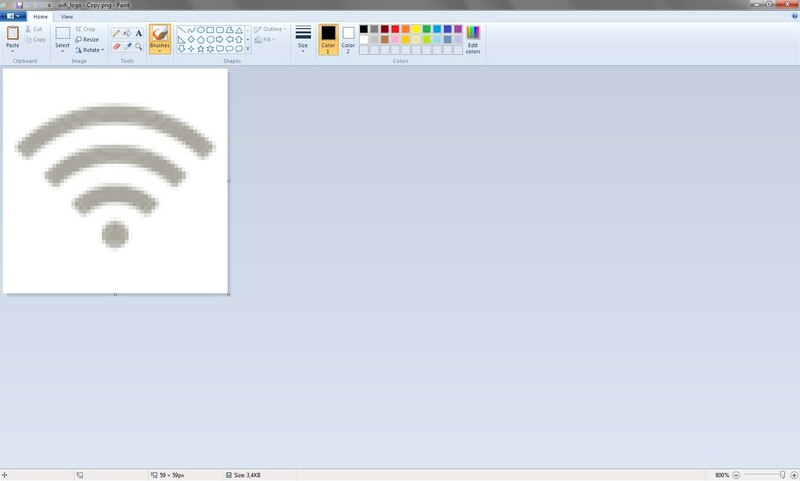 Для этого используем любой редактор, например MS Office Word и Paint (рис. 4). 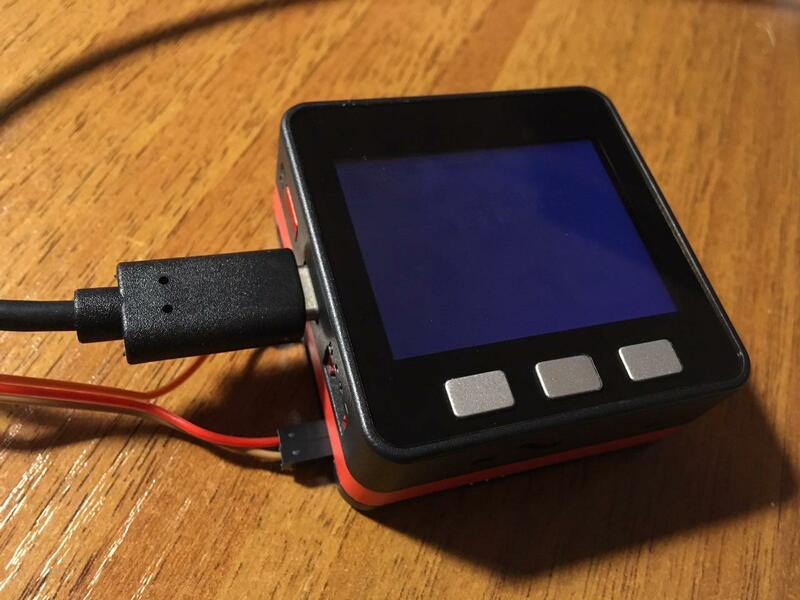 Далее при помощи приложения из урока 1.2.1 http://forum.m5stack.com/topic/49/lesson-1-2-1-lcd-how-to-create-image-array конвертируем изображение в массив пикселей и получим файл logo.c, который подключим к скетчу. По правилам игры используется колода, содержащая только 36 карт. По 6 карт выдается каждому игроку. Игровое поле рассчитано на 12 карт. Игрок может взять 10 карт, после чего проиграет. В игре карта имеет своё значение и масть, например 7♥. В программе карта имеет своё место: (в руках у игрока - поле игрока; в игровом поле; в использованной колоде; в неиспользованной колоде) и назначение: свободная карта, недоступная карта, карта козырная, карта игрока, карта противника. Сделаем структуру, которая содержит порядковые номера параметров. Колода карт представляет собой массив структур (рис. 5). Благодаря прекрасным стандартным функциям для работы со встроенным дисплеем из библиотеки M5STACK, рисование карт займет доли секунд и практически не займёт памяти устройства. 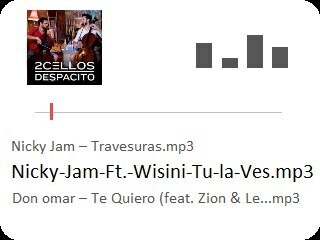 ♣ Лайфхак для пользователей Windows: попробуйте зайти в любой текстовый редактор и зажать на клавиатуре клавишу Alt и набрать одну из цифр от 3 до 6, после этого отпустить нажатые клавиши. Функция отправки строки добавляет в конец строки полученной в качестве аргумента символ новой строки и отправляет её в последовательный порт. Потом пытается принять строку, содержащую в себе символ конца сеанса передачи данных. Если символ пришёл, то функция вернёт true иначе false. Функция приёма строки в течении timeout (3000 миллисекунд) пытается принять строку, при этом очищая от мусора в начале до символа начала пакета. В случае неудачи возвращает пустую строку. Сделаем так, что любая информация, передаваемая между устройствами упаковывалась в специальные пакеты (рис. 6). Напишем функцию, которая принимает, распаковывает и выполняет пакеты. А также напишем вспомогательную функцию (parseString), которая позволит извлекать определенный участок из строки, заключенный между специальных знаков разделителей (похожа на метод Split из JS). При включении устройства и соединении кабеля, каждое из устройств выдерживает случайный интервал времени, при этом слушает входящие пакеты, и, отсылает пакет "Я здесь!" (рис. 7). По-умолчанию оба устройства являются первыми игроками. То устройство, которое первым примет послание "Я здесь!" сразу назначит себе номер игрока 2. Функция синхронизации по факту является ключевой в данном проекте. Целью функции синхронизации является реагирование при действиях игроков и обмен игровой информацией. Функция вызывается в ручном и автоматическом режиме из цикла loop(). Когда очередь игрока функция работает в ручном режиме и выполняется только после действий игрока. В то время эта же функция работает в автоматическом режиме на устройстве соперника. Шаг 13. Кто же выиграл? Функция whoWin() возвращает номер игрока, который выиграл или -1, если никто не выиграл. По правилам игры считается, что если у игрока не осталось ни одной карты, то он выиграл. Если у игрока 10 (playerFieldAmount) и более карт, то он проиграл. Внимание: это мой первый проект игры, поэтому приведенный код является beta-версией, который может содержать баги и ошибки. Спасибо за понимание! 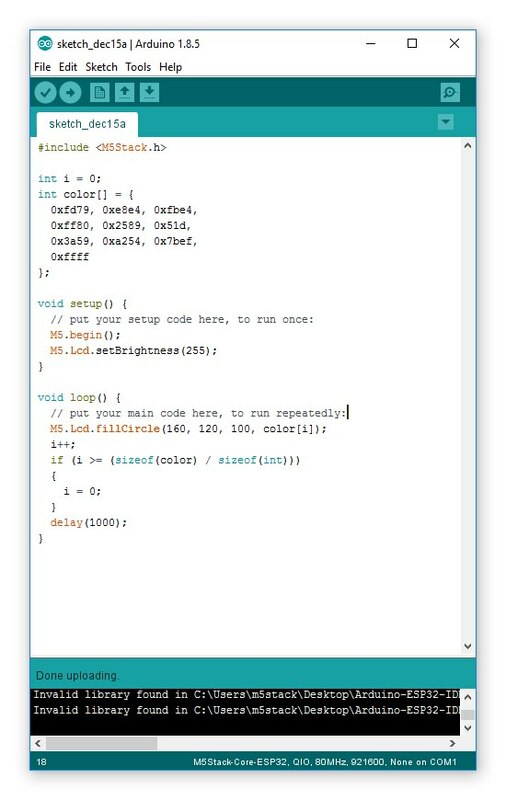 Скачать скетч для Arduino IDE можно внизу урока в разделе Загрузки. Соединим устройства при помощи последовательного порта (рис. 5.1). И нажмём красные кнопки на обоих устройствах (рис. 8). Попробуем сыграть! (рис. 8.1). 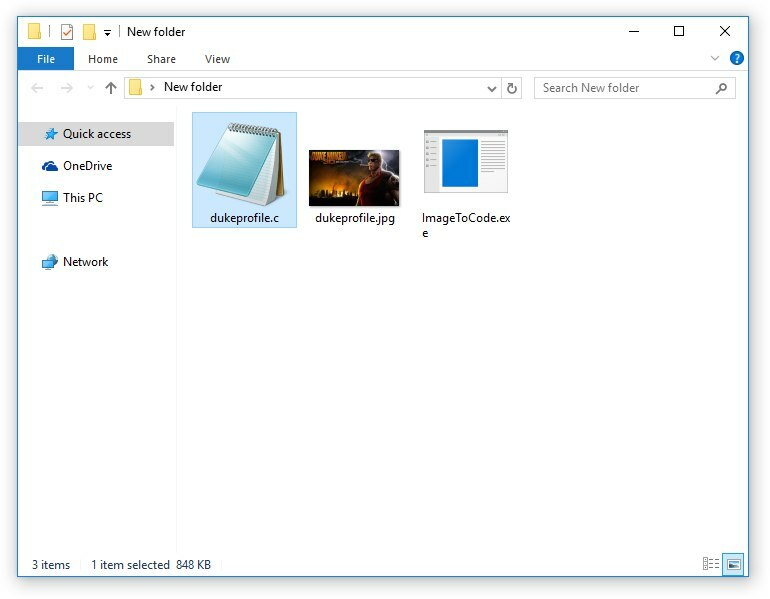 Если у Вас Win7, то установите драйвер версии 5.40.24. И проверьте версию через диспетчер устройств. 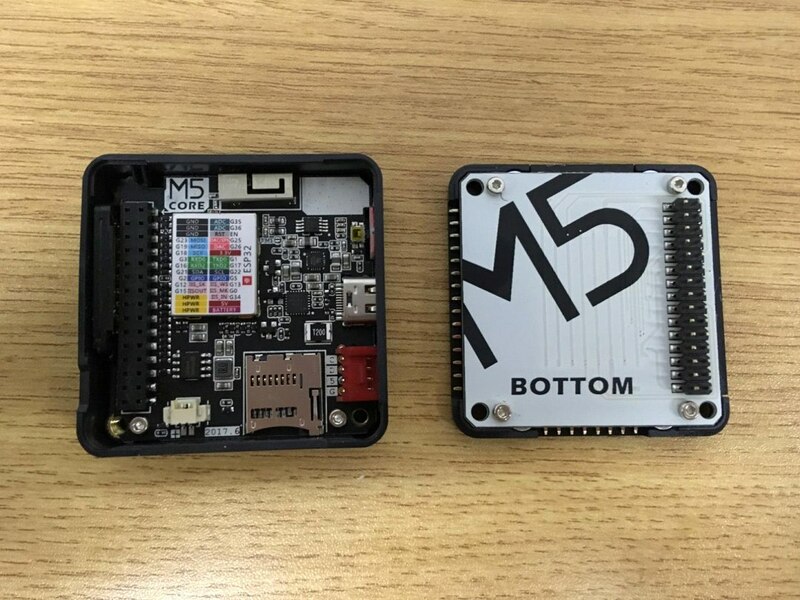 Так же попробуйте во время процесса нажать кнопку питания на M5Stack. If You have Win7, then install the driver version 5.40.24. 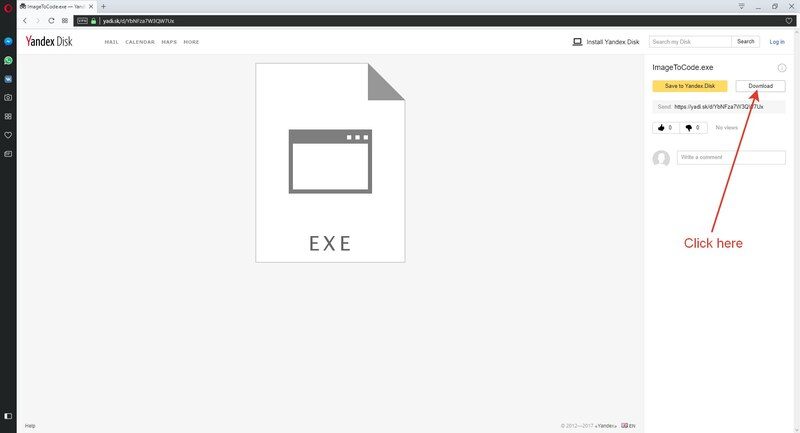 And check the version through the device Manager. 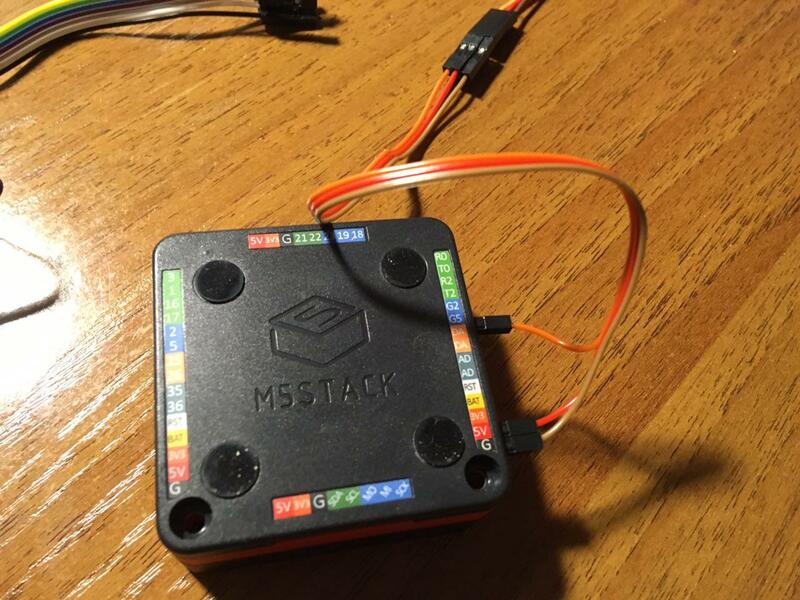 Also try during the process, press the power button on M5Stack. Hi! 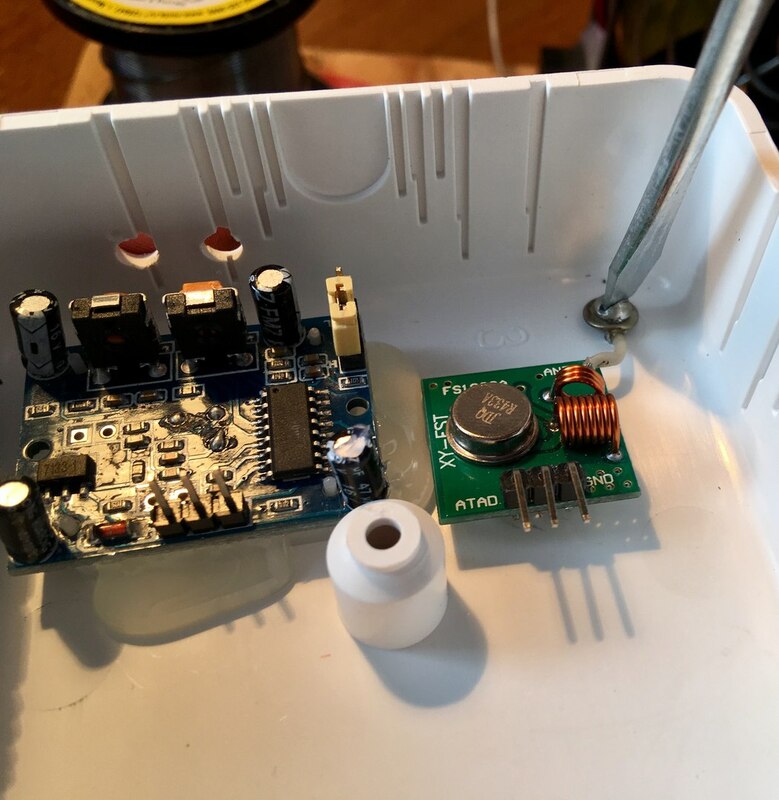 Today we will make a simple security system using a pair of radio modules (FS1000A and MX-JS-05V), which operates at a frequency of 433MHz (depending on your region, the frequency may be slightly different) (Fig. 1 - 1.1). 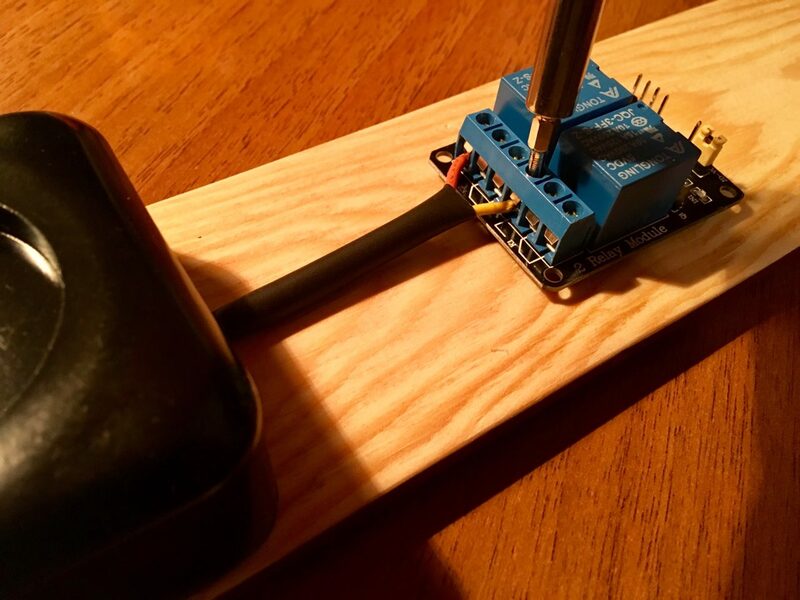 Learn how to make by yourself wireless penetration sensor based on the module HC-SR501. 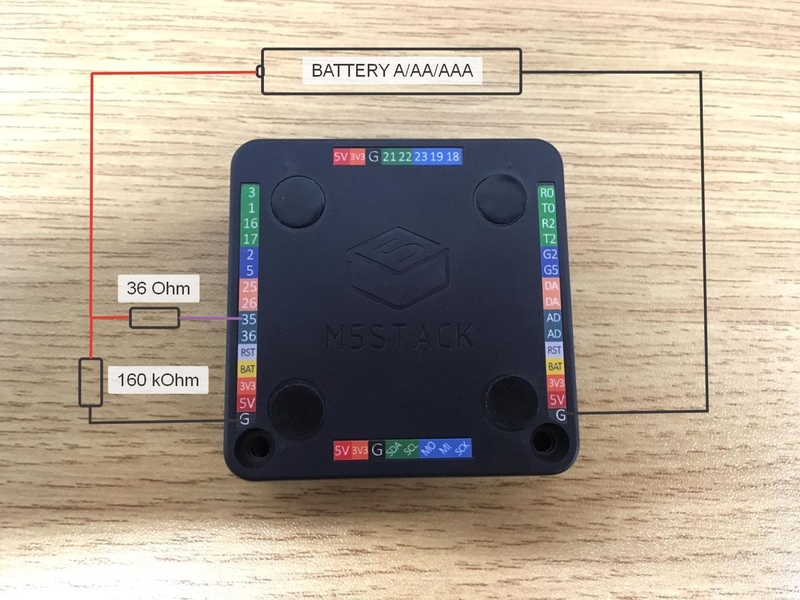 The center of the system will be the M5STACK with a connected radio and a red light beacon. 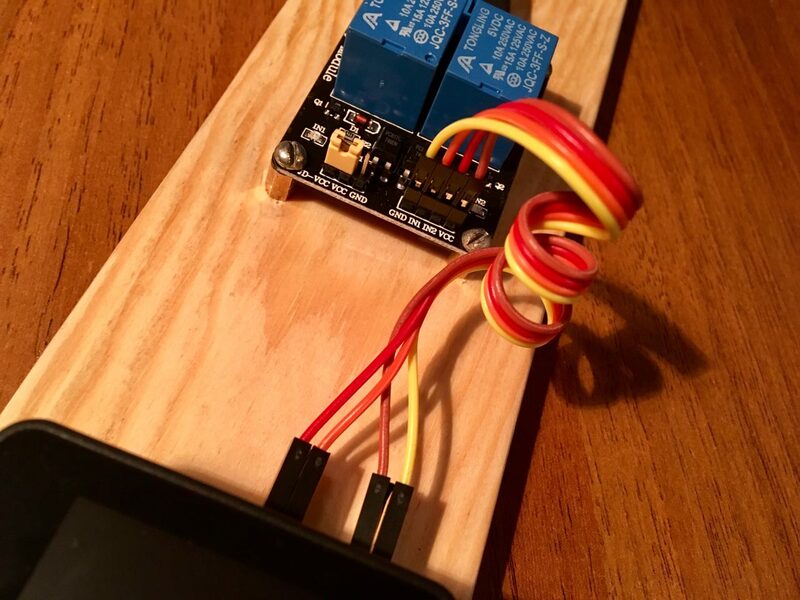 We will do wireless penetration sensor with our hands. 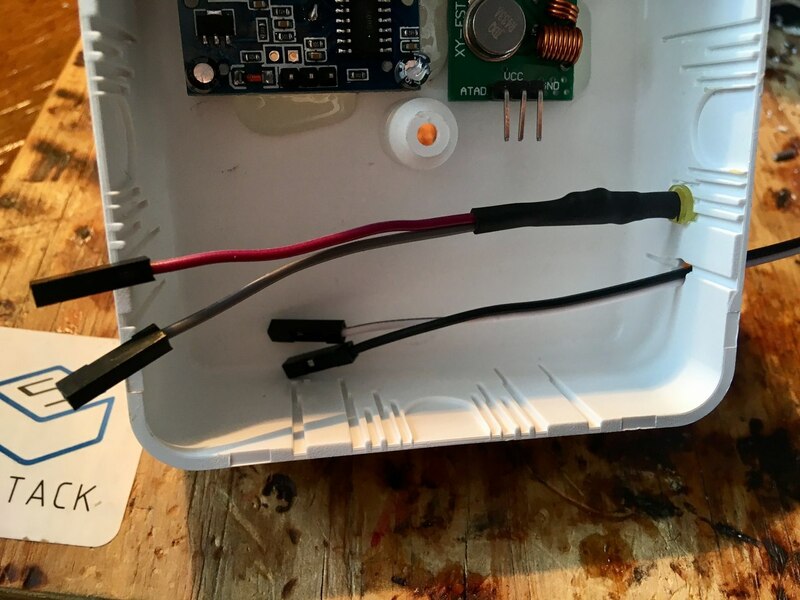 The sensor will be connected to a DC voltage of 5 V. when the sensor is disconnected from the power supply or when removed from the range of the wireless network, the Central unit will signal a flashing beacon and an audio signal. It will also be possible to suspend protection using the Central button for a specified interval. Today we cannot imagine life without radio communication. When we drive up to our house we use the remote control to open the garage door. When guests come to visit us, they press the wireless button to make a call. When we walk through the Mall we don't care about our car. And that's just a few of the examples. 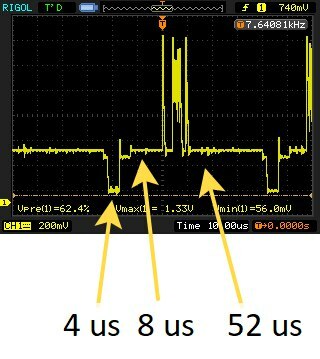 The main thing is that it unites-decimeter range (in our case 433 MHz). 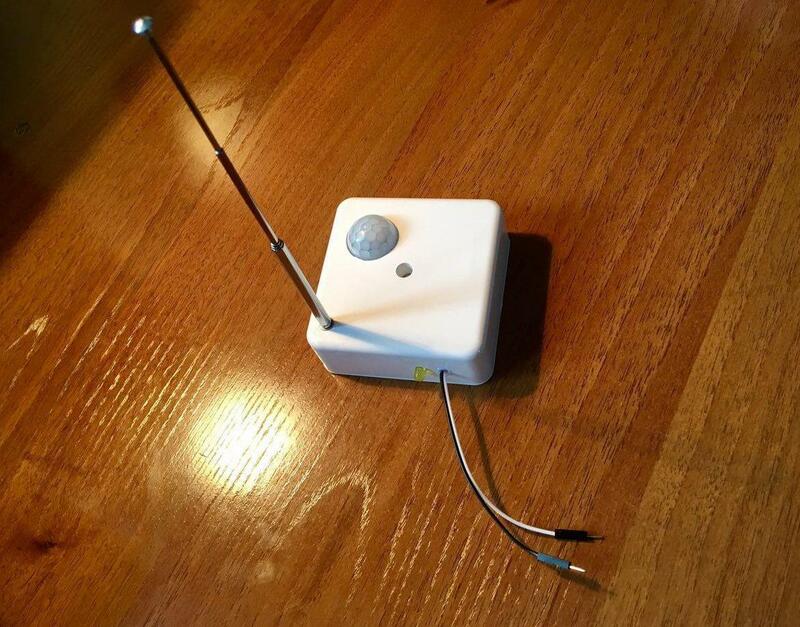 Thanks to the work of great engineers and programmers, we can easily use this radio in our projects (Fig. 2). operating temperature range: -20 to 80 °C. 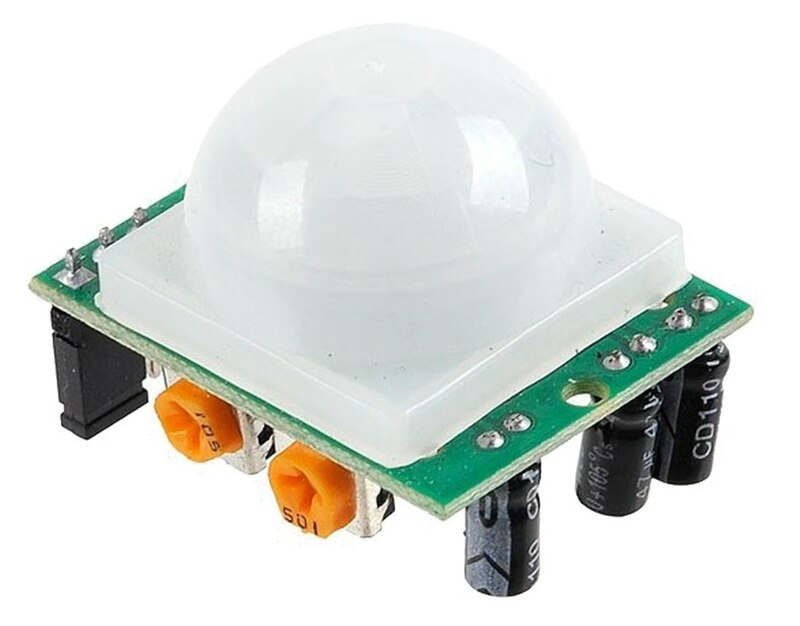 Now let's look at the motion sensor module HC-SR501 (Fig. 2.1). The principle of operation of the module HC-SR501 is the registration of infrared radiation from a moving object. Sensitive element pyroelectric sensor 500BP. It consists of two elements of prisoners in the same building. The sensing element is closed by a white Fresnel dome lens. Features Fresnel lenses are such that the infrared radiation from the moving object falls first on one element of THE 500bp sensor, then on the other. 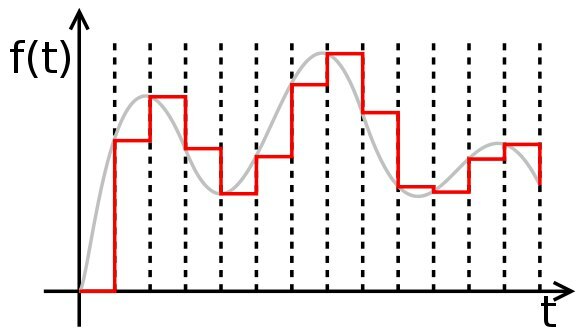 The chip monitors the change of the signal from the sensor and generates a logic signal at the output according to the parameters set by the variable resistors and jumper (Fig. 2.2). In l mode, the output is set to a high level at the initial registration of the movement. 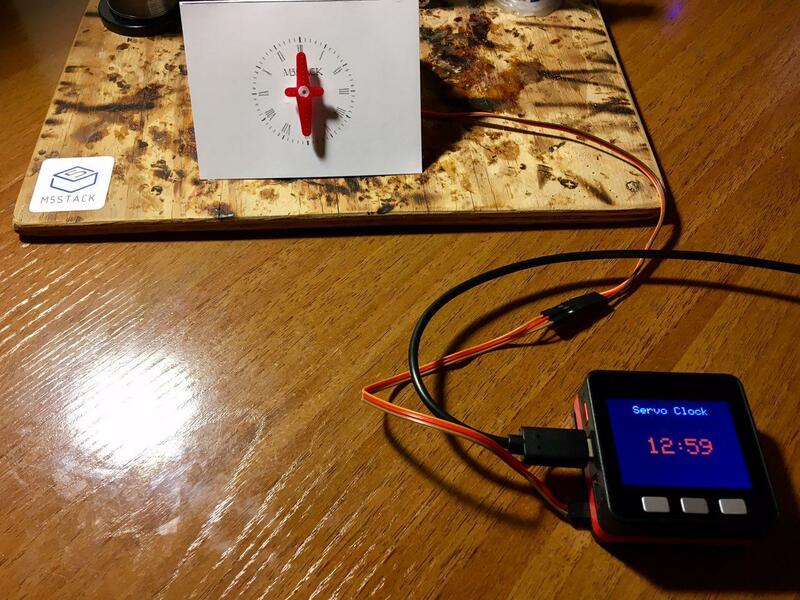 The high output level remains during the timer operation, which is set by the "Time adjust" string resistor. At this time, the sensor does not respond to other events. In H mode, each moving object restarts the timer. That means that the first fixed object at the exit of the HC-SR501 presence detector generates a high level and is maintained as long as there are movements in the detection zone. 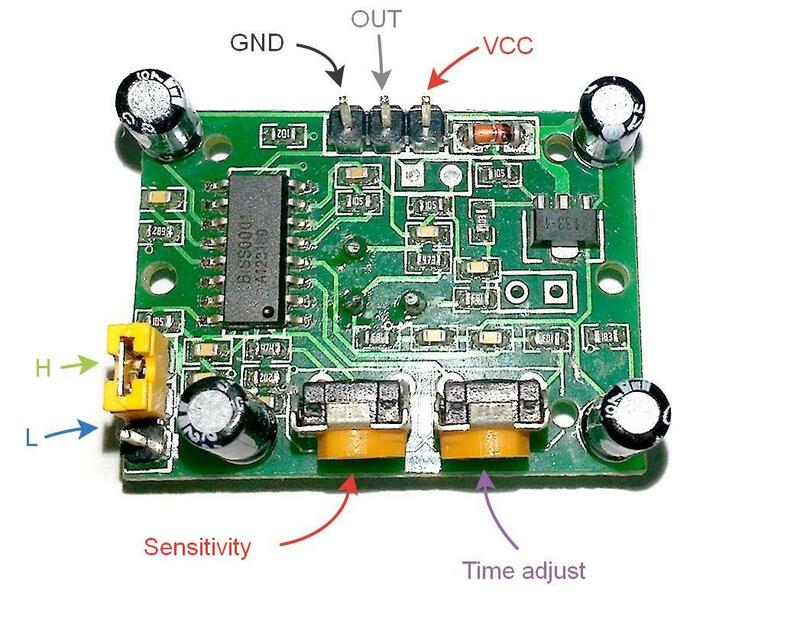 With the "Sensitivity" resistor you can change the sensitivity of the module, thereby changing the radius of coverage. 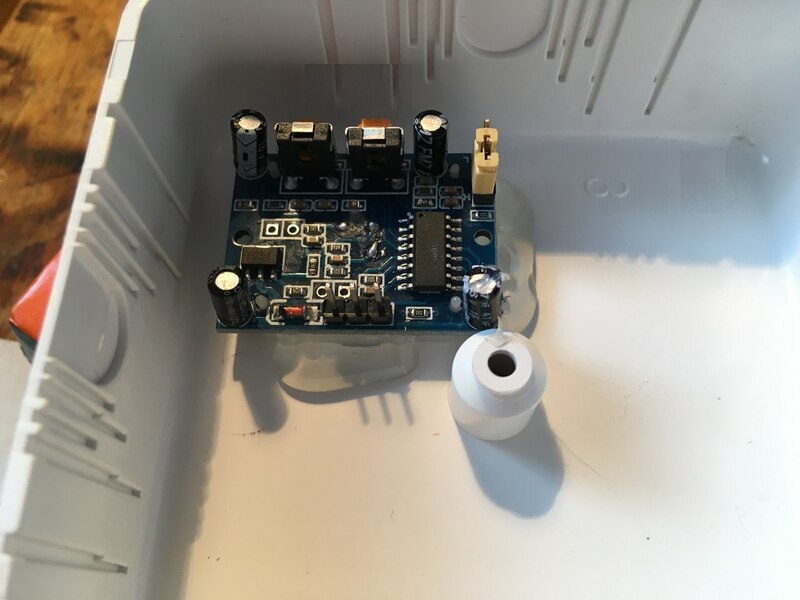 The sensor brain will make an inexpensive Arduino Nano tab, it is convenient first of all by accessibility on the market today. Here we connect the led to the contact D3, a radio transmitter FS1000A to the contact D4, and motion module HC-SR501 on contact D5. 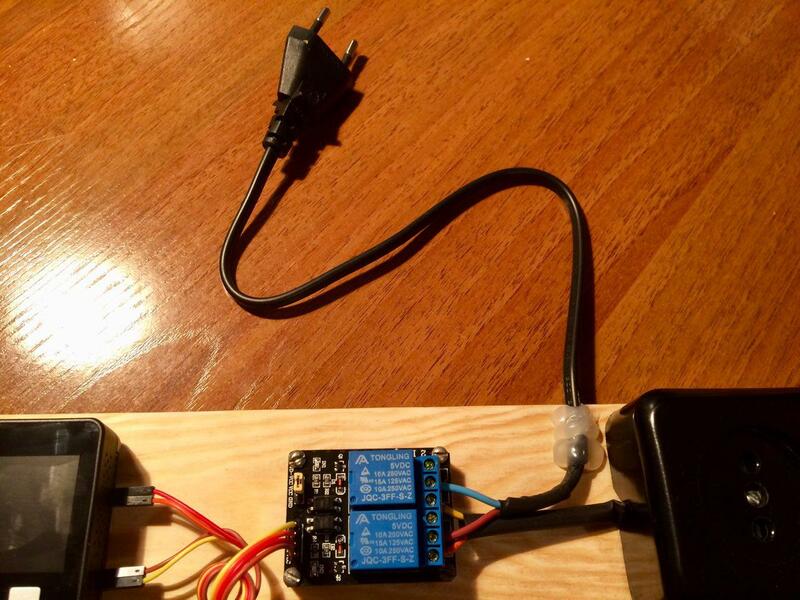 The power supply for all modules will be done from the Arduino Nano with 5V. The Board Arduino we are going to feed from the DC link voltage of 5 V To the contact VIN. Earth for all devices in General, is tightened to GND. Thus we obtain the following scheme of inclusion (Fig. 3). 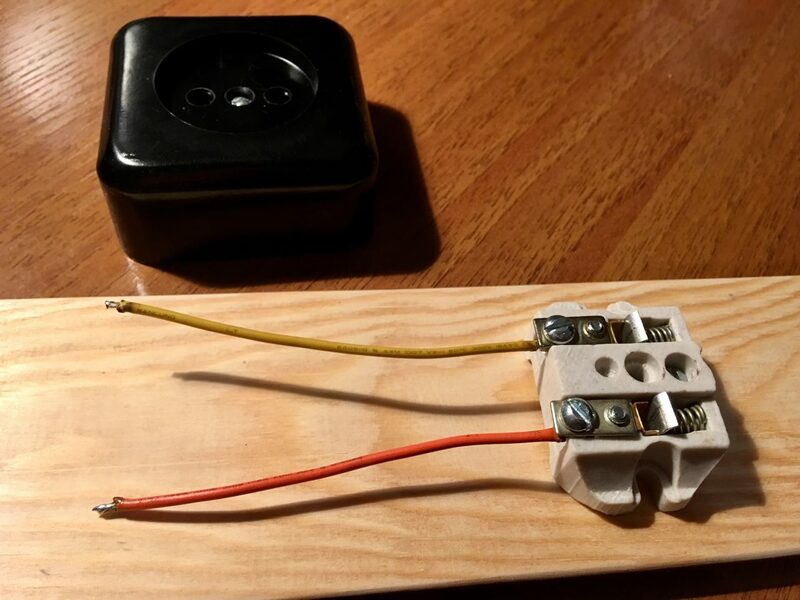 As the case you can use, for example: plastic junction box from the power supply network (can be found in the electrical shop) (Fig. 4). 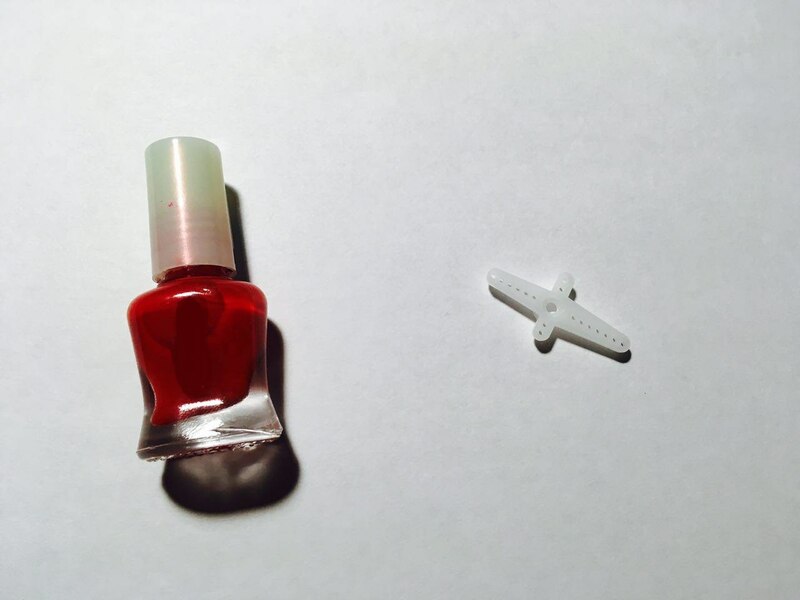 In this case, the body dimensions are 70 x 70 x 29 mm. The future location of the modules is shown well in figure 3. Let's talk about it in more detail in the next steps of this tutorial. First of all, you need to make holes in the body with a drill. Prepare the workplace: remove all unnecessary things, put a wooden Board under the body of the device, so as not to damage the table or use a special workbench. Attention! Perform actions under the supervision of adults and observe safety precautions. 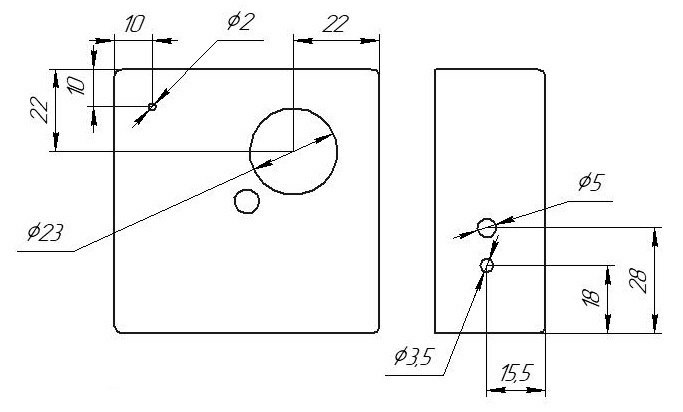 Check out the drawing showing the location of the holes in the housing of our future device in figure 5. 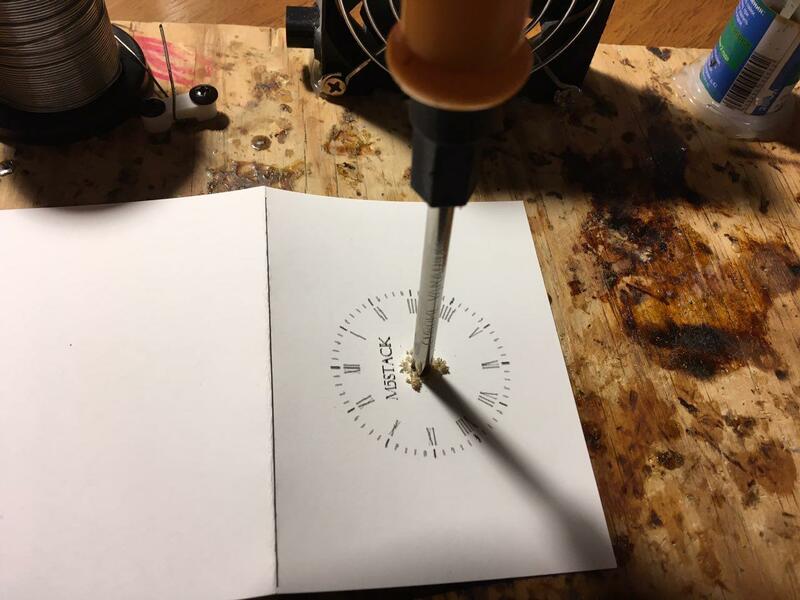 Use the ruler to measure the distance you need and apply the point with a marker, take a drill, set the drill diameter 3.5 mm and make a hole (Fig. 6). 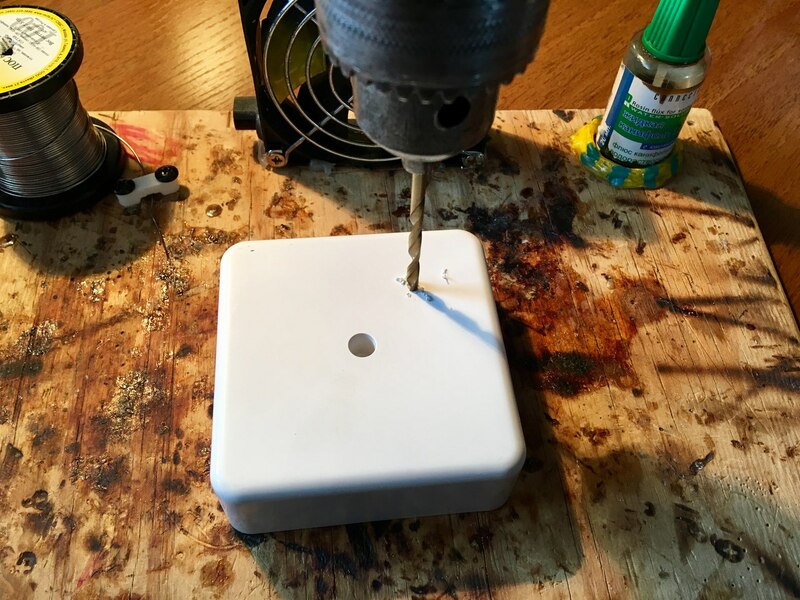 Now, install a 23 mm diameter drill bit and drill a larger hole on top (Fig. 6.1). 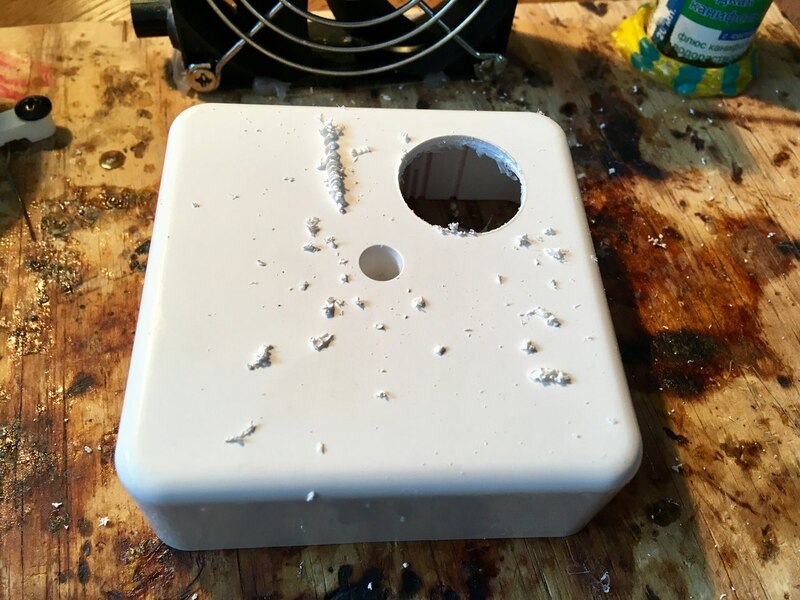 After the hole has been drilled, clean the housing from plastic chips (Fig. 6.2-6.3). 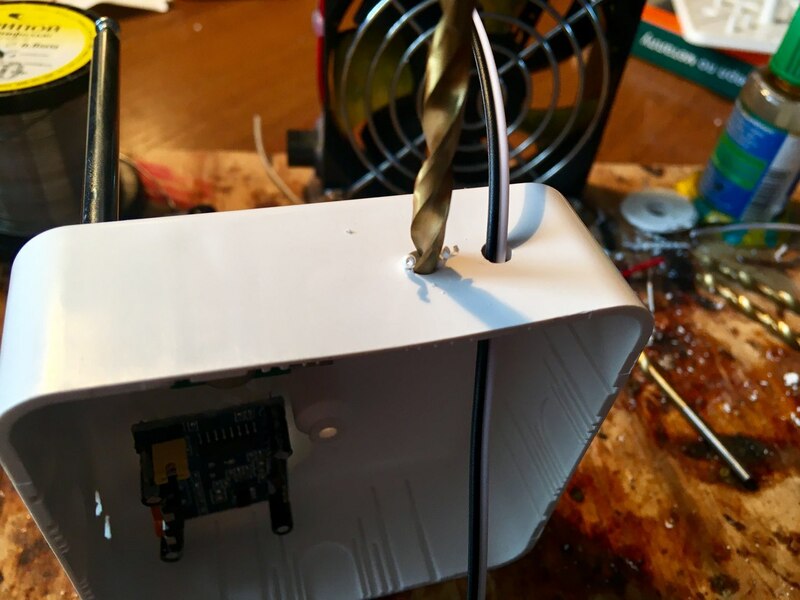 Turn the case over, install the module exactly and fix it with a thermal glue (Fig. 6.4-6.5). 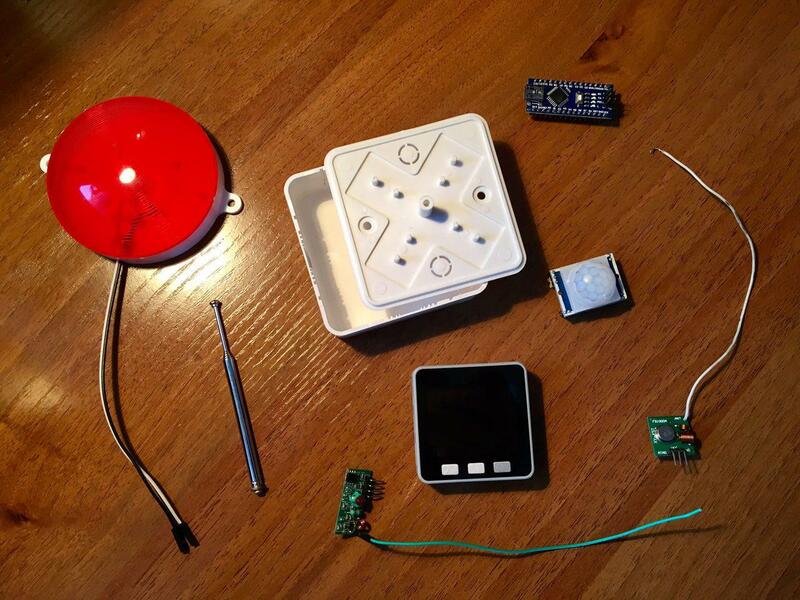 This completes the installation of the motion sensor module. Similarly with a ruler measure the desired distance, and apply a dot with a marker, take the drill, install the drill bit with a diameter of 2 mm and make otverstie (Fig. 7 - 7.1). 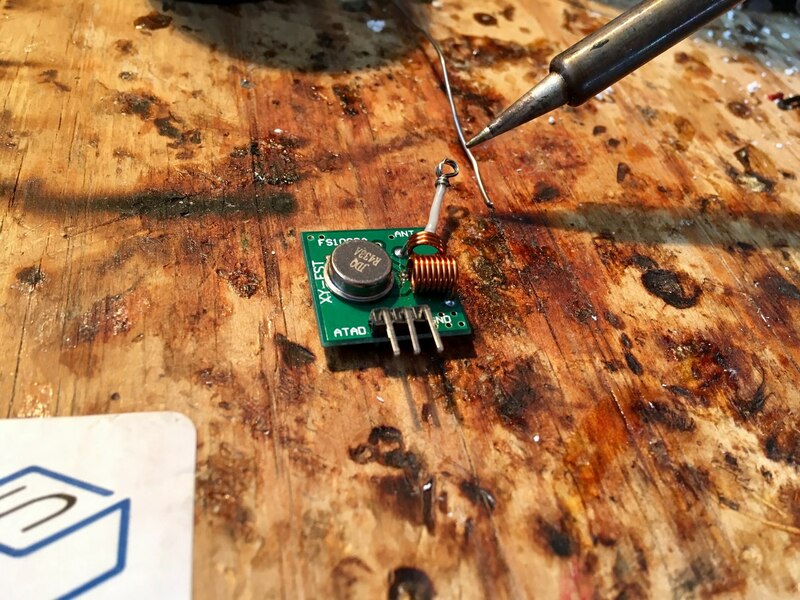 Solder the conductor with the ring at the end to the hole on the module labeled ANT (Fig. 7.2). 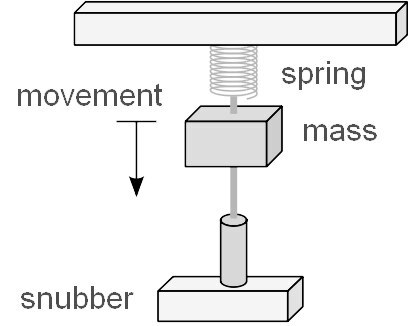 Screw the screw and washer onto the conductor (Fig. 7.3). 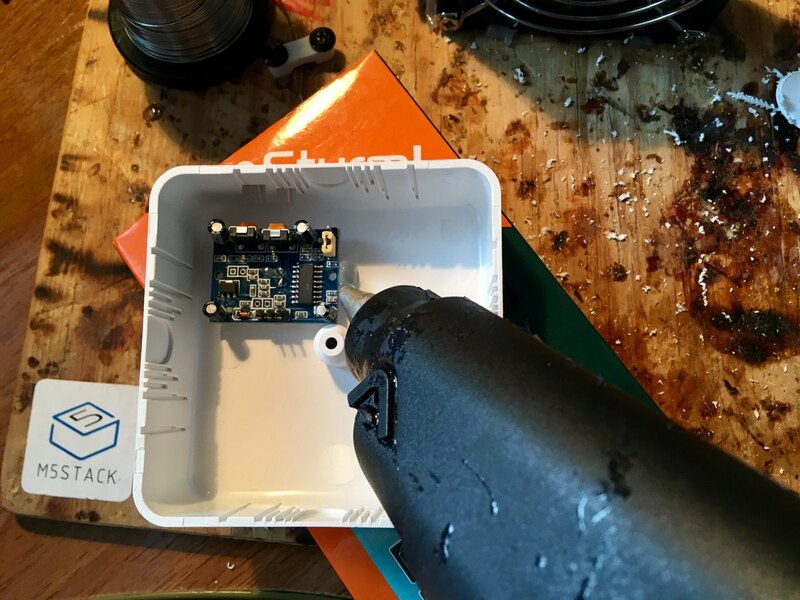 Install the module in the housing and fix it with a thermal glue (Fig. 7.4). Hold the telescopic antenna on the back of the case. This completes the installation of the radio transmitter and antenna. 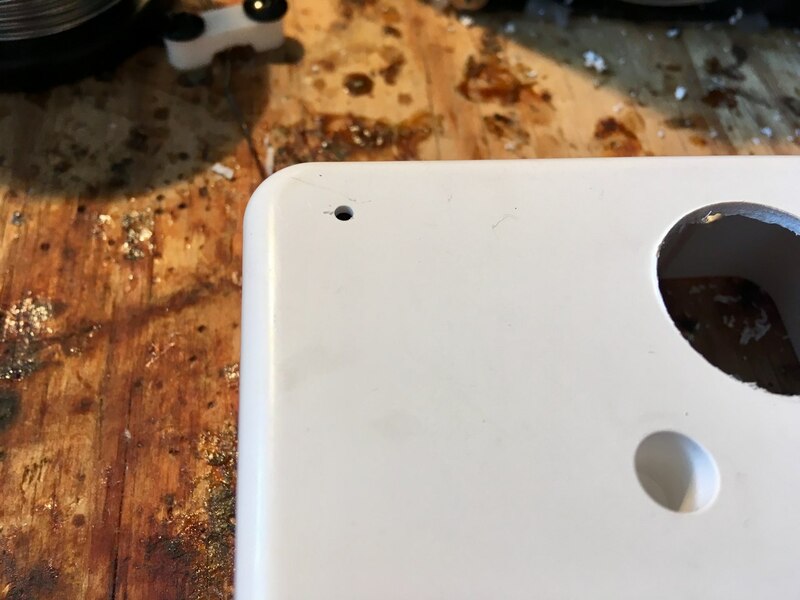 Make holes in the side wall and install a cable type (plug socket) (Fig. 8 - 8.1) and led. 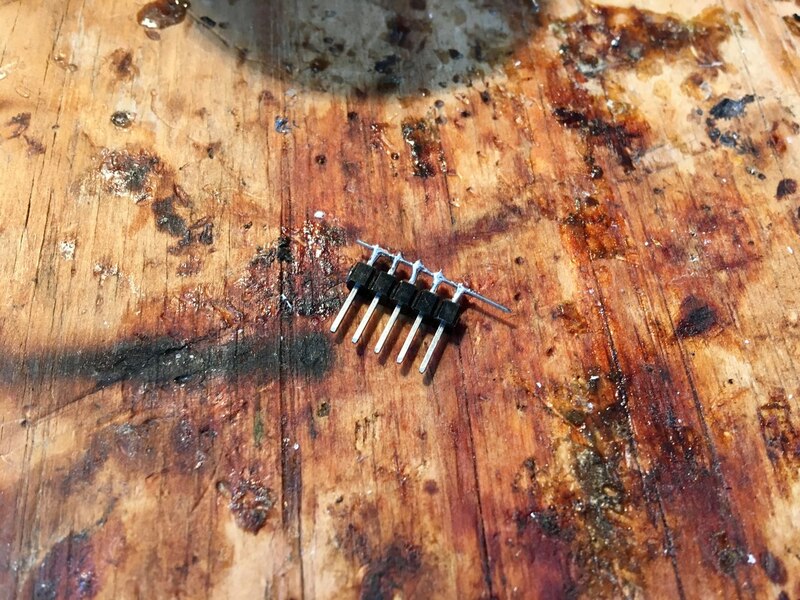 Shorten one of the legs (+) of the led and solder the resistor 220 Ohms. 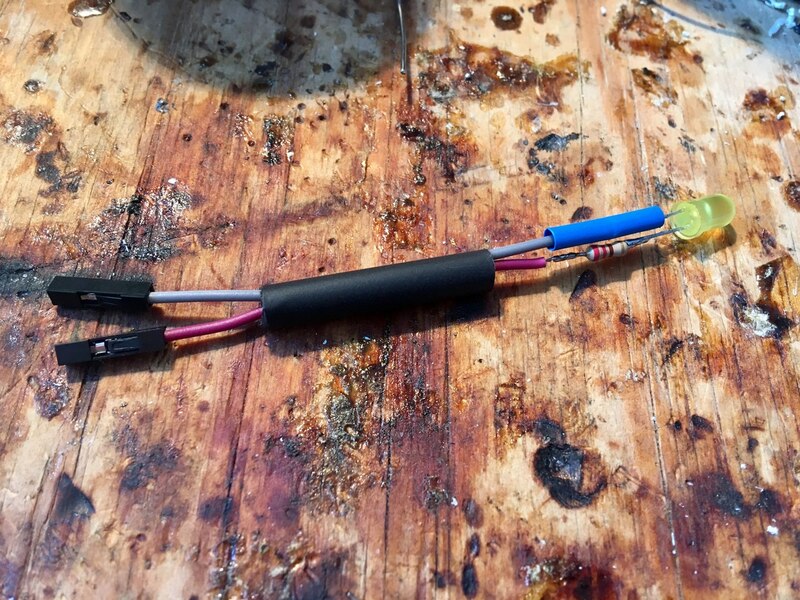 Use heat shrink for insulation (Fig. 8.2). 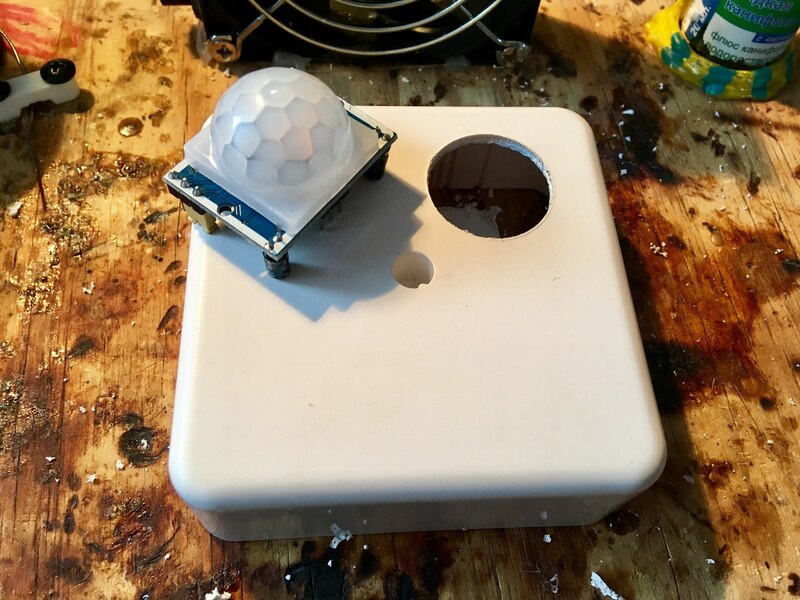 Next, install the led in the housing (Fig. 8.3). This completes the installation of the led and power wires. 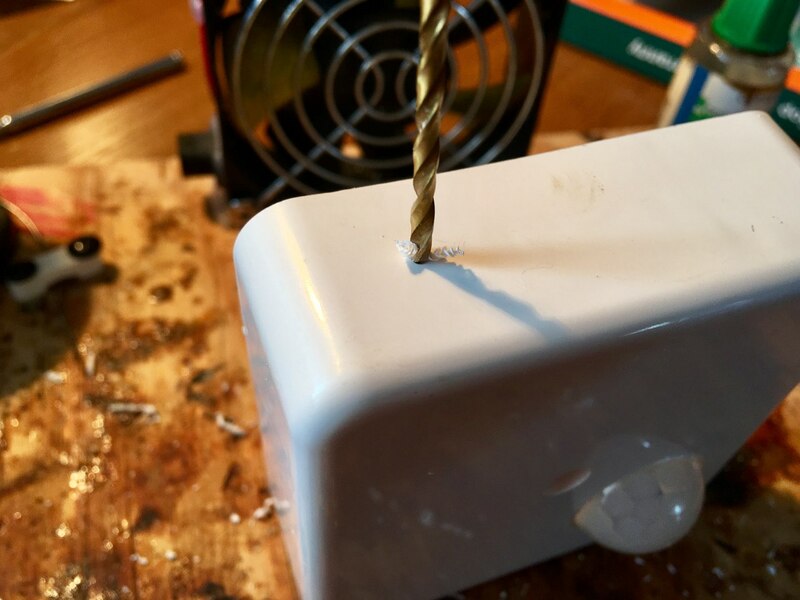 Take and bite off with the help of pliers plug type PLS-10 in half. 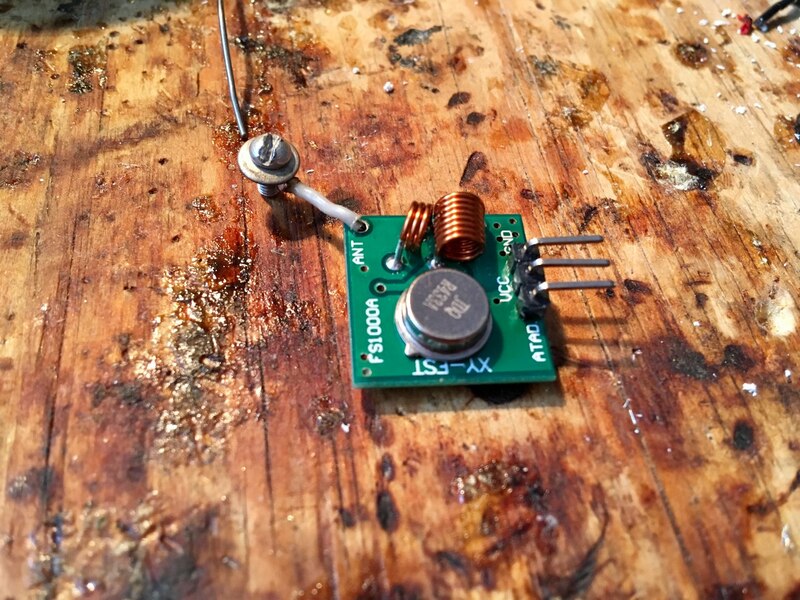 With the help of cut off legs from unnecessary radio components solder jumpers to all contacts become closed (Fig. 9). You should get two multipliers. The final point is the installation of Arduino and installation of all conductors. Use the multipliers to the power supply circuit and earth. 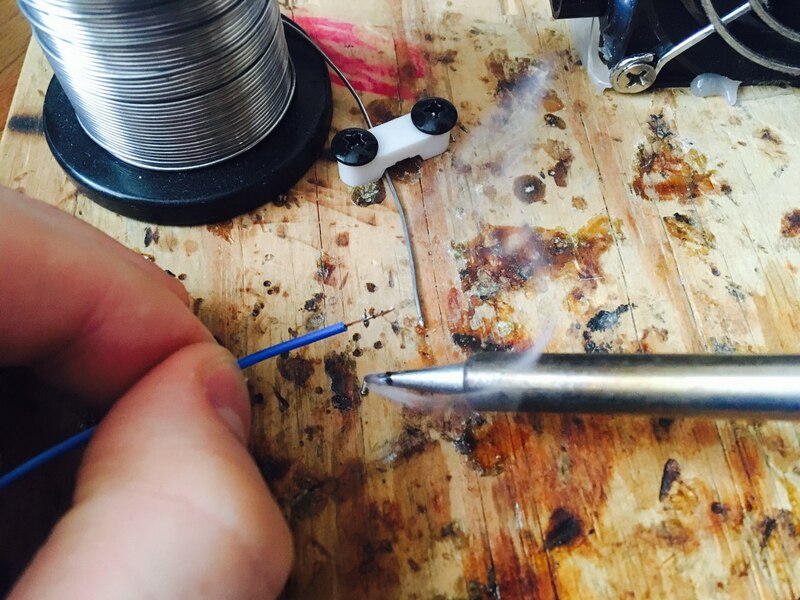 To make sure that the wires do not take up much space-screw them on the marker (Fig. 10). Connect all conductors (Fig. 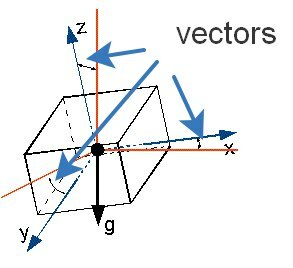 10.1) according to the scheme of inclusion in figure 3. On this installation is fully completed (Fig. 10.2). I wrote a simple function to send a string of up to 24 characters. If the string is shorter, it will be passed repeatedly. The purpose of some noise immunity. 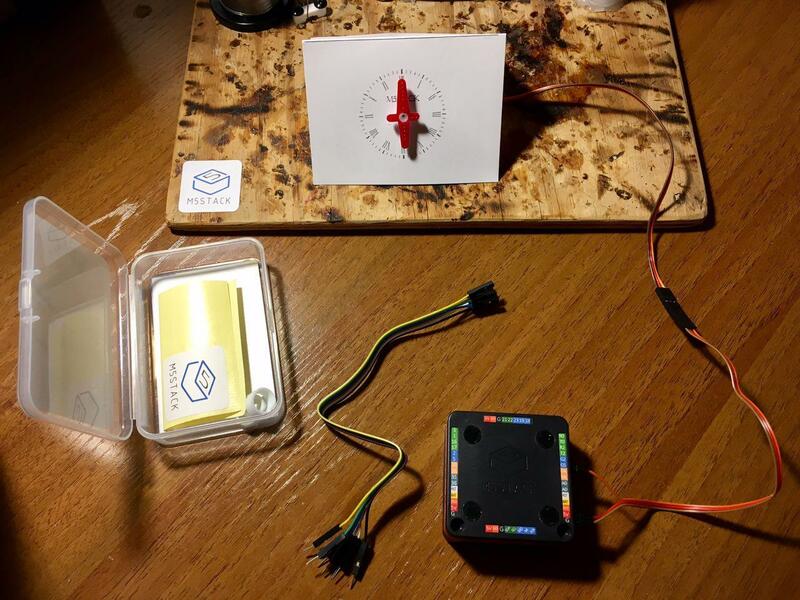 The principle of operation is that every 3000 MS the sensor sends its sensorId + value received from the motion module - LOW and flashes with the led. 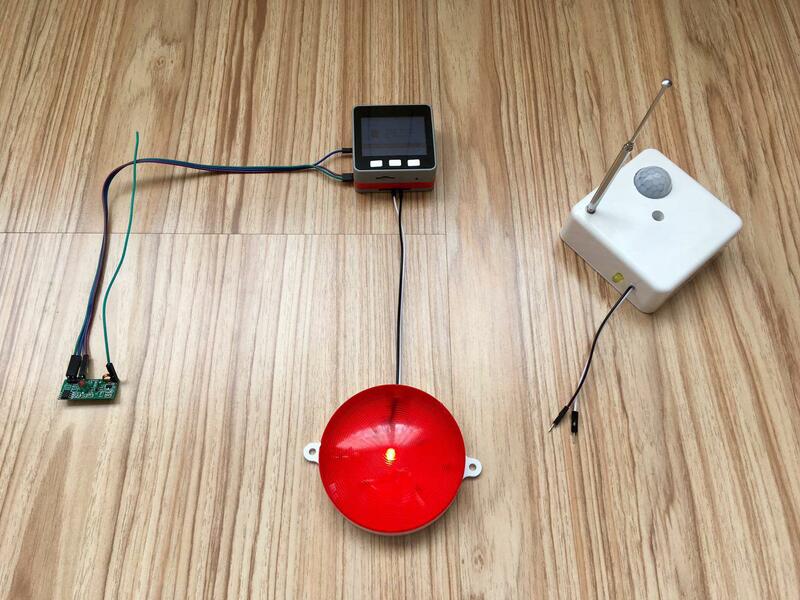 If a HIGH signal is received, the sensor will immediately send out the appropriate level and blink the led more often. 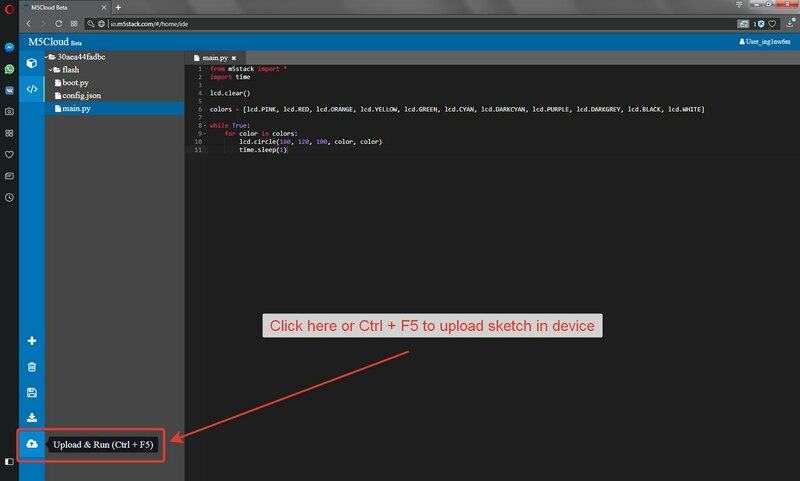 You can connect Arduino Nano and load this sketch. After that, the sensor cover can be closed. 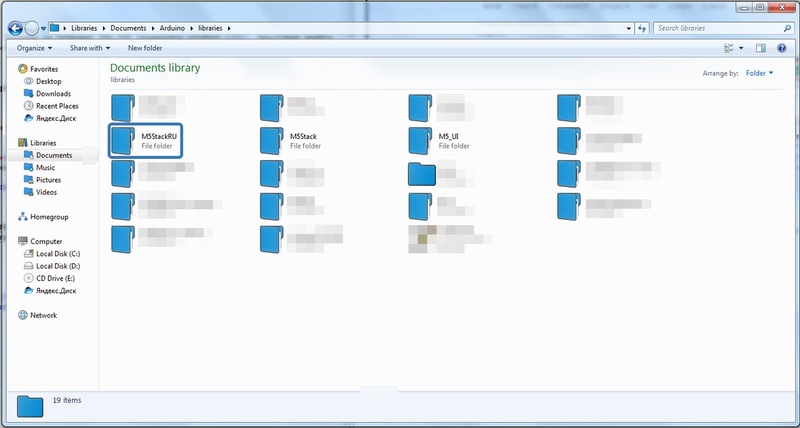 Note the difference between the header file names. Action of the preparation of the receiver to work similar to the action of the preparation of the transmitter. The receipt of data from one of the pipes can be monitored using the radioRX method.available (&k), where k is the pipe number. Reading is performed using a method call radioRX.read (&j, sizeof (j));, where j is an array of 24 characters. The principle of the center is to wait for data from the sensor. If the data is not coming on time (within 10 s), the alarm sounds and the beacon. To suspend protection for 15 seconds, press the B (Central) button. 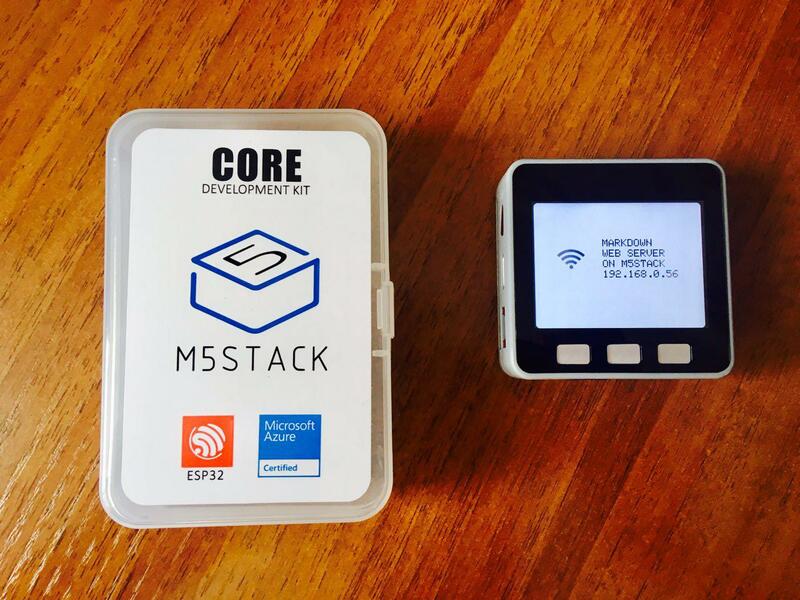 You can connect M5STACK and upload this sketch. After that, do not forget to connect the radio and the beacon to the appropriate contacts. In the section "Download" attached video demonstration. The lesson is completed. 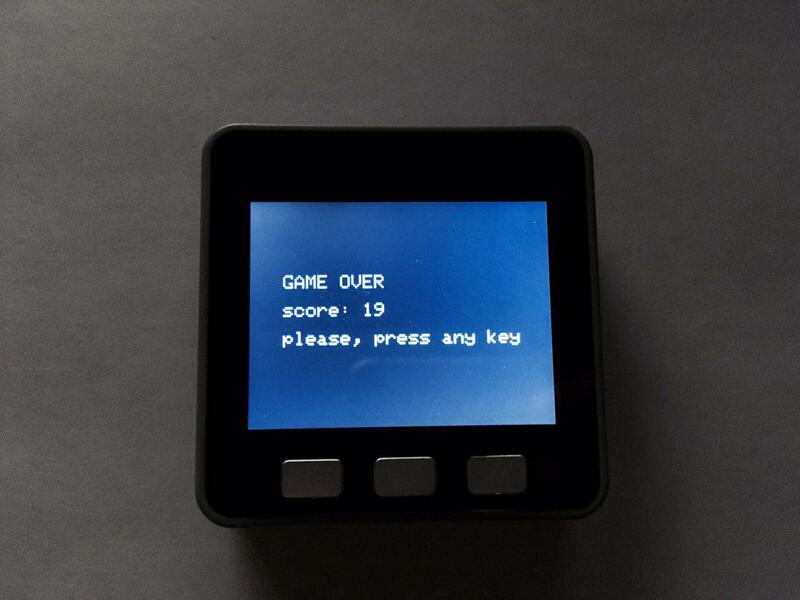 Task 4 difficulty levels: make automatic generation of unique addresses of sensors and automatically register them in the security center. Hi! 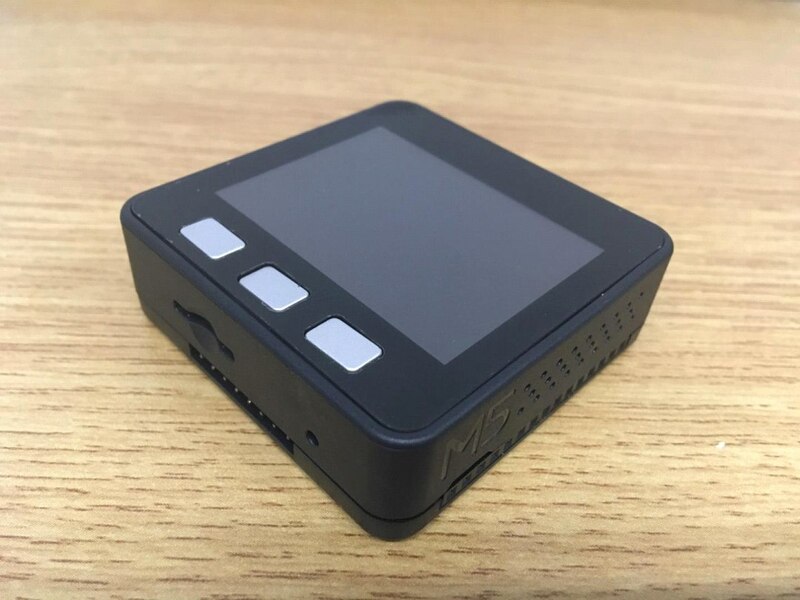 Today we will learn how to connect the TV to M5 STACK and display images and text on it by means of a video signal (Fig. 1). You need to make the gateway M5 black periodically received weather information at the moment from https://openweathermap.org and passed it to via radio 433 MHz, and M5 gray took this information and displayed graphically on a TV. 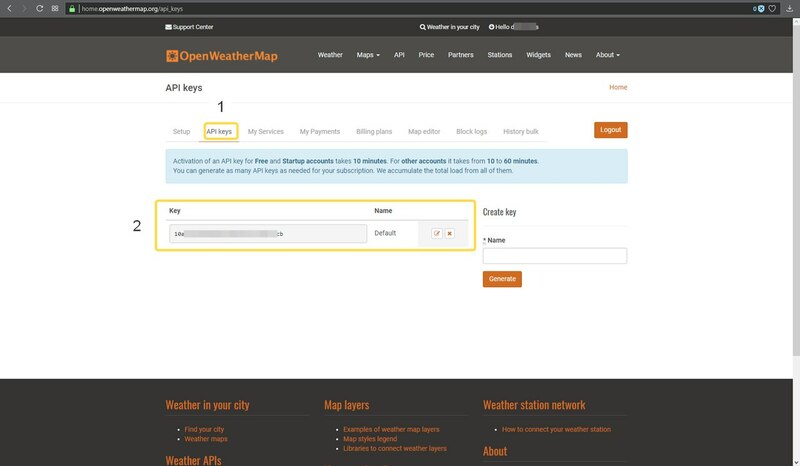 Black installed in M5 TF card with Wi-Fi settings network parameters of the service openweathermap.org. 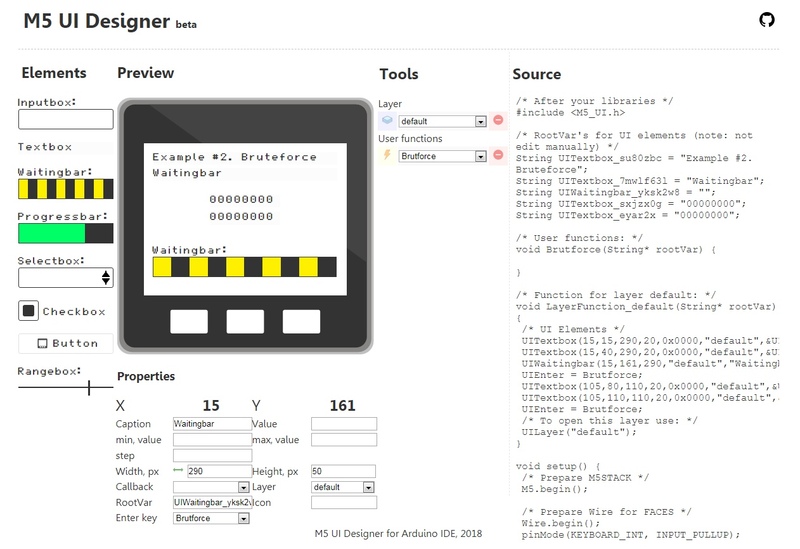 the style file (system/openweather.ini) (Fig. 1.2). A video signal is an electrical signal of a special form (Fig. 2) by means of which the television image is transmitted. 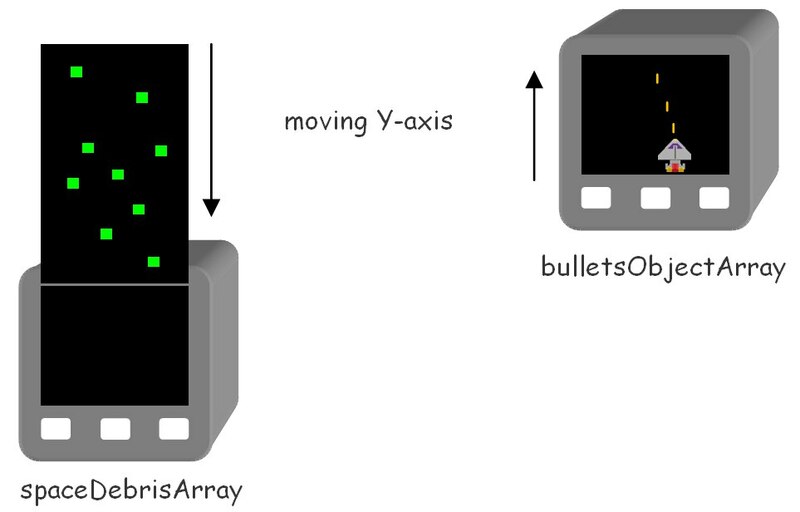 The concept of video signal is applicable to both analog and digital television, as well as to information display systems of computers based on electron-beam tubes. The instantaneous value of the illumination on the photosensitive surface of the television photodetector is converted into an instantaneous value of the voltage at the output of this photodetector. Thus, in the video signal voltage is proportional to the brightness at a given point in the image. 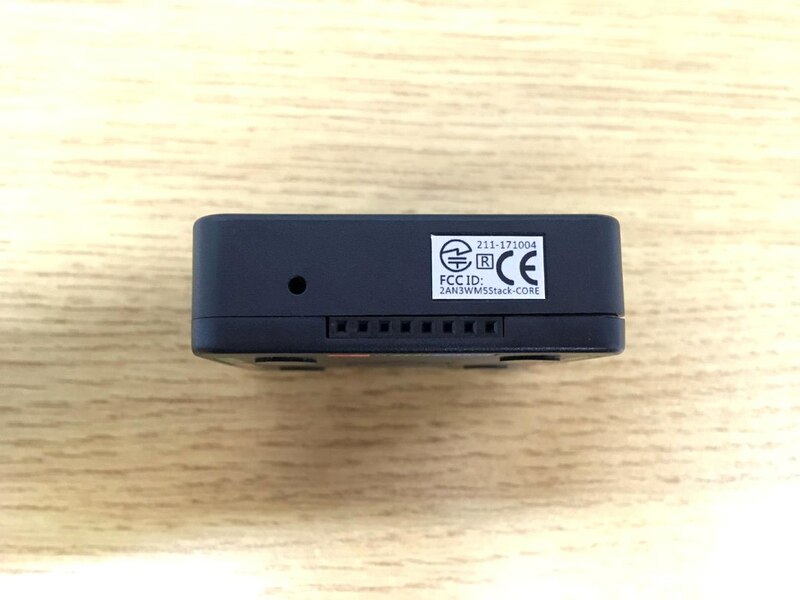 This part of the video signal is called a brightness signal and is used to transmit a black and white video signal or a brightness signal in a color video signal. The range of transmitted brightness values is determined by the level of black and white signals in the video signal. Black level is a minimum luminance signal and corresponds to synchronization signals. It is also simultaneously a reference signal. The white level corresponds to the maximum transmitted brightness level. 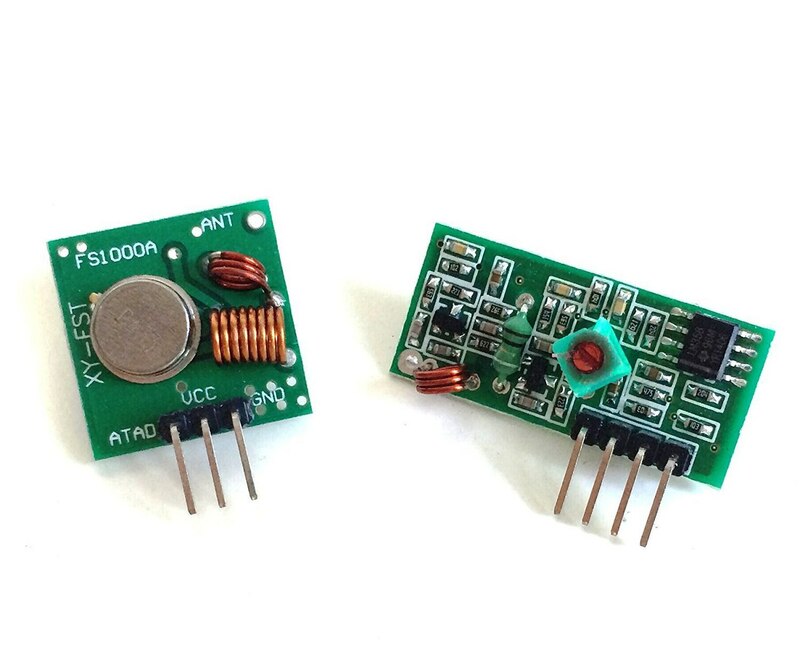 In addition to the brightness signal, the video signal contains service components that ensure synchronization of the signal between the source and the receiver. There are two types of synchronization signals – string and frame. Frame synchronization signals provide information about the start time of each field of the television image in the video signal, as well as information about the type of this field (even or odd). In order to receive weather information you need to register on this resource. Registration is absolutely free and will not take much time (Fig. 3). After registering in your personal account on the site, go to the section API keys and get** Key** access to the service. 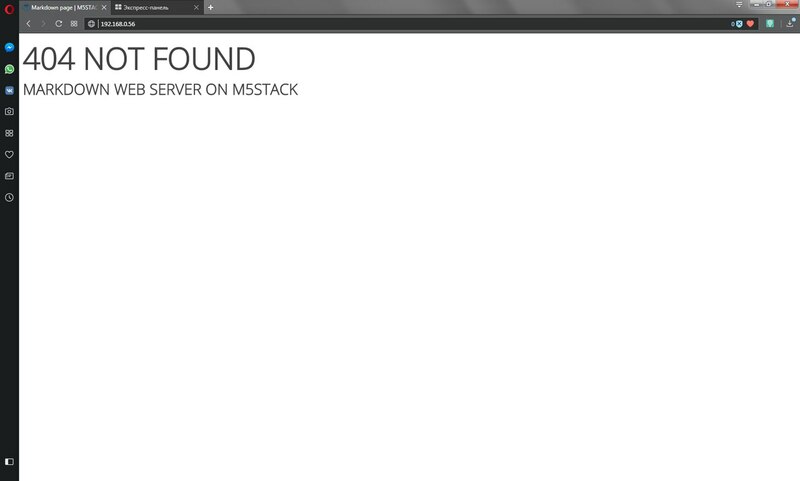 So registration site is completed. Here - just do. 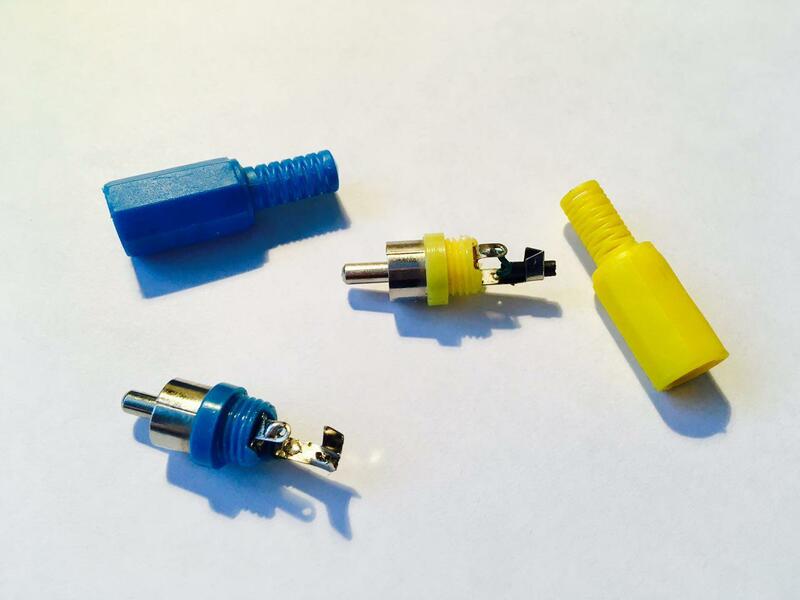 Most importantly, remember that the colored wire should be soldered to the Central contact of the RCA plug (Fig. 4 - 4.2). Note-service nl.lego.city -returns information about your location based on the IP address that you do not need to send in a GET request. 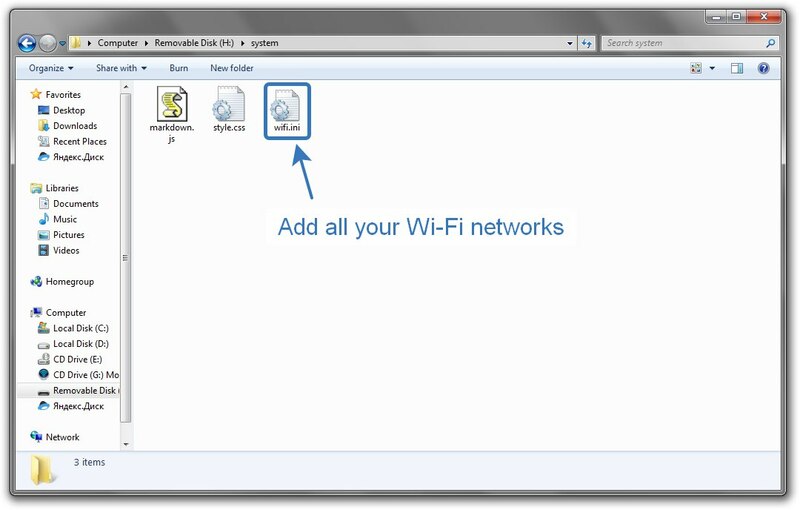 In one of the previous lessons we discussed the function of setting up the wifi using the parameters obtained from the TF card. This time we will modify the body of the function, add the ability to save the configuration file under the operating system MacOS X. The fact that the Mac adds one special. a character at the end of a string is not like Windows-two. So writing the sketch for the transmitter is finished. 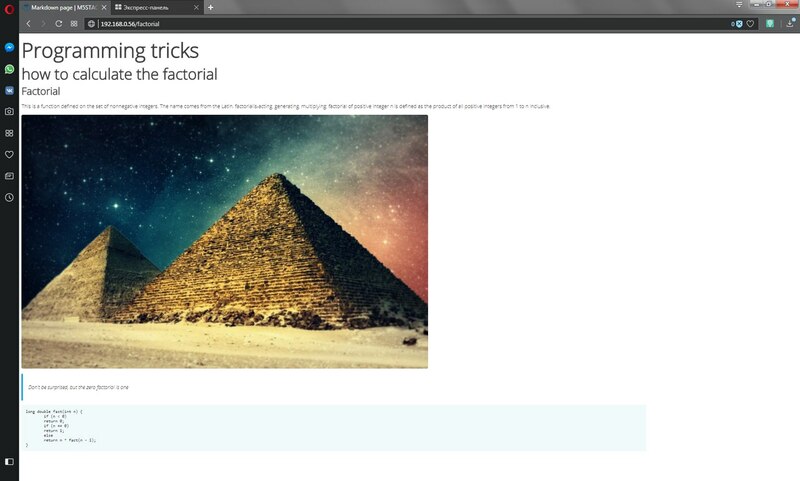 Please note: the image format is different from what we saw in the lessons on working with the built-in display. 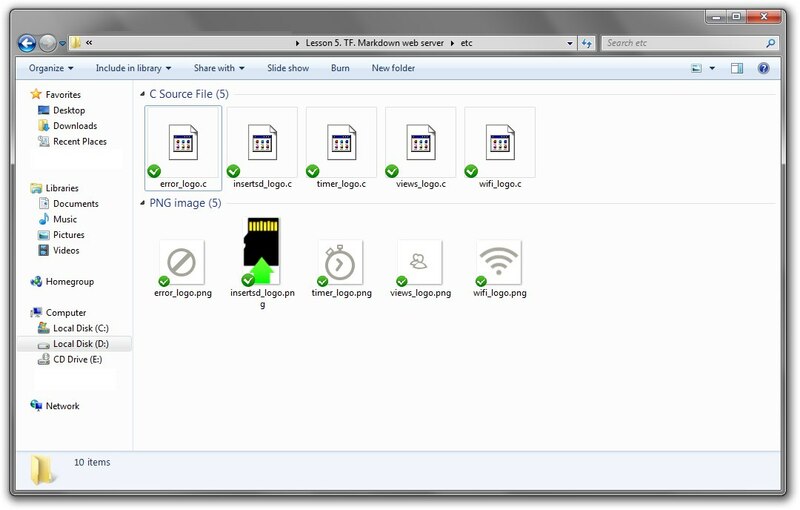 In order to convert the image to display it on TV, you need to use the Converter program from the "Downloads". Hi! Today we will learn how to manage the outlet via the Internet using the service aREST (Fig. 1). 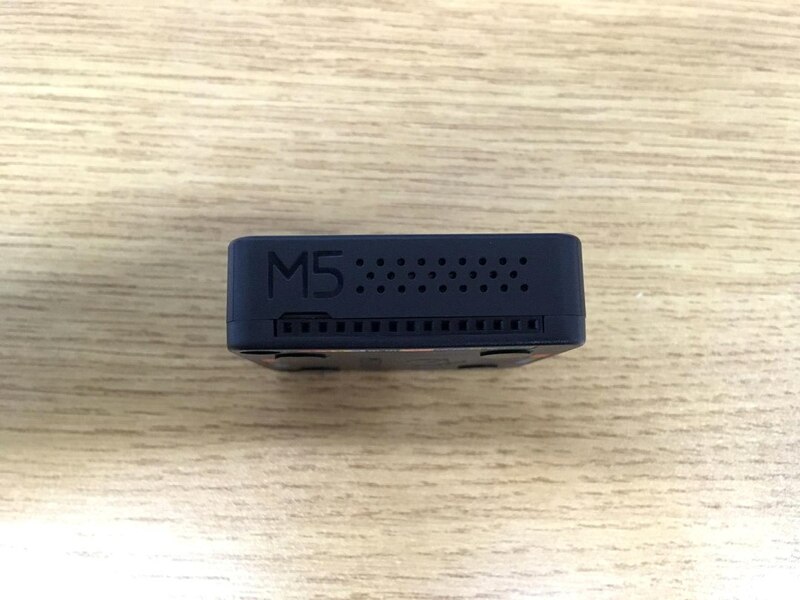 It is necessary to implement the possibility of interaction with M5 over the Internet, provided that we do not have a static IP address allocated by the operator. 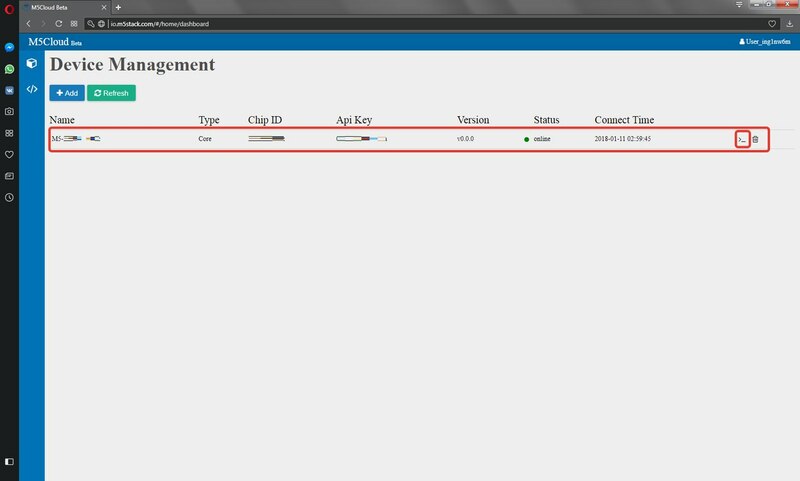 Commands should be generated and sent through the Web control panel. 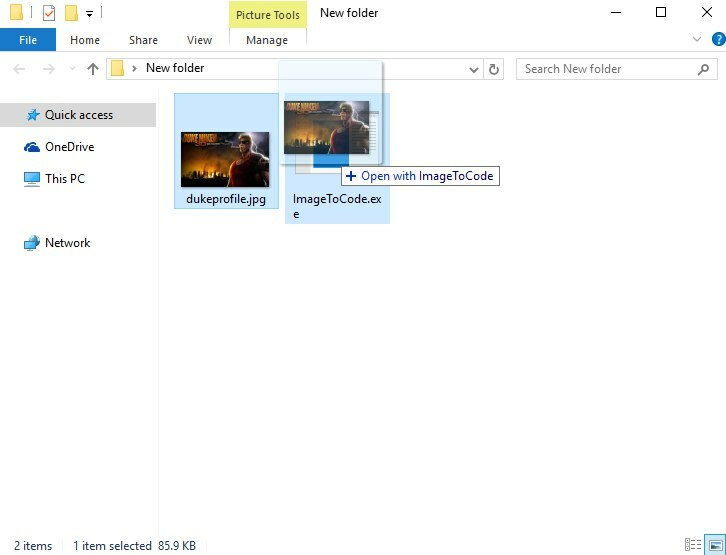 images of emotions (/cutesocket / 0..2.jpg). Sometimes there is a need to interact with things over the Internet. Here, many people are faced with the problem of external access. 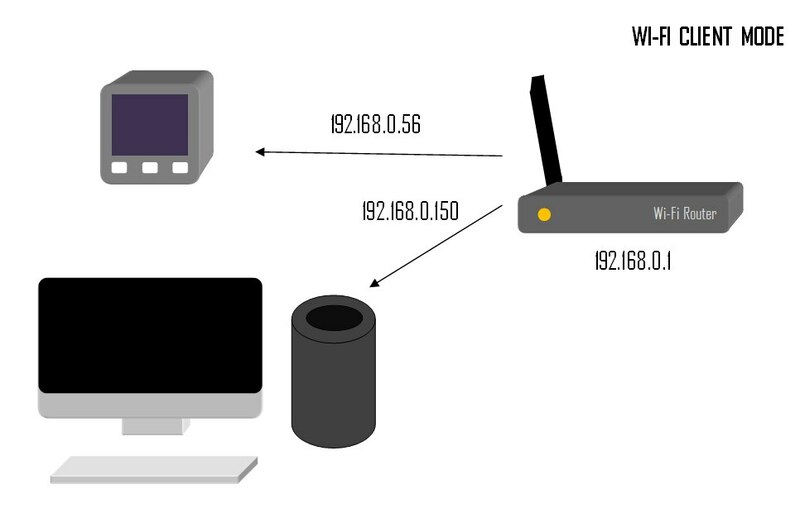 Usually operators distribute their clients dynamic IP-addresses, which are located behind NAT-so it is not so easy to turn on the light in the house, open the gate, etc. You have to pay extra for the operator for static IP; or rent a VPN-server, which is very expensive. One of the solutions is a cloud service https://aREST.io. 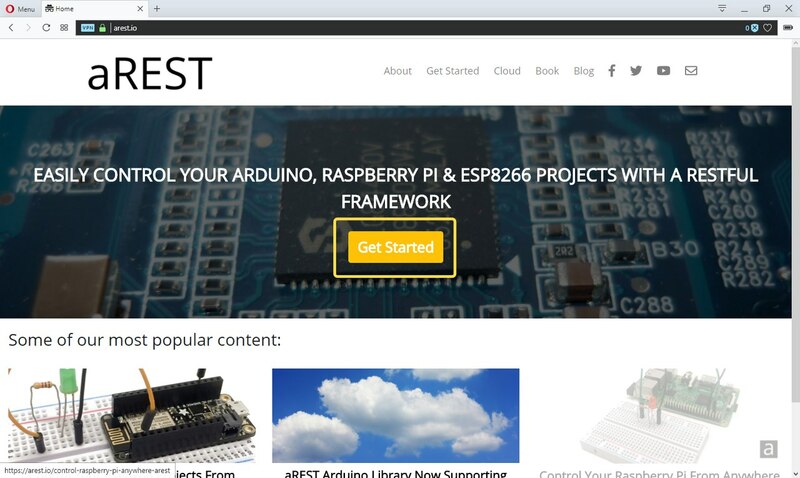 Highly recommend visiting the Get Started section https://arest.io/get-started to learn more about the work of the service. copper wire. Diameter 1 mm, length: 20 cm. Think of the name of the control panel, for example m5stack_cuteSocket (Fig. 2.1). Now log in to the newly created control panel (Fig. 2.2). 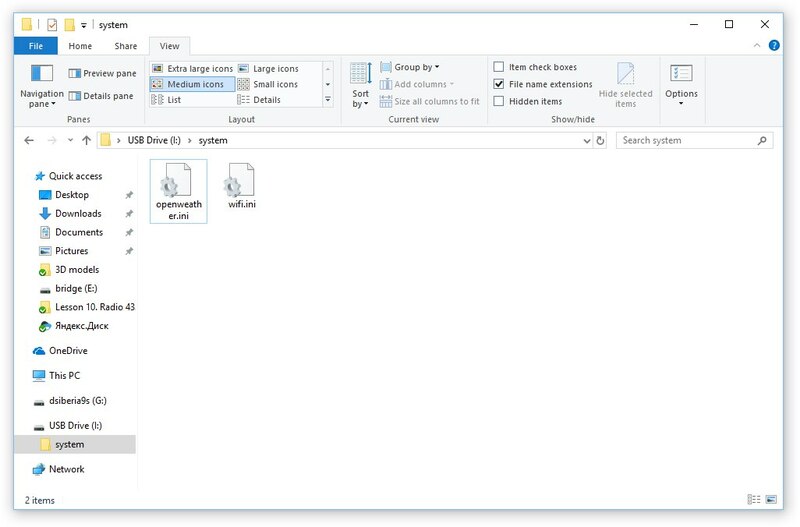 Click the Show Edit Mode button (Fig. 2.3). Okay, now let's create a new control (Fig. 2.4). 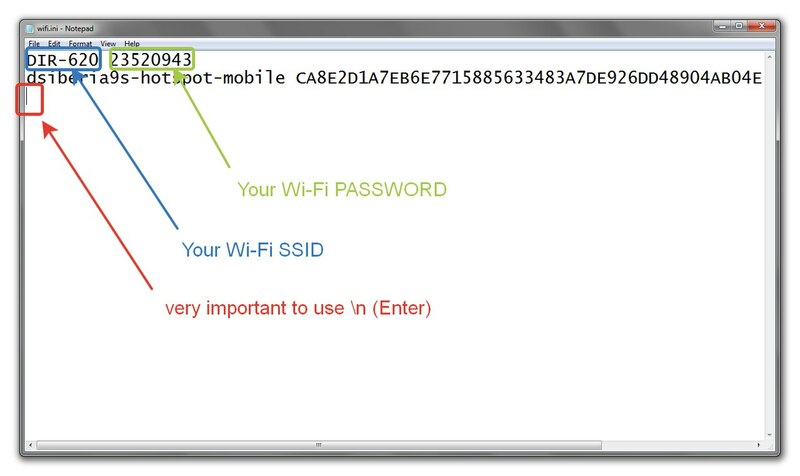 Think of the control name and write it in the first field, the second - the unique number of your device, the third - the type of data, the fourth number of the physical contact on the device, the fifth - the type of control. Then click to create new element button. So registration is completed. The control panel is ready to work (Fig. 2.5). 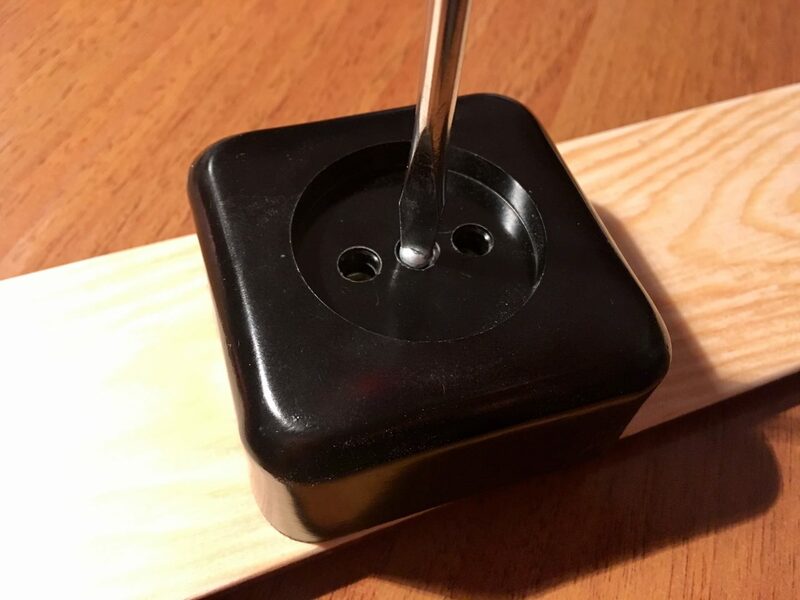 Take the outlet (depending on the region type may vary) and disassemble (Fig. 3 - 3.1). 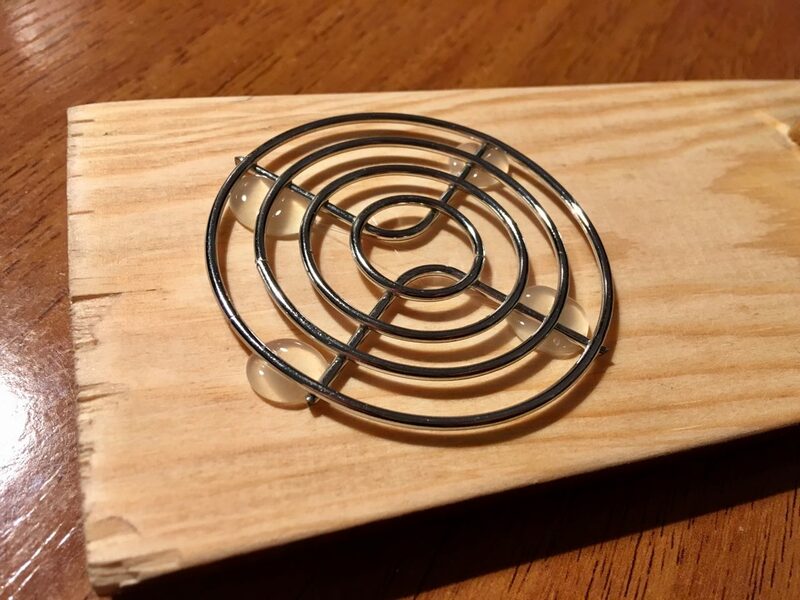 Take a wire with a diameter of 1 mm and make two identical segments of 10 cm. 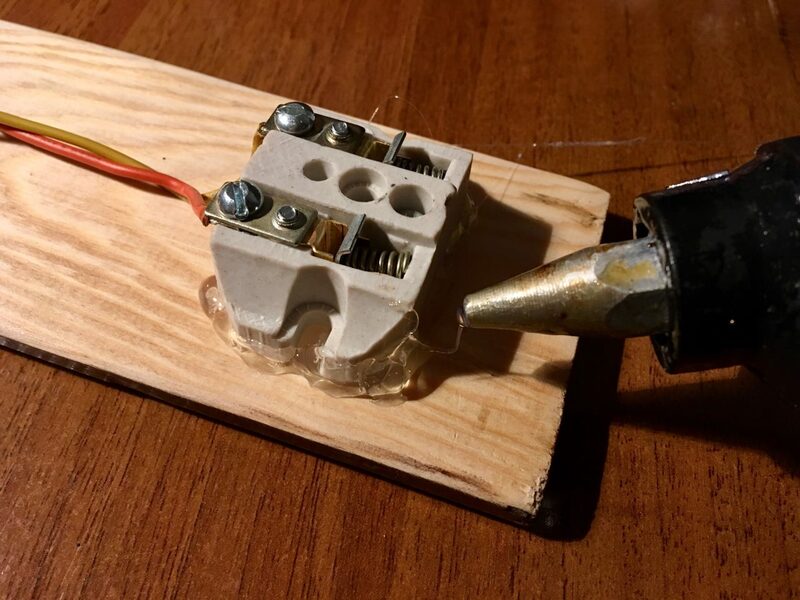 Next, using a soldering iron, screw the ends and fix them with screws and screwdrivers on the contacts of the socket (Fig. 3.2-3.3). 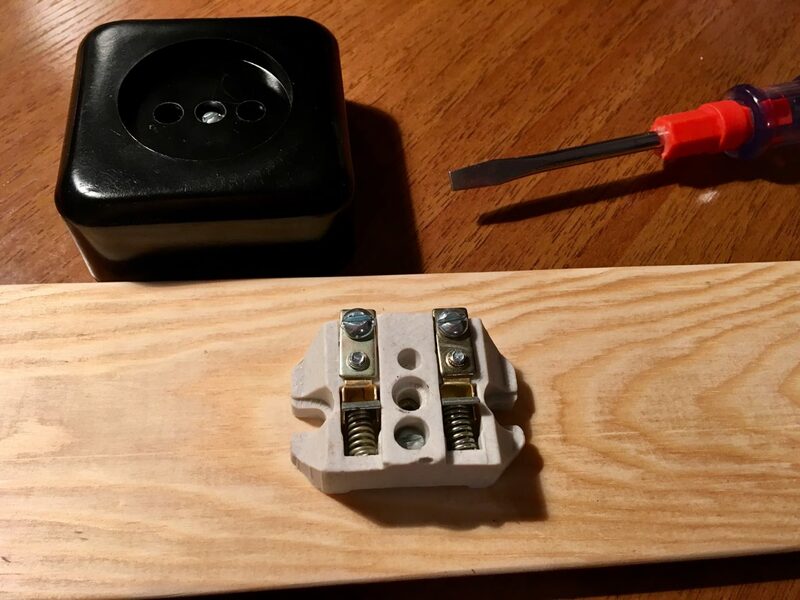 Take glue and mount the base socket on the center Board (Fig. 3.4). 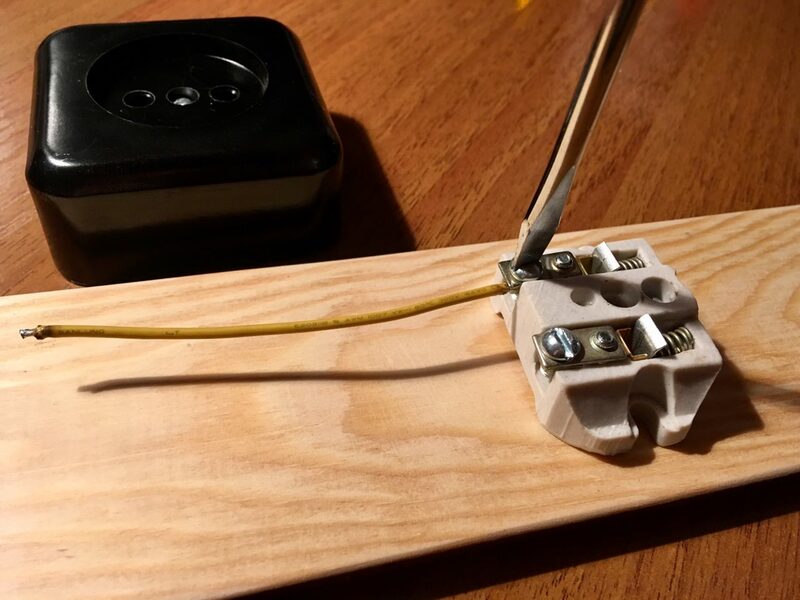 Replace the outlet cover. Take the relay module and fix the wires in the pins with a screwdriver (Fig. 3.5). 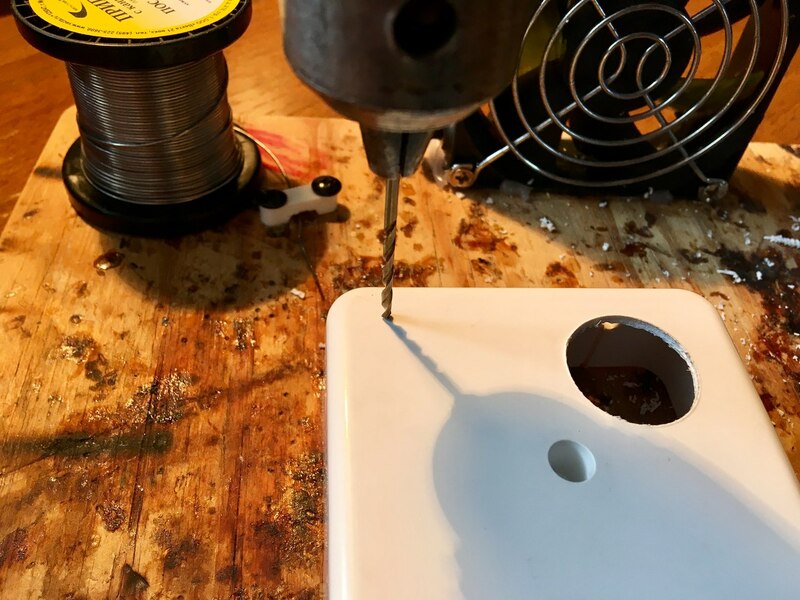 Make four holes with a diameter of 2.5 mm and install nuts in them (from the place of fastening of the motherboard from the PC case) (Fig. 3.6). Install the module on the nuts and lock with screws (Fig. 3.7). 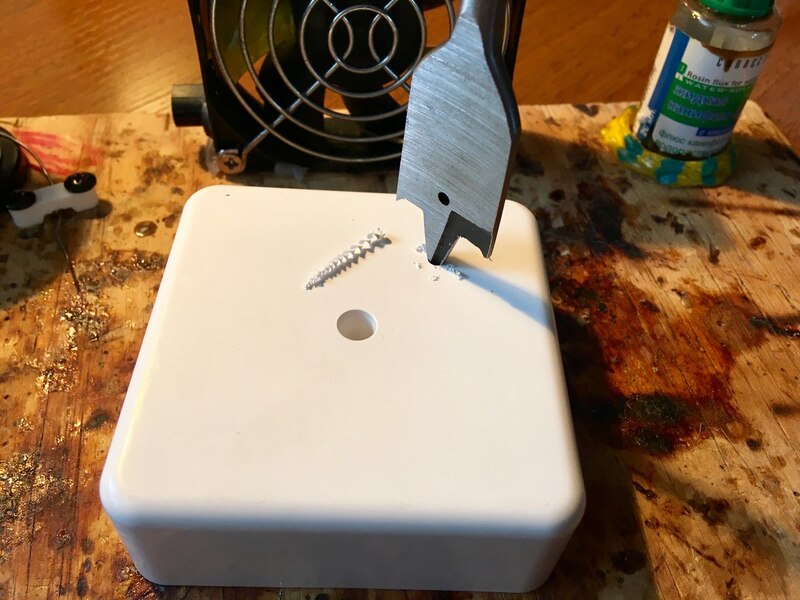 Take a protective grid from the PC cooler and bite off the fixing loops with the help of cutters. 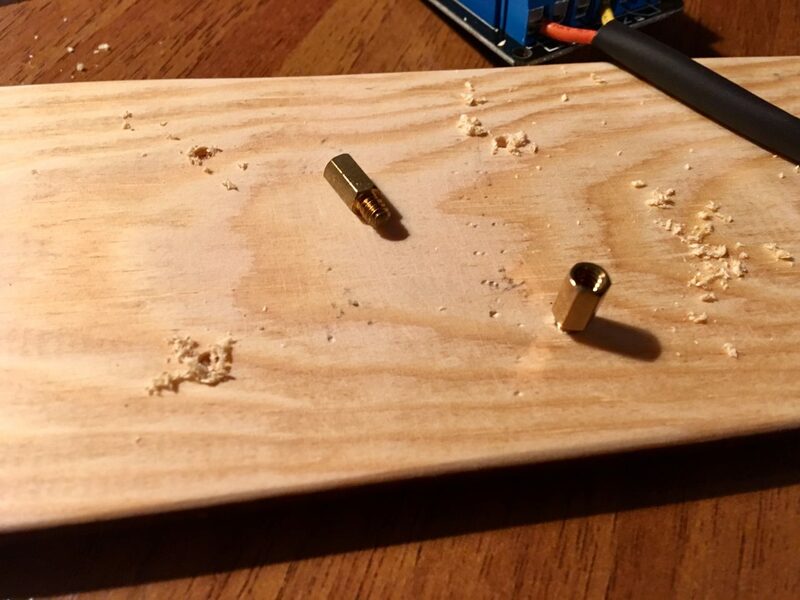 Next, use a hot glue stick to the Board (Fig. 3.8). 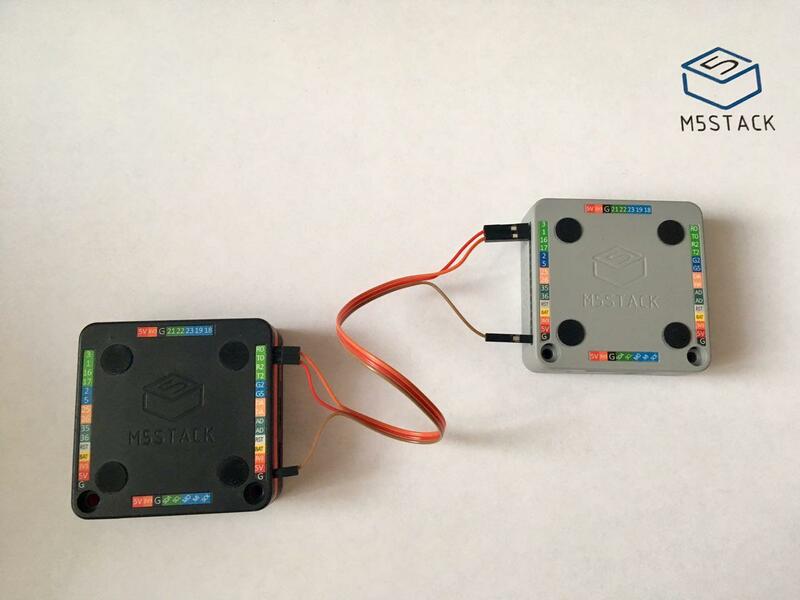 Install the M5 on the grid and connect it to the relay module using colored wires (Fig. 3.9). Hi! 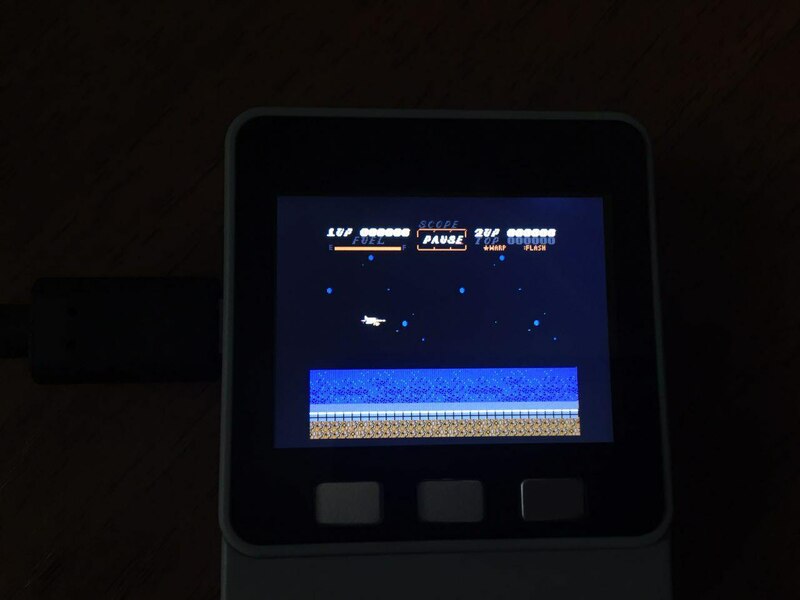 Today we will learn how to download games from NES to M5 ROM (Fig. 1). 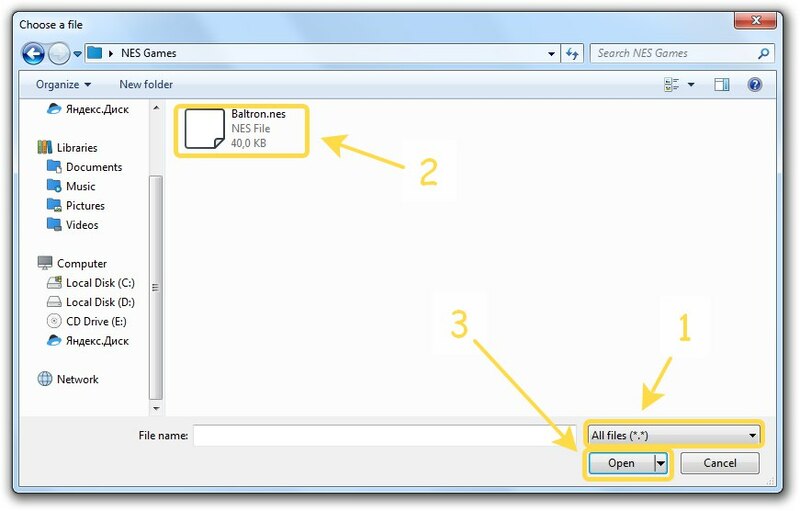 We also need to download the program ESPFlashDownloadTool_v3.6.3 and game file for NES (file size should be approximately 35 KB). 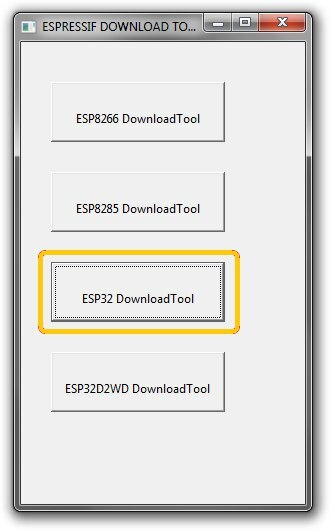 In the window that appears, select ESP32 DownloadTool (Fig. 3). 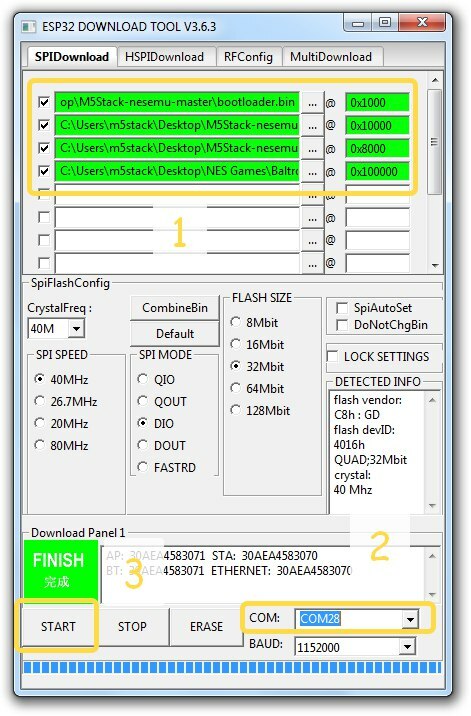 Select the serial port as shown in figure 4 area 2. 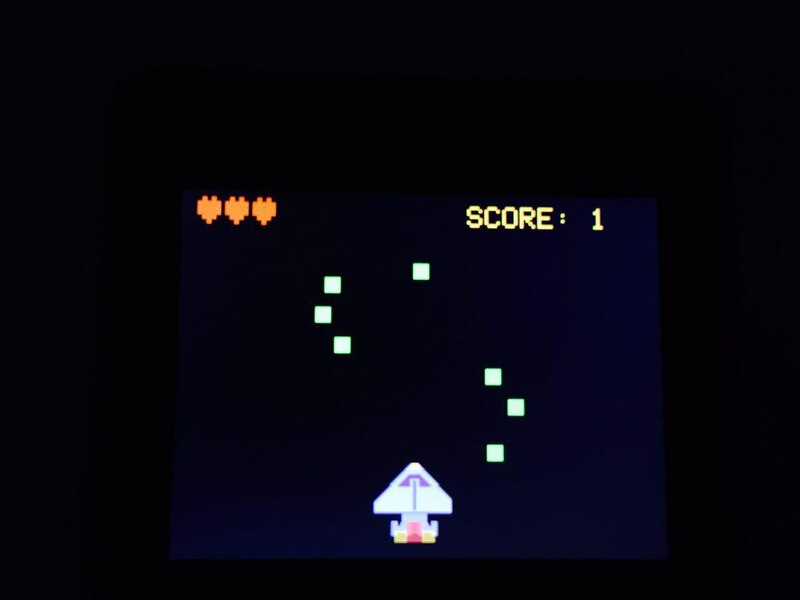 Press THE start button (Fig. 3 area 3). 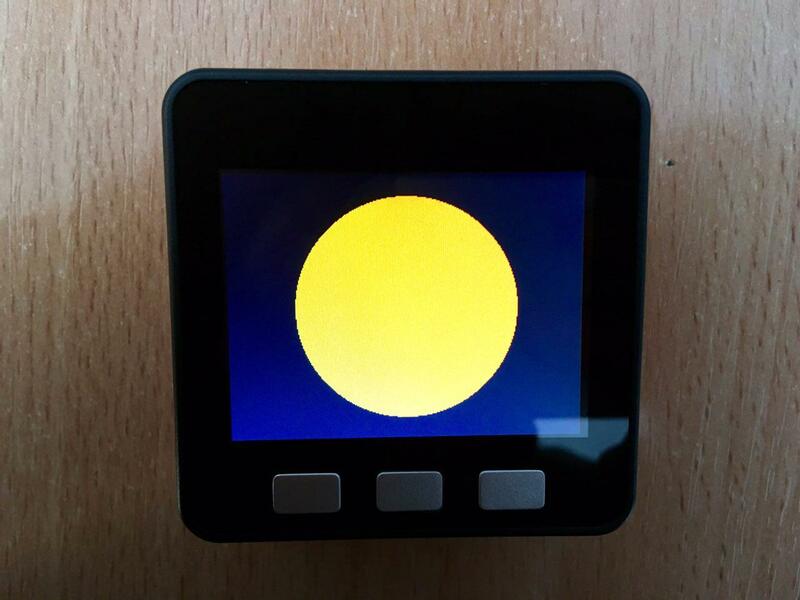 After the firmware is finished, FINISH will appear above the start button. Then disconnect the cable from the M5 and press the power button. 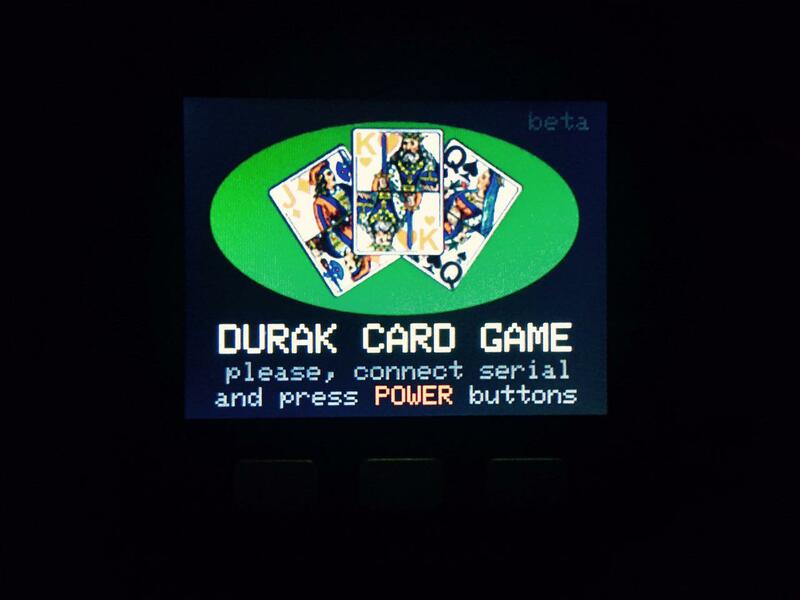 After pressing the power button, the device will reboot and the game will start (Fig. 6 - 6.1). Привет! Сегодня мы познакомимся с такой заманчивой штукой как M5 UI. Это библиотека предназначенная для создания пользовательского интерфейса. Благодаря M5 UI Вы можете с помощью пары строк кода подключать всевозможные поля, кнопки, ползунки и переключатели, создавать условные слоя. Несмотря на то, что процесс подключения элементов UI очень прост, Вы также можете воспользоваться наглядным инструментом M5 UI Designer for Arduino IDE. Необходимо рассмотреть все существующие на сегодняшний день элементы из библиоткеки M5 UI на практике, так же ознакомиться с процессом создания интерфейса в приложении M5 UI Designer. Графический интерфейс представляет собой совокупность функциональных элементов, необходимых для взаимодействия с пользователем. В качестве таких элементов выступают всевозможные поля ввода/вывода текста, кнопки, чекбоксы, ползунки, переключатели и многие другие. В качестве примера графического интерфейса давайте посмотрим на рисунок 2. 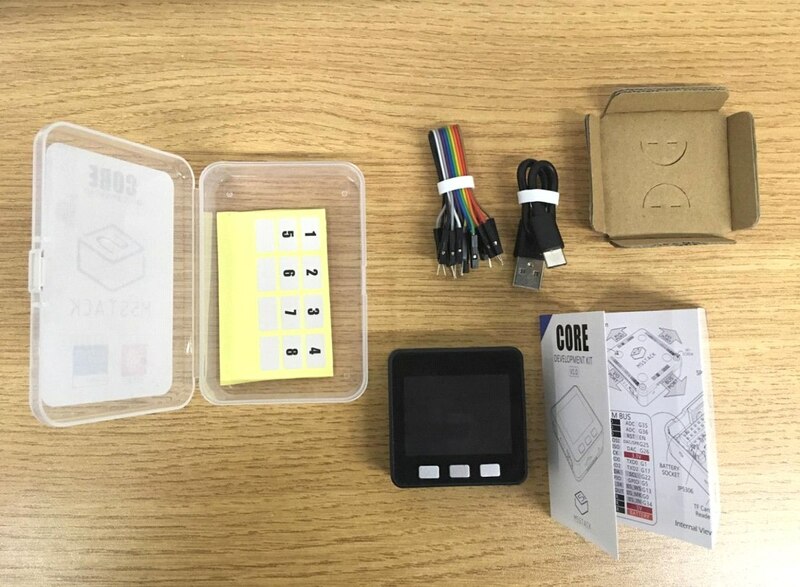 Inputbox представляет собой область ввода текстовой информации на экране с фиксированной высотой 50 px. Ширина может быть задана пользователем, но не может быть меньше 32 px. В верхней части располагается надпись (например: Enter user name), обратите внимание на то, что в конце автоматически будет добавлен символ ':'. В нижней части располагается прямоугольная область, в которую пользователь может вводить данные с клавиатуры. При наведении фокуса на данный элемент - происходит подсветка нижней части. Для того чтобы изменить значение используйте клавиши с буквами и цифрами на клавиатуре. Textbox представляет собой область вывода текстовой информации на экране. Размеры могут быть заданы пользователем, но не могут быть меньше размеров одного символа. Состоит данный элемент из одной части. Текст умещается по всей площади и не выходит за пределы. Наведение фокуса на данный элемент не предусмотрено. Waitingbar представляет собой область вывода графической информации на экране с фиксированной высотой 50 px. Ширина может быть задана пользователем, но не может быть меньше 12 px. В верхней части располагается надпись (например: Connection to Wi-Fi), обратите внимание на то, что в конце автоматически будет добавлен символ ':'. В нижней части располагается прямоугольная область, которая закрашивается периодически оранжевыми и черными квадратами. Наведение фокуса на данный элемент не предусмотрено. Progressbar представляет собой область вывода графической информации на экране с фиксированной высотой 50 px. Ширина может быть задана пользователем, но не может быть меньше 12 px. В верхней части располагается надпись (например: Times of the check), обратите внимание на то, что в конце автоматически будет добавлен символ ':'. В нижней части располагается прямоугольная область, которая закрашивается в зависимости установленного значения (до 10% - красным, до 30% - оранжевым, до 80% - зелёным, до 100% - синим цветом). Наведение фокуса на данный элемент не предусмотрено. Selectbox представляет собой область выбора текстовой информации на экране с фиксированной высотой 50 px. Ширина может быть задана пользователем, но не может быть меньше 44 px. В верхней части располагается надпись (например: Mode), обратите внимание на то, что в конце автоматически будет добавлен символ ':'. В нижней части располагается прямоугольная область выбора, в которой пользователь может выбирать данные с клавиатуры. Для того чтобы изменить значение нажмите клавишу Fn, затем K / M или аналогично стрелки вверх / вниз. Checkbox представляет собой область ввода единственного значения (true/false) на экране с фиксированной высотой 32 px. Ширина может быть задана пользователем, но не может быть меньше 44 px. В левой части расположен флаг (если закрашен, то true, если нет - false). В правой части располагается надпись (например: Remember password). Для того чтобы снять или установить флаг нажмите клавишу SPACE. Button представляет собой область вызова любой пользовательской функции (с сигнатурой void (String*)) с фиксированной высотой 32 px. Ширина может быть задана пользователем, но не может быть меньше 22 px. По центру располагается надпись (например: Launch). Отличительной особенностью данного элемента является поддержка иконок из стандартного набора (рис. 3). Для того чтобы нажать на кнопку нажмите клавишу SPACE. Если будет подключена иконка, то минимальная ширина будет 51 px. Rangebox представляет собой выбора целого числового значения из заданного диапазона с фиксированной высотой 50 px. Ширина может быть задана пользователем, но не может быть меньше 32 px. В верхней части располагается надпись (например: Speed), обратите внимание на то, что в конце автоматически будет добавлен символ ':'. В нижней части располагается область содержащая полосу и прилегающий ползунок. Для того чтобы изменить значение нажмите клавишу Fn, затем N / $ или аналогично стрелки влево / вправо. электродвигатель постоянного тока (1 шт.). 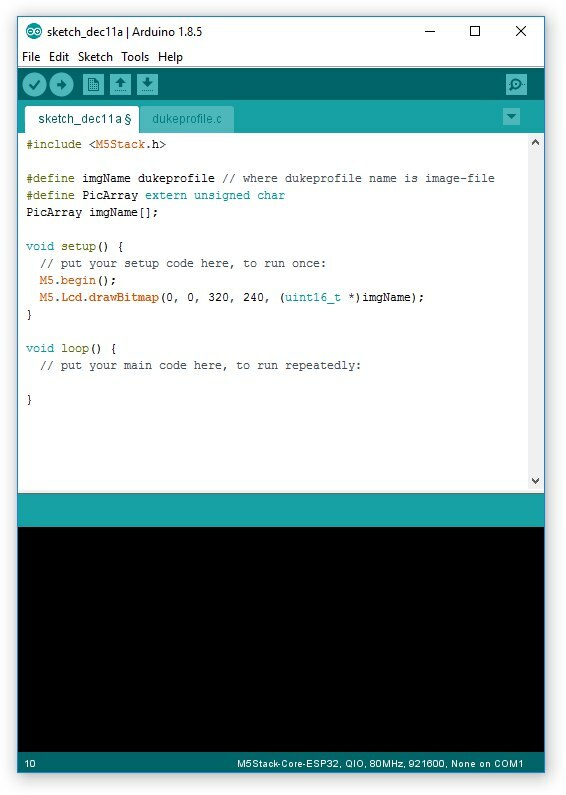 Перейдите по ссылке M5 UI for Arduino IDE в разделе Downloads (внизу этой страницы) и скачайте архив с библиотекой с GitHub (рис. 3.1). 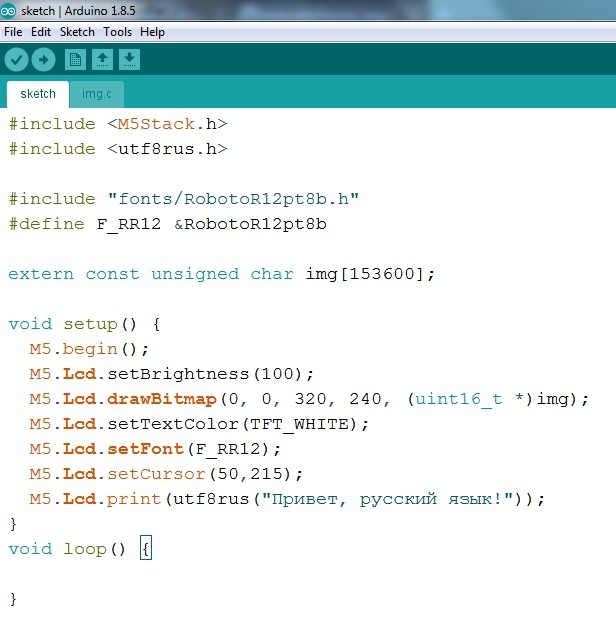 Запустите Arduino IDE и добавьте скаченный архив (рис. 3.2). После этого библиотека будет успешно добавлена. На этом всё. На этом установка инструмента завершена (рис. 3.5). Представьте себе такую ситуацию - пользователь ввёл необходимую информацию в тот же Inputbox и ему необходимо её обработать, например: отправить куда-нибудь. Как сообщить M5 что пользователь завершил ввод? Верно - нажатием на клавишу Enter (как один из вариантов). В любом месте кода Вы всегда можете привязать пользовательскую функцию к клавише Enter, главное - чтобы сигнатура пользовательской функции была следующей void (String*). 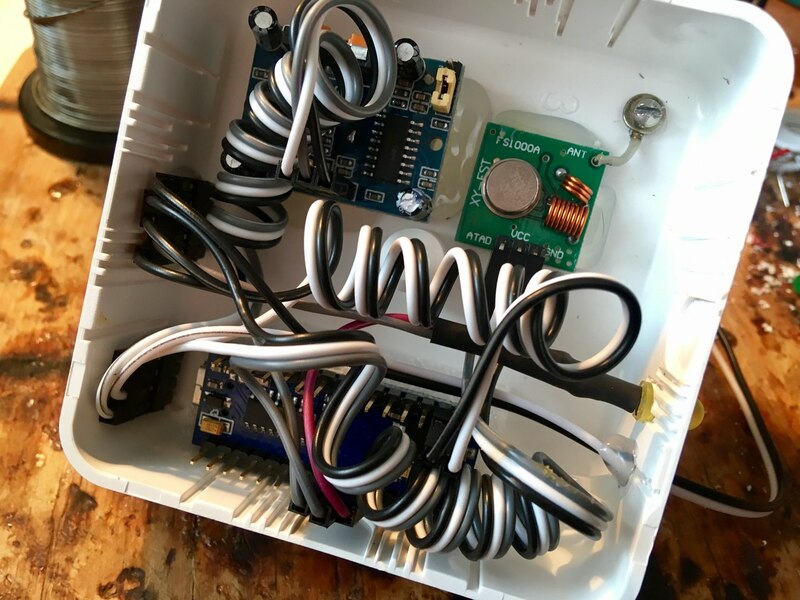 Давайте добавим первый наш элемент - Inputbox. В него мы будем вводить текст и после нажатия на клавишу Enter будем слышать из динамика код Морзе (рис. 4). 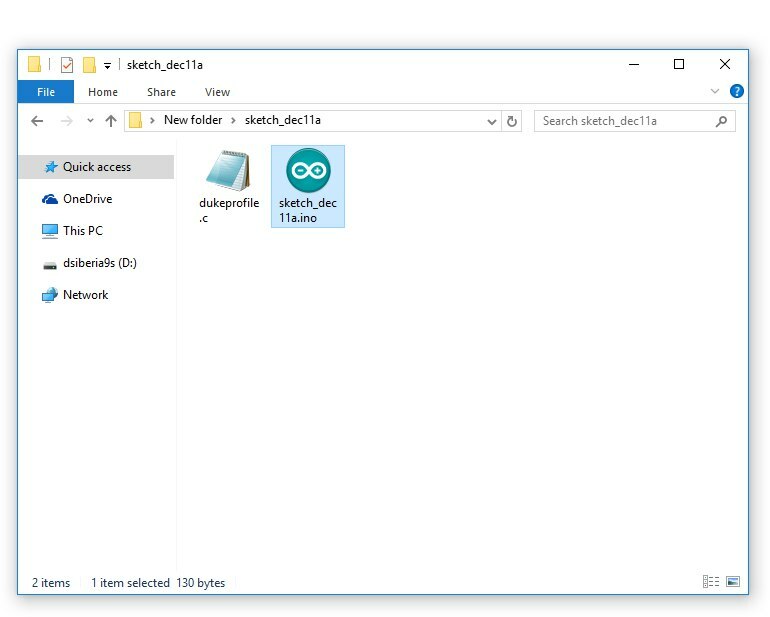 Откройте M5 UI Designer, перетащите Inputbox и Textbox, задайте ширину и заголовокти. 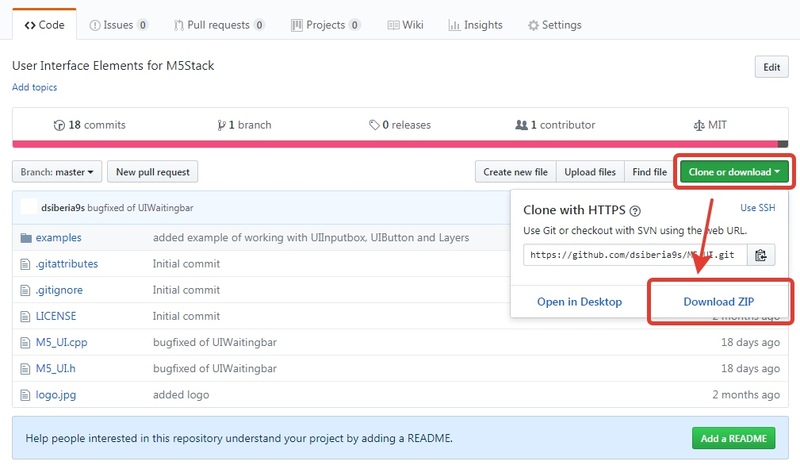 В разделе Tools > User Functions нажмите на значок "жёлтая молния" и введите имя новой пользовательской функции Morse. Затем в разделе Properties > Enter key выберите Morse (рис. 4.1). 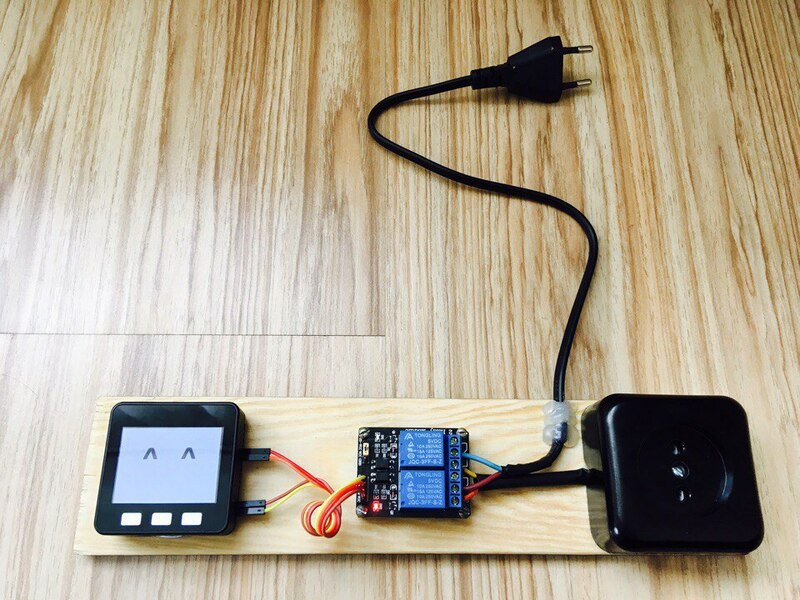 Выделите весь текст из раздела Source и скопируйте в Arduino IDE. 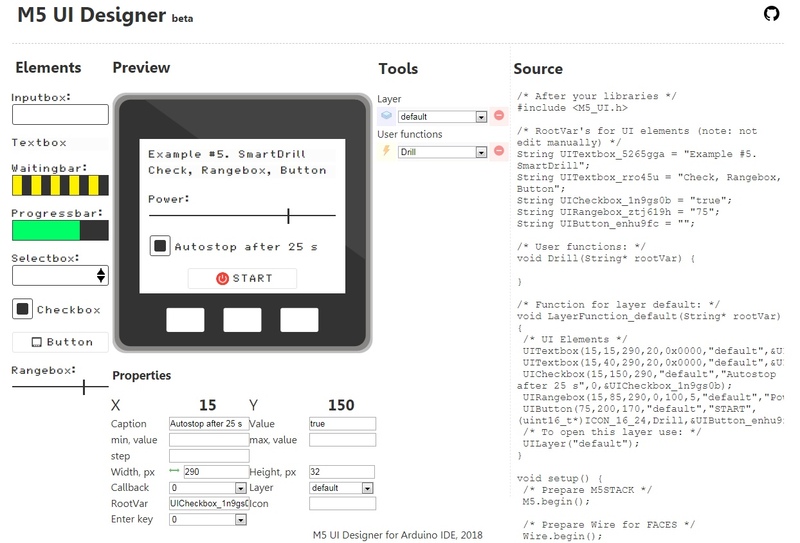 Как видите - весь каркас кода сгенерированный M5 UI Designer остался абсолютно в стандартном виде без изменений. 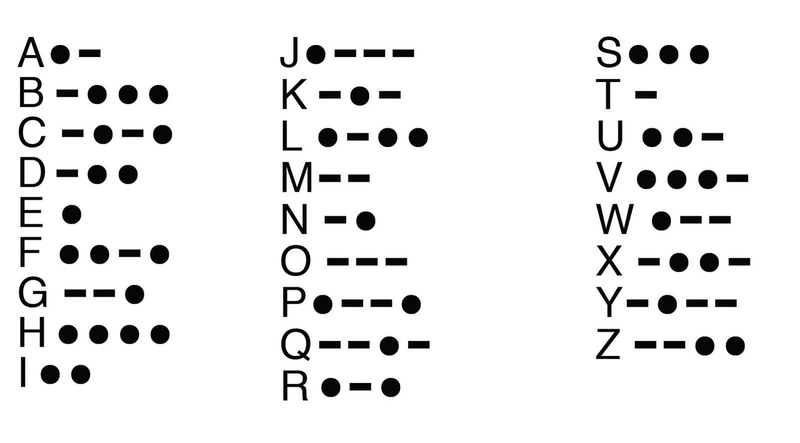 Единственное, что мы изменили - пользовательская функция Morse. Всё очень просто :) (рис. 4.2). Аналогичным образом добавим Waitingbar. Будем генерировать 8-битный случайный код, а затем его подбирать. Индикатором процесса будет как раз Waitingbar. После того, как код будет подобран Waitingbar будет скрыт. Запуск процесса будет происходить после нажатия на клавишу Enter (рис. 5). В этом примере мы несколько модифицируем функцию слоя default добавлением void UIDiable(bool, String*) после перечисления элементов. Это необходимо для того, чтобы Waitingbar был скрыт на время бездействия. void UIDisable(bool, String*) или void UISet(String*, int) используется для того, чтобы скрыть элемент. Где bool - может принимать значения true/false т.е. скрыть/показать элемент; String* - указатель на rootVar (корневая переменная) элемента. Для того, чтобы установить значение для элемента используют функцию void UISet(String*, String) или void UISet(String*, int). Где String* - указатель на rootVar (корневая переменная) элемента; String или int - новое значение. Теперь запустим и посмотрим, что получилось (рис. 5.1). Давайте сделаем тестер заряда обычных пальчиковых батареек типа A, AA, AAA. Индикацию будем осуществлять с помощью Progressbar в процентном соотношении, а в дополнении внизу с помощью Textbox будем отображать напряжение в мВ (рис. 6). Постоянно, каждые 500 мс, в цикле будем снимать показания с АЦП порт 0 (контакт 35). Затем будем рассчитывать напряжение: 3400 мВ - это опорное напряжение, 4096 - разрешающая способность АЦП. Схема включения приведена на рисунке 6.1. Устройство работает здорово! Теперь у Вас есть отличный инструмент для проверки батареек (рис. 6.2). Возьмем четыре светодиода (оранжевый, зелёный, красный и жёлтый) подключим их через сдвиговый регистр 74HC595N к M5 по схеме на рисунке 7. 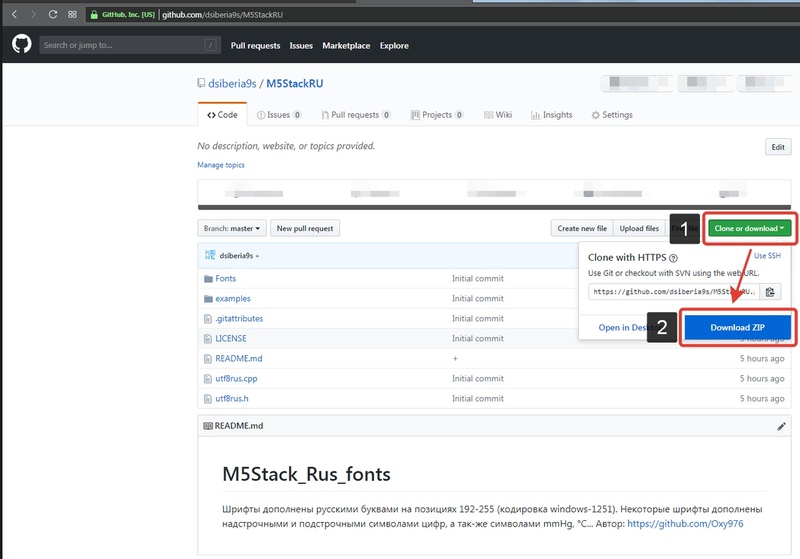 Создадим графический интерфейс с помощью M5 UI Designer, как в предыдущих примерах, и скопируем код (рис. 7.1). 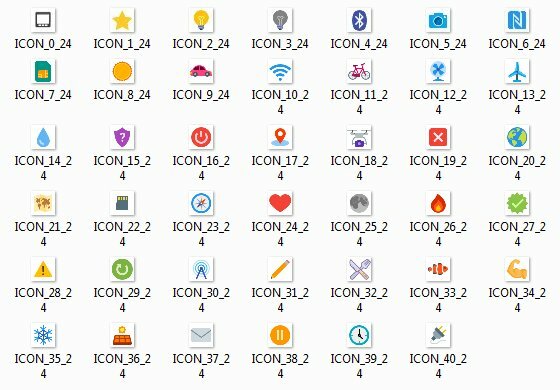 Для того, чтобы получить значение выбранной опции из Selectbox используют функцию String UIOptionValue(String*). На этом всё! :) (рис. 7.2). Что может объединить Rangebox, Checkbox и Button? Верно! - станок для сверления. Возьмём электродвигатель постоянного тока (например, от кассетного плеера), транзистор (чтоб по мощности подходил), резистор чтоб перекрывать ток базы, немного проводов, макетную плату и соберём! Бывает необходимо делать несколько отверстий одно за одним, а бывает необходимо сделать всего одно, поэтому возникает идея выделять некоторое время на работу дрели, а потом отключать её автоматически: тут нам на помощь приходит Checkbox. Кнопка Enter здесь нам не пригодится, поэтому Enter key для всех элементов останется пустым (нулем). Взамен мы будем вызывать пользовательскую функцию Drill с помощью свойства Callback для кнопки. Что у нас по коду? После RootVar's добавим bool startStatus, которая позволит программе понимать запущен ли двигатель или нет. Ура! Теперь можно пробовать сверлить (рис. 8.1). В разделе "Downloads" прилагаются видео с демонстрацией работы. На этом урок завершён. 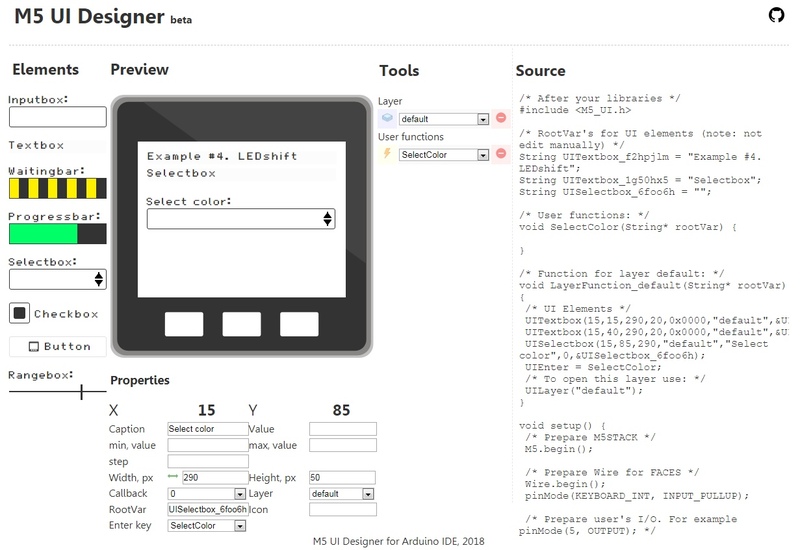 This lesson focuses on the integrated LCD display. 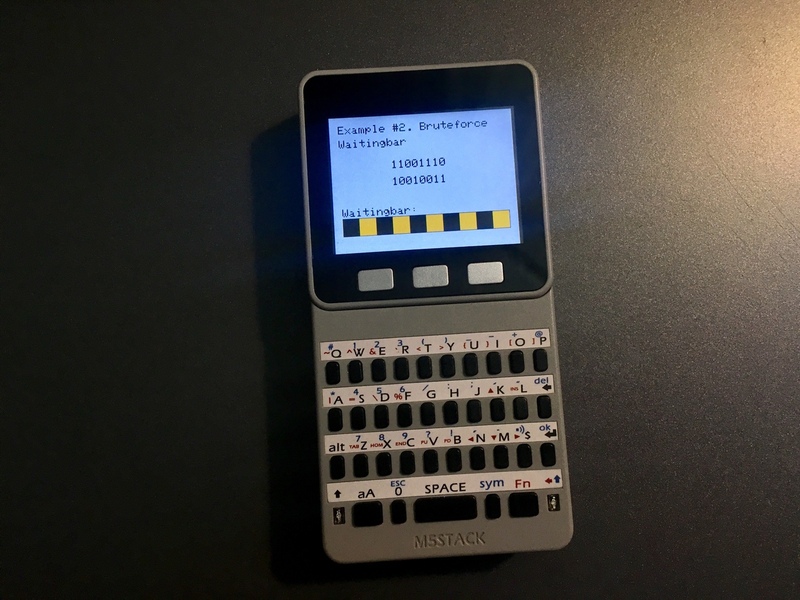 We will look at the basic functions on the MicroPython language for graphics M5Stack. The color value is specified as 24-bit integers, 8-bit color. For example: 0xFF0000 is red. Use only the upper 6 bits of the color component value. The following constants are defined colors, and can be used as arguments colors: BLACK, NAVY, DARKGREEN, DARKCYAN, MAROON, PURPLE, OLIVE, LIGHTGREY, DARKGREY, BLUE, GREEN, CYAN, RED, MAGENTA, YELLOW, WHITE, ORANGE, YELLOW, PINK. The following font constants are defined and can be used as arguments to font: FONT_Default, FONT_DefaultSmall, FONT_DejaVu18, FONT_Dejavu24, FONT_Ubuntu, FONT_Comic, FONT_Minya, FONT_Tooney, FONT_Small, FONT_7seg. 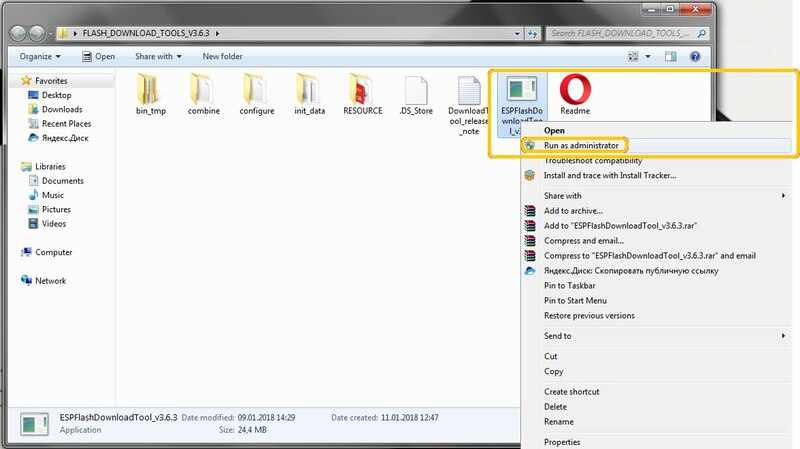 Also an unlimited number of options of fonts can be used from external files. lcd.lineByAngle(x, y, start, length, angle [,clr]) to draw a line in the point with coordinates x, y, long length, inclination angle and color clr. lcd.triangle(x, y, x1, y1, x2, y2 [,clr, fillcolor]) draw a triangle outline color clr, color fillcolor with coordinates x,y, x1,y1 and x2, y2. 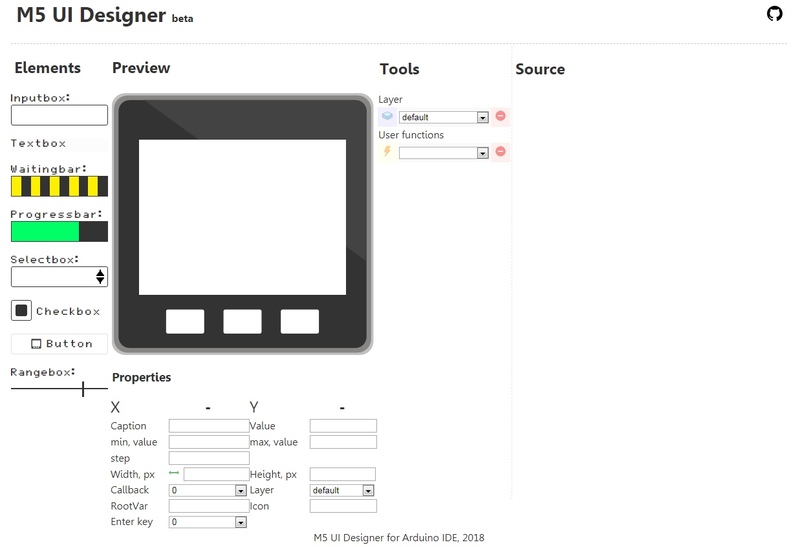 RIGHT - align text on the right side, LASTX - continue from the last values of the X coordinates, you can also use the view offset LASTX + n. For Y: CENTER - align center, BOTTOM - align the bottom of the screen, LASTY - continue from the last values of the Y coordinates, so you can use the view offset LASTY + n.
Characters from a CR (0x0D) - clears to EOL, LF (ox0A) - continues to the new line. 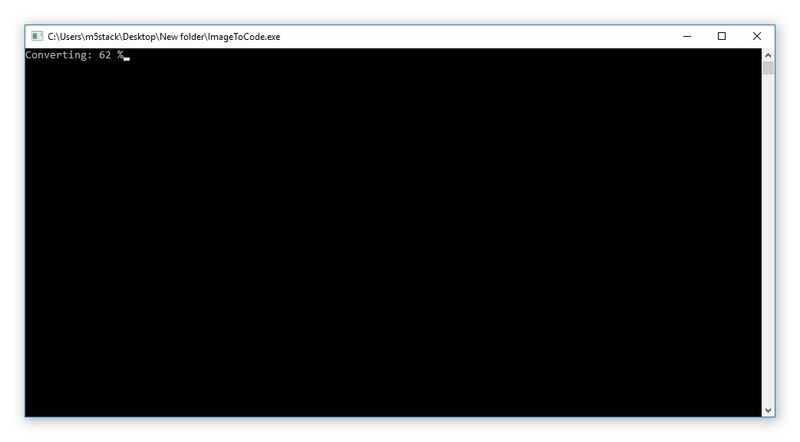 lcd.image(x, y, file [,sc, tp]) - displays an image from a file with coordinates x, y. 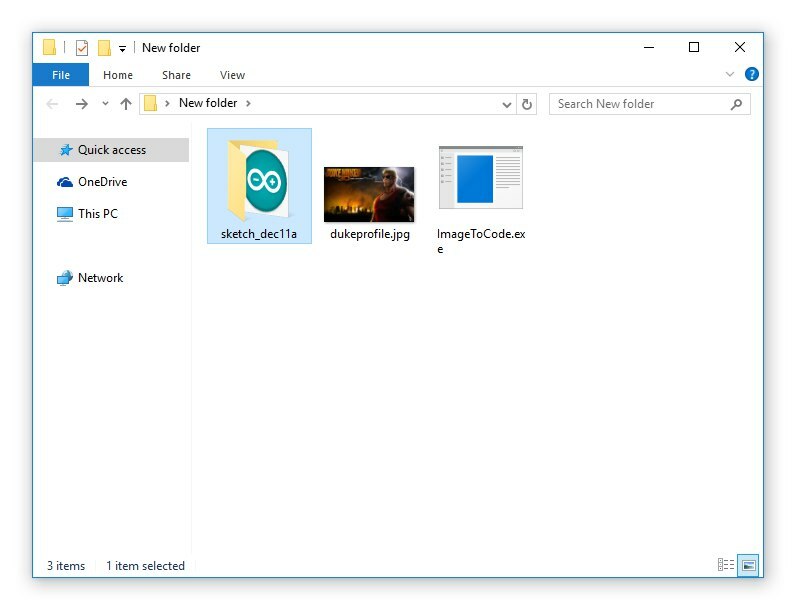 Supported image types are BMP and JPG. 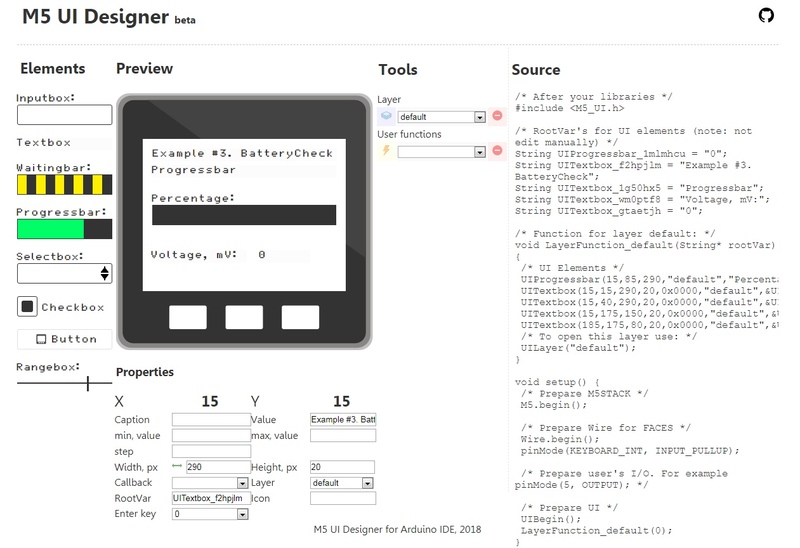 Use constants lcd.CENTER, lcd.BOTTOM lcd.RIGHT, and Boolean operators such as X&Y. X and Y can be negative numbers. Scaling JPG: value sc may be within the range of integers from 0 to 3; If sc > 0, then the image will be scaled according to the formula 1 / (2 ^ sc), etc. (1/2, 1/4 or 1/8). Scaling of the BMP: value sc may be within the range of integer number from 0 to 7; If sc > 0, then the image will be scaled according to the formula 1 / (sc + 1). 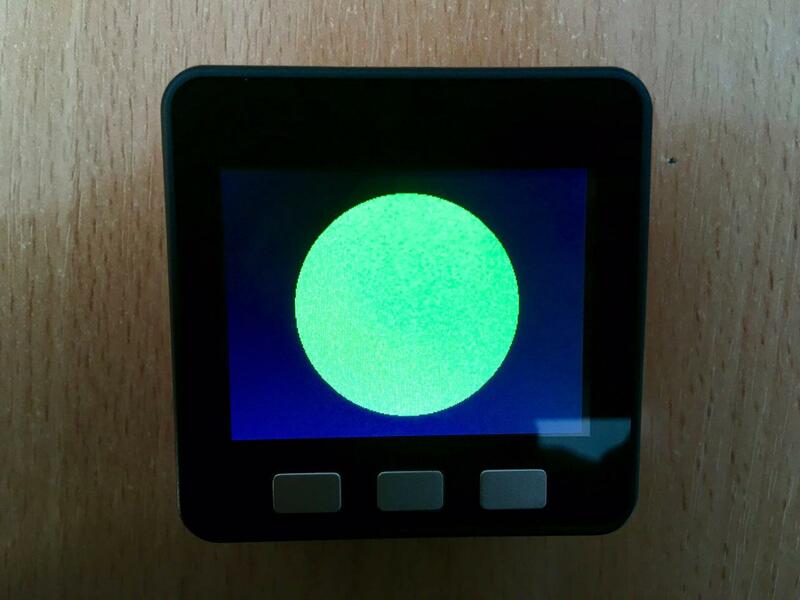 lcd.hsb2rgb(hue, saturation, brightness) - convert HSB to RGB. Returns a 24-bit integer color value. Arguments: tint (fractional) - any number, half that number is subtracted from it to create a fraction between 0 and 1. This fractional number is then multiplied by 360 to get the angle of hue in a color model in the HSB system. Saturation (fractional), takes value in the range from 0 to 1.0. Brightness (fractional), takes value in the range from 0 to 1.0. 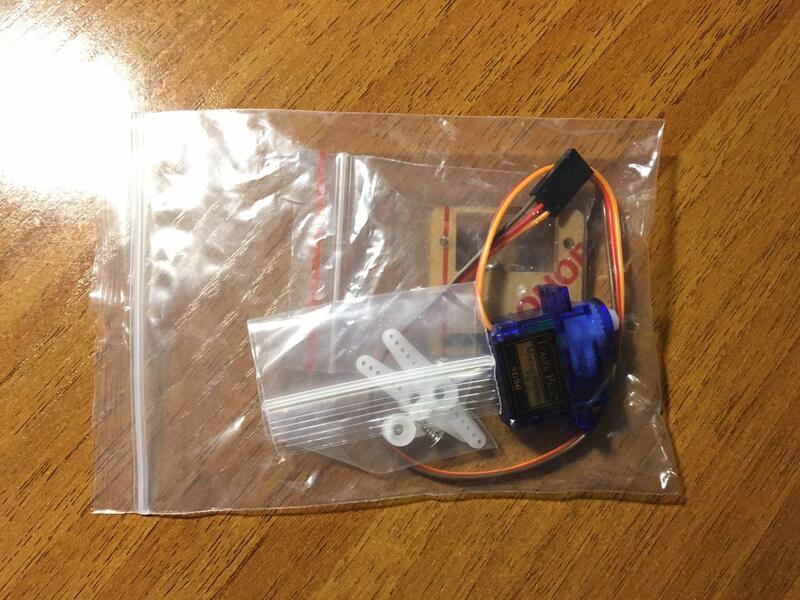 The device is located in the good, pleasant to touch plastic case (Fig. 1). 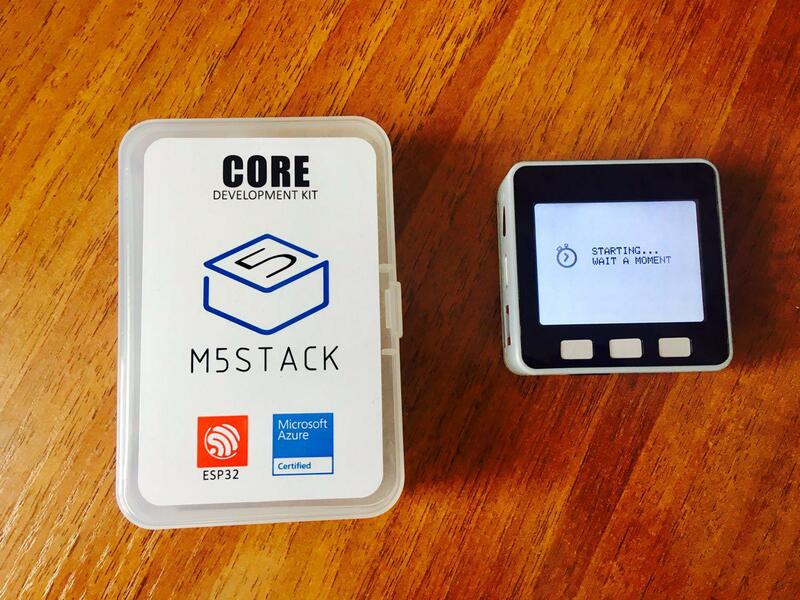 On the box there is a label showing the device name, the logo, the microcontroller manufacturer's emblem (we'll talk about him later), and the icon showing that the device is certified by the cloud service Microsoft Azure. The reverse side has plastic feet. 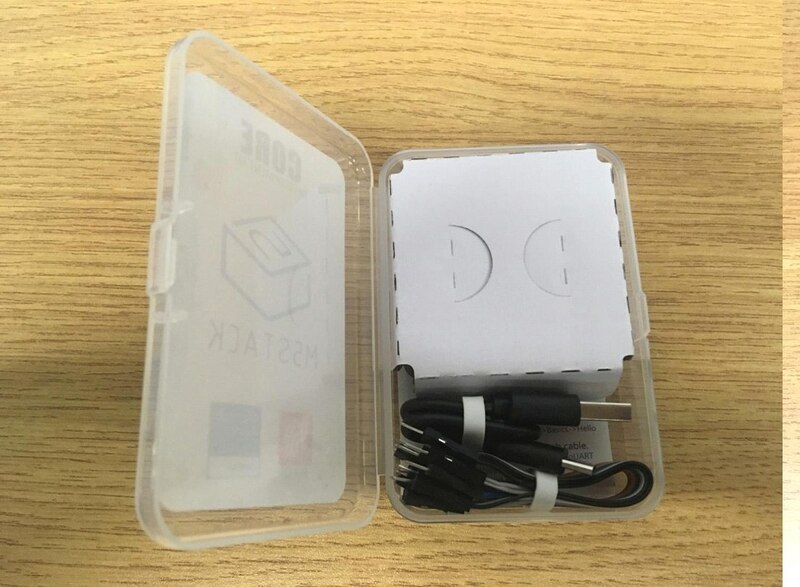 The case can be closed tightly with the plastic latch and provides some protection against the impact of external negative factors. Opening the case (Fig. 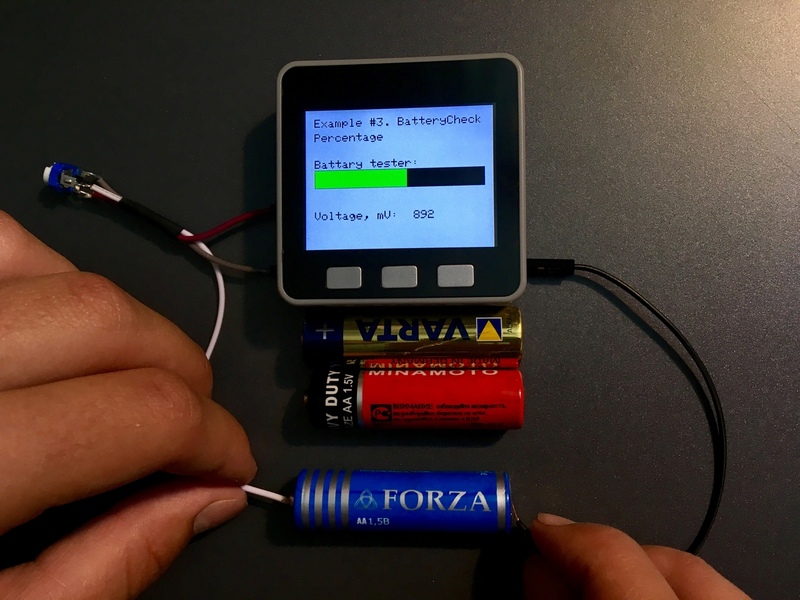 2) you feel the smell of a new device and wish to extract the contents (Fig. 3). 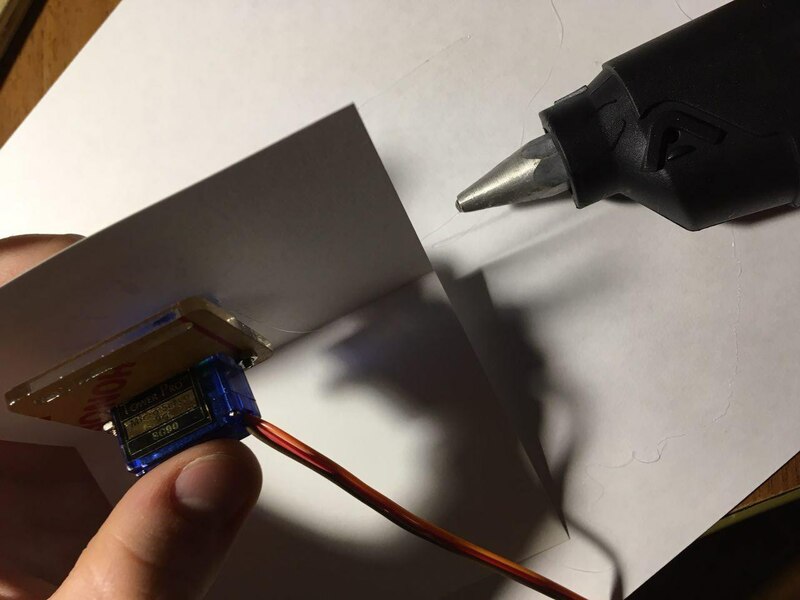 There is a cover at the top of the cardboard, under which the device is hidden (Fig. 4, 5). 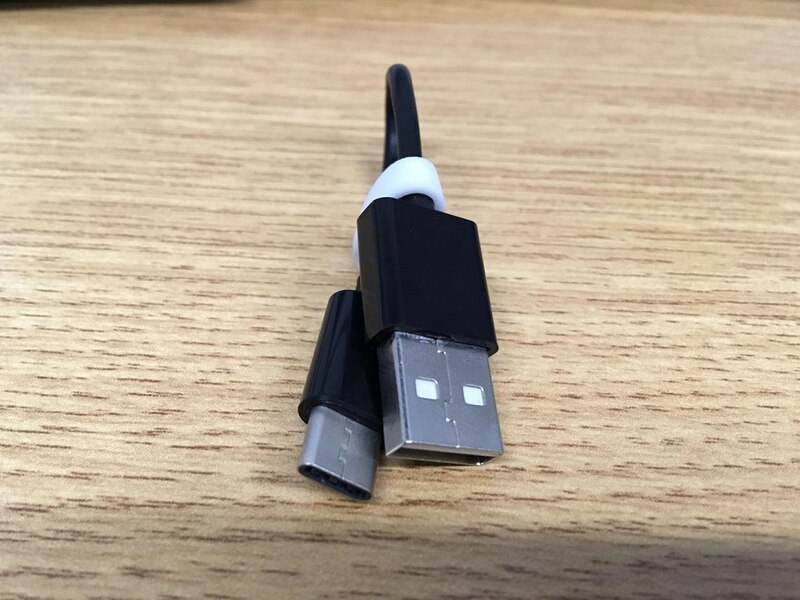 There are also two USB cables-C (Fig. 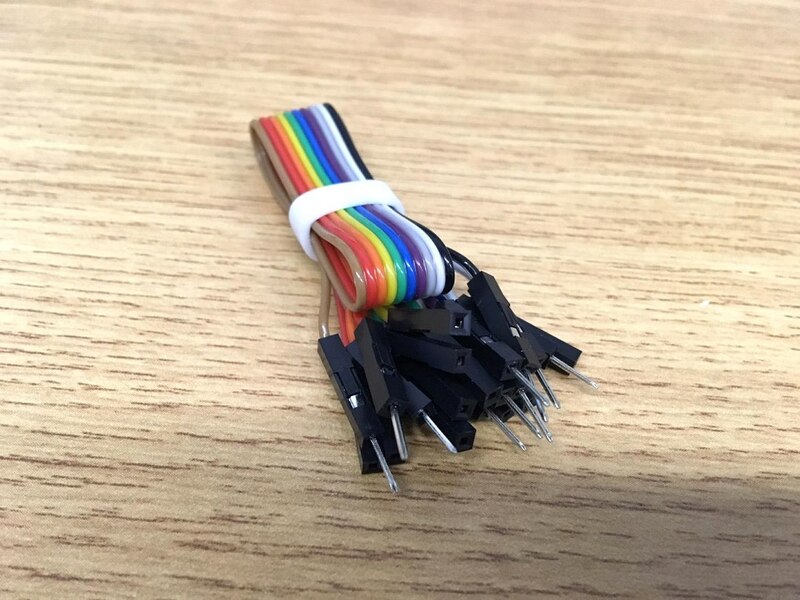 6) and colored wires (Fig. 7) on the bottom. Also the bottom has user manual and stickers. 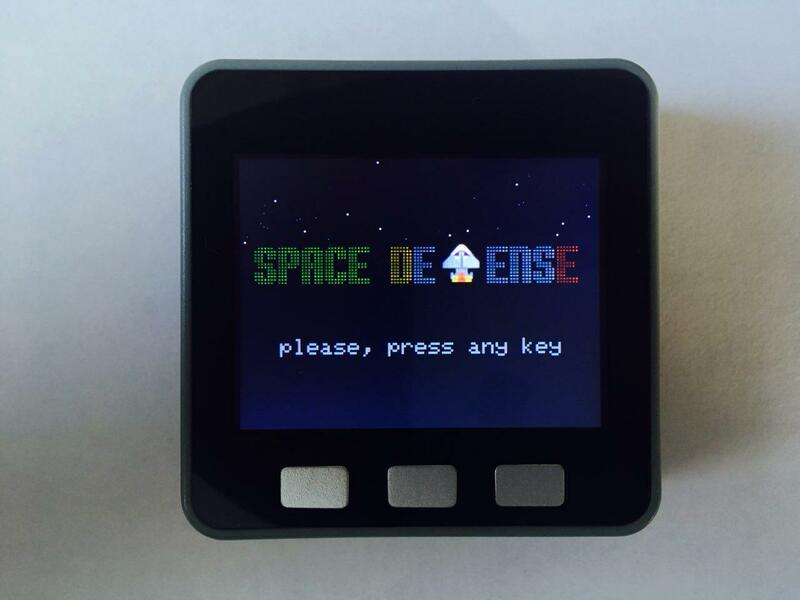 The device has a compact body (5 x 5 x 17 cm). 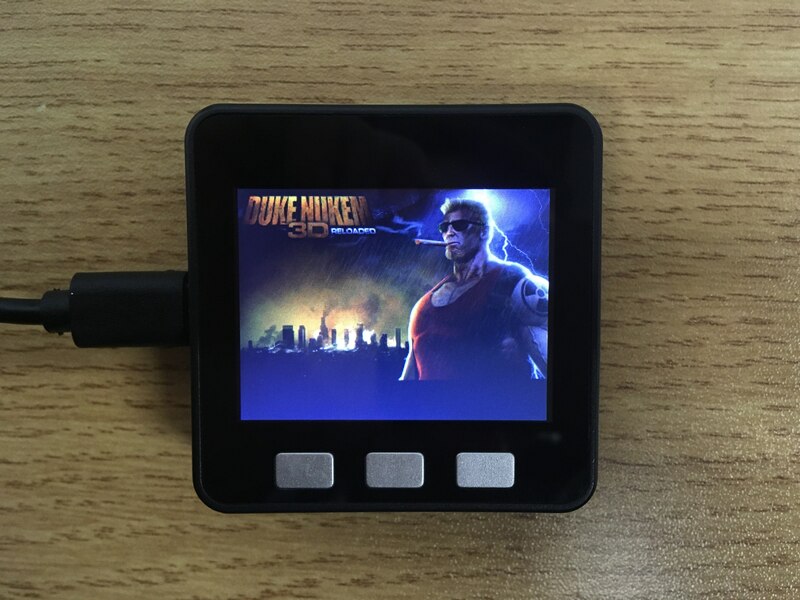 In the figure 4 it we can see that the front panel has three buttons and color TFT display with a resolution of 320 x 240 pixels. There is a watt speaker and bus ports I / o on the right side (Fig. 8) . 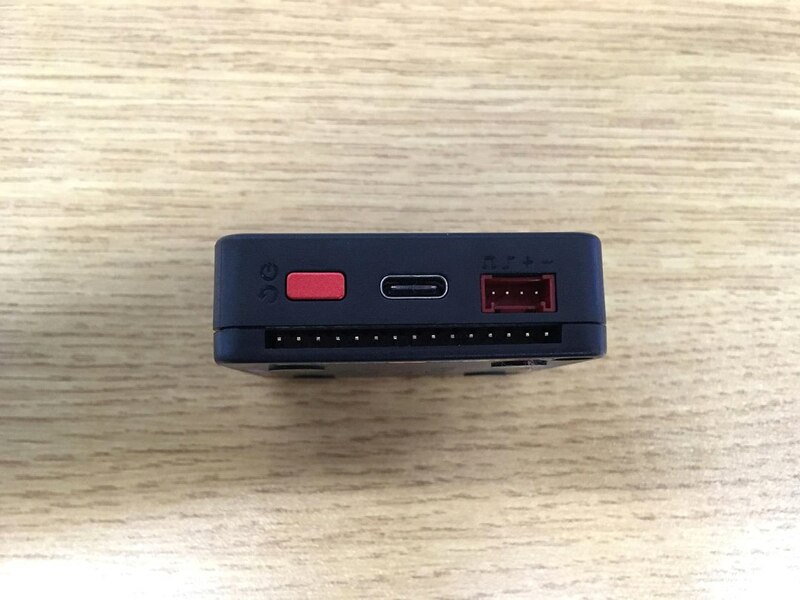 On the left one there are power button, USB type-C, I2C connector, and bus I / o (Fig. 9). On the bottom there is a slot for TF memory card, bus I / o and the hole for the additional conductors (Fig. 10). At the top (Fig. 11) there is a sticker certifying that the device has successfully passed FCC certification, bus I / o as well as the hole for the additional conductors. On the opposite side of the roof (the final module) (Fig. 12) there are the device logo, four magnetic feet, two screw holes and four labels with captions of relevant contacts in the tires. If you remove the cover (Fig. 13), the first thing you see is the bus I / o 2 for 15 and the sticker on the housing of the microcontroller with the image of the list of contacts. There is a connection between this tire and peripheral modules that will be connected in future. 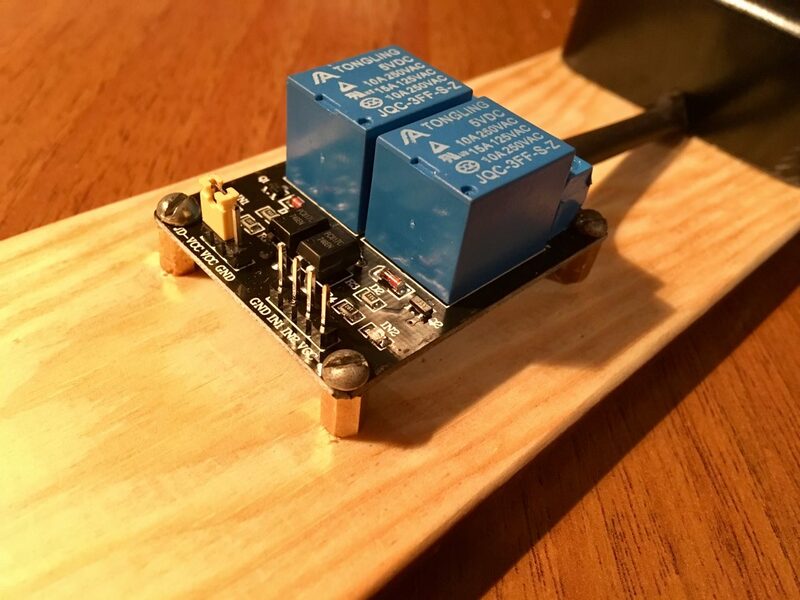 Board is located on the top of the antenna for the integrated wireless interfaces of the microcontroller which provides a good gain. 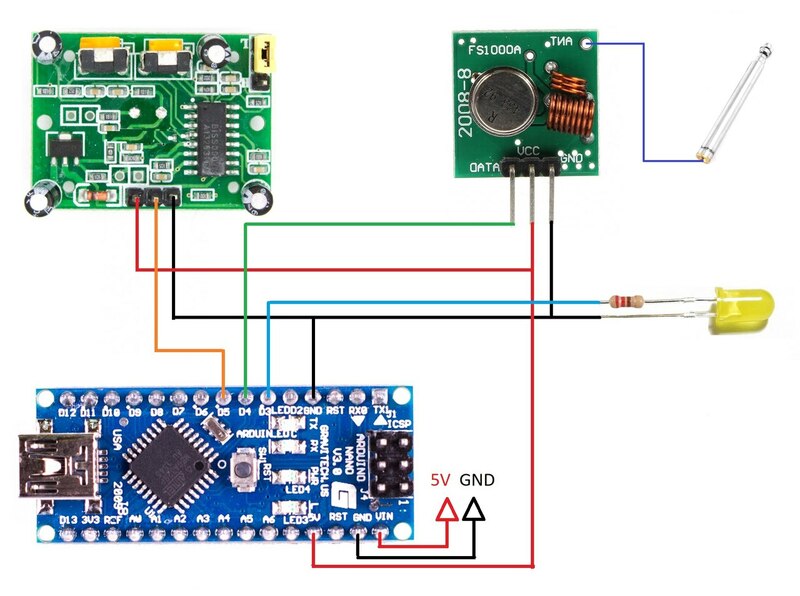 Board has features such as CP2104 chip (bridge USB-UART), NS4148 (audio amplifier), EA3036 (power controller), IP5306 (controller power supply from lithium batteries). The final module is covered with contacts. 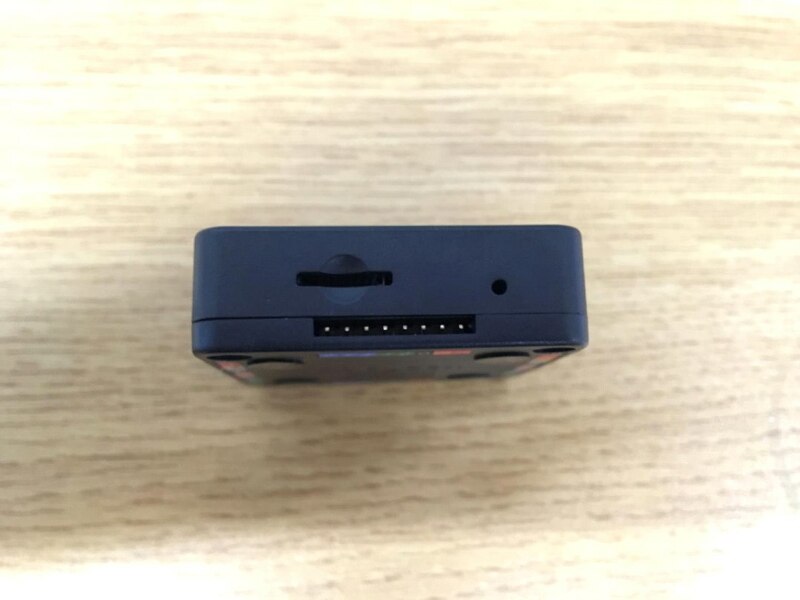 Under the circuit Board there is the battery voltage of 3.7 V and a capacity of 150 mAh, which is enough for approximately 30 min Autonomous operation of the device without additional modules. 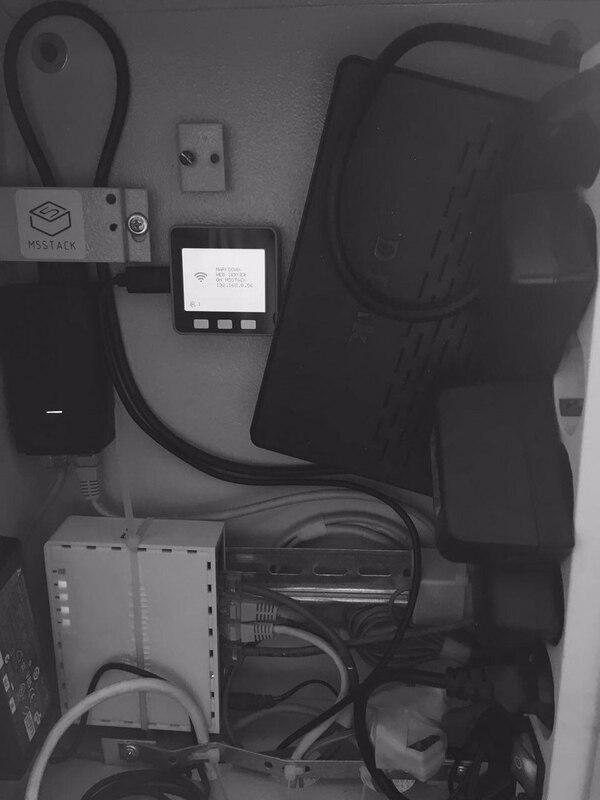 The modules are connected to the dock. For occasions requiring a particular reliability, you can use M2 screws that are not included in the base set . 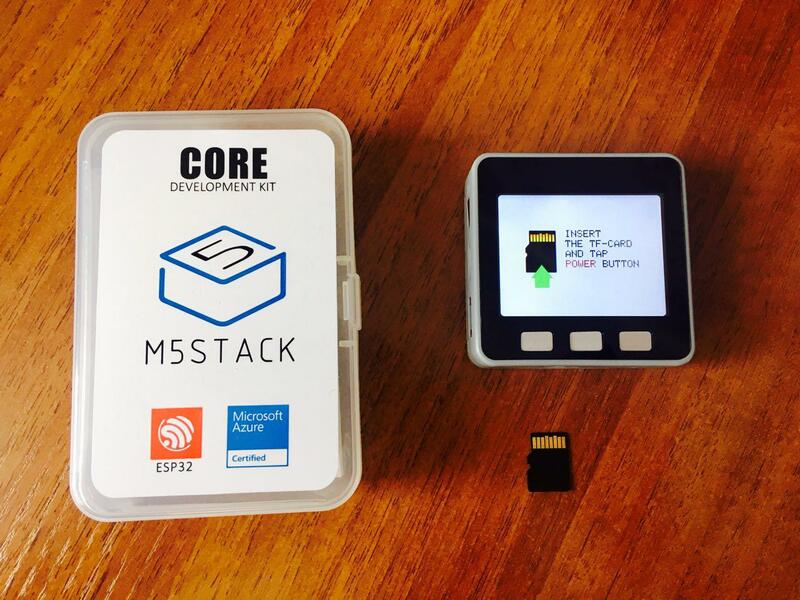 Today, M5Stack is the best analog Arduino and Raspberry on the market, which could not inherit from their deficiencies. 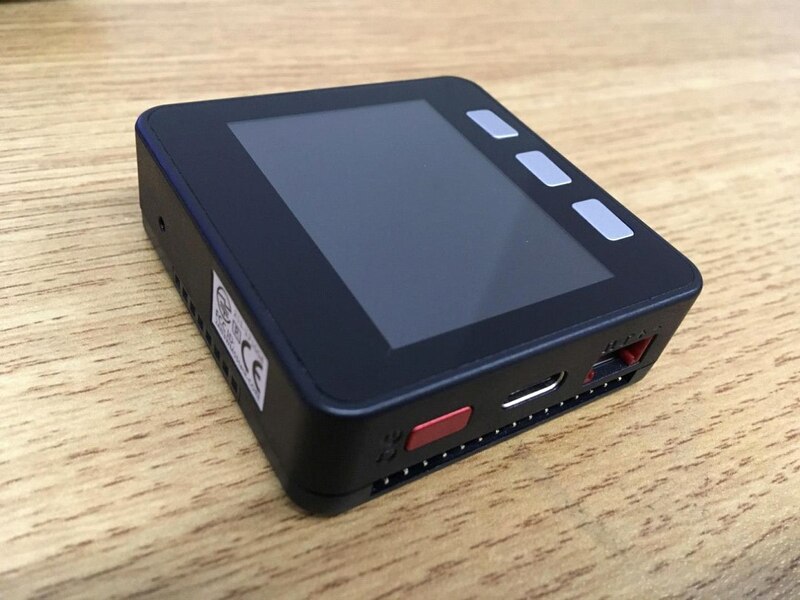 Ergonomic body with all the necessary controls, autonomy, easy compatibility with embedded systems, the lack of a huge number of wires and poor contacts, the modularity - all this make the possibilities of this device unlimited.